It’s been a long time coming, but last week, I finally went to the DMV to buy temporary license plates for the weekend. 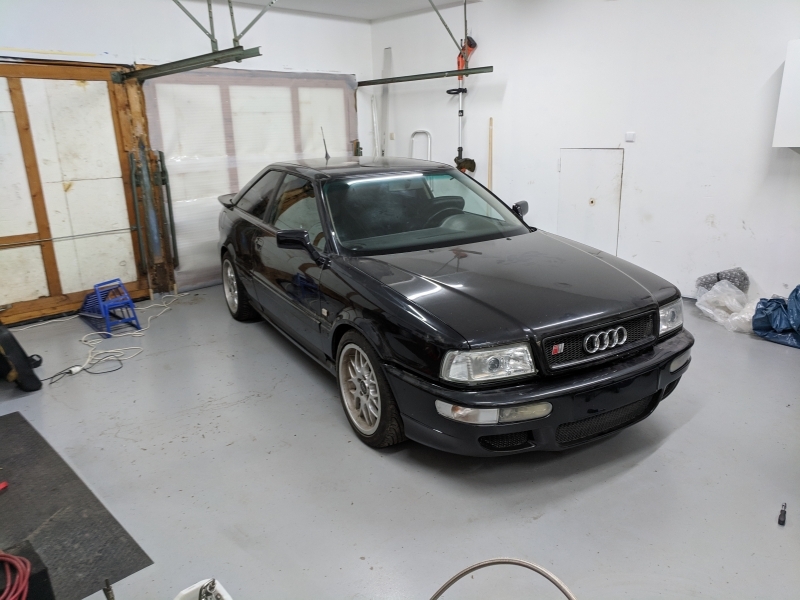 I was really excited to try the car as I’ve never driven an S2. 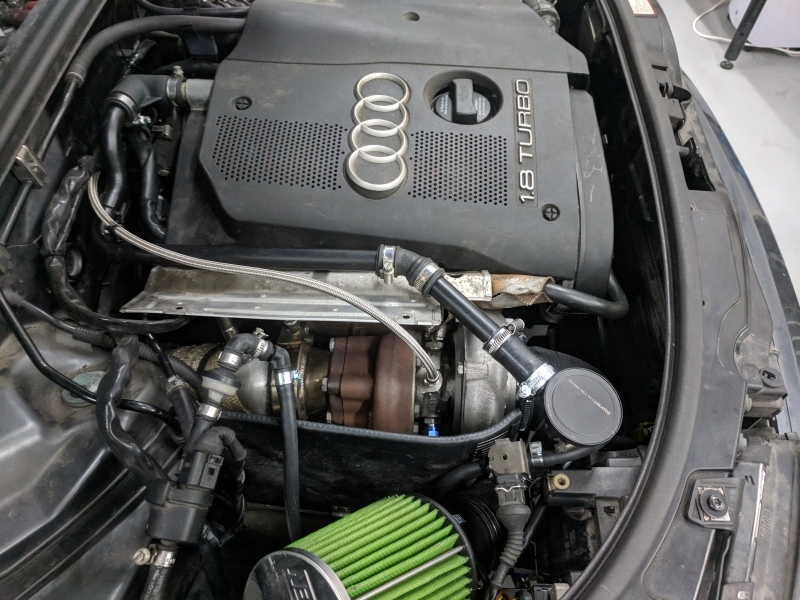 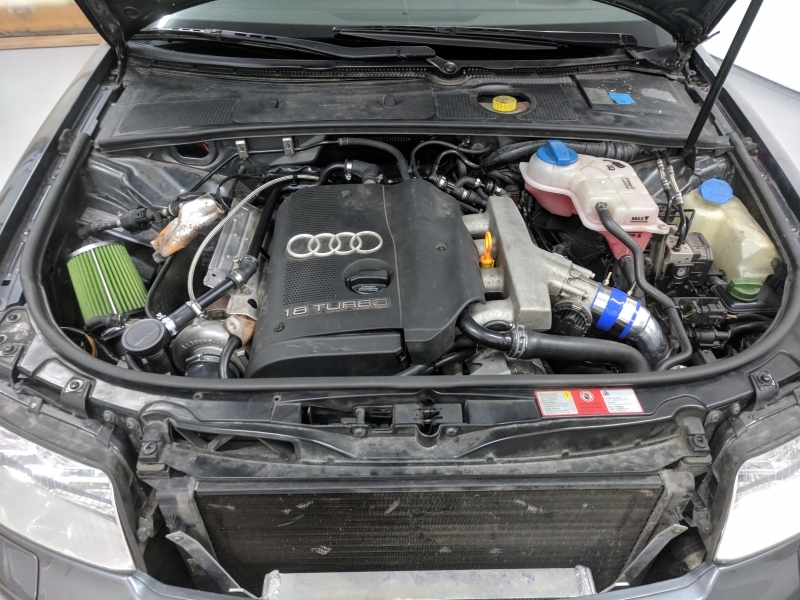 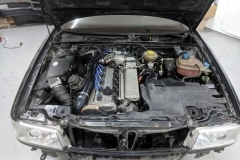 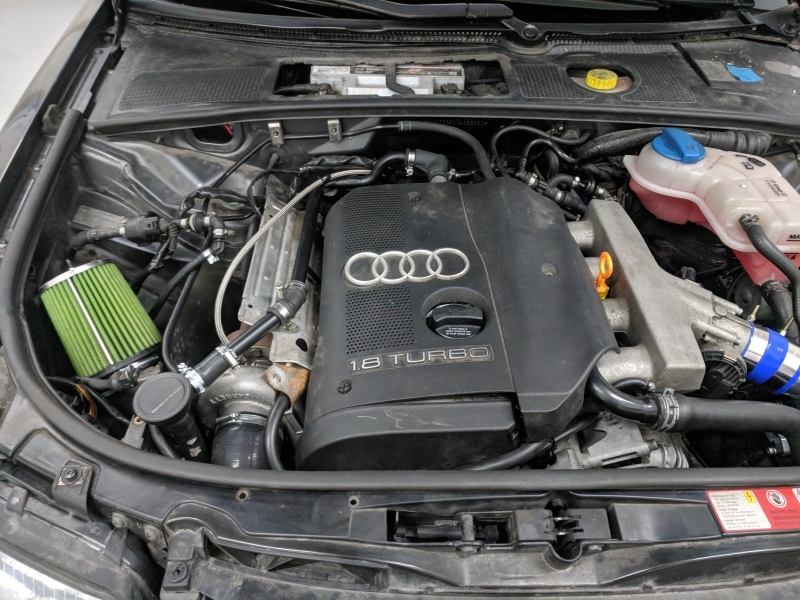 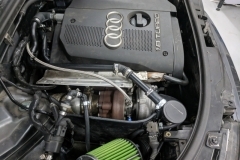 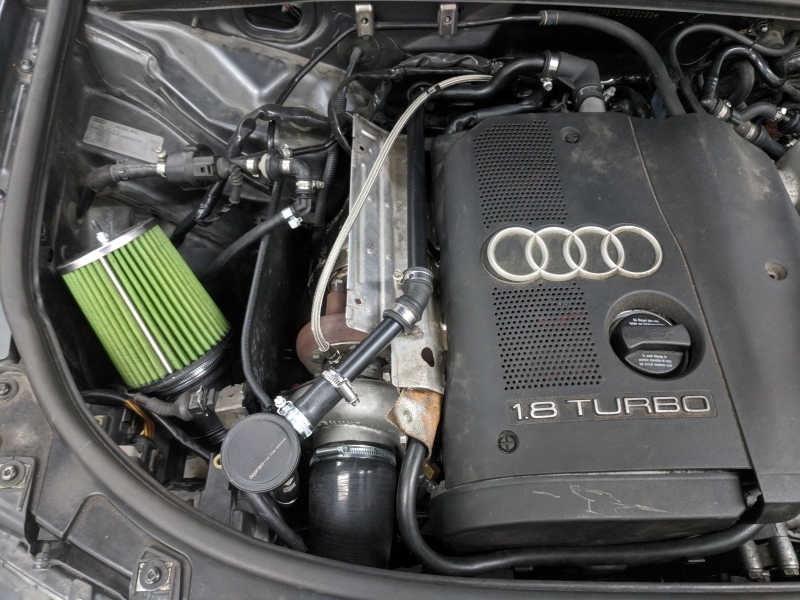 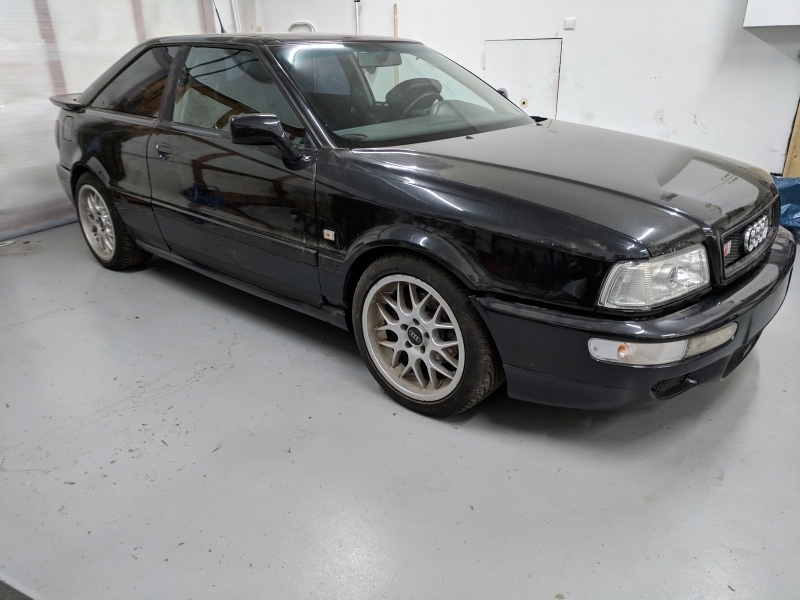 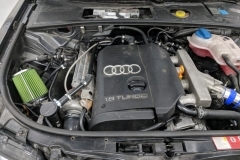 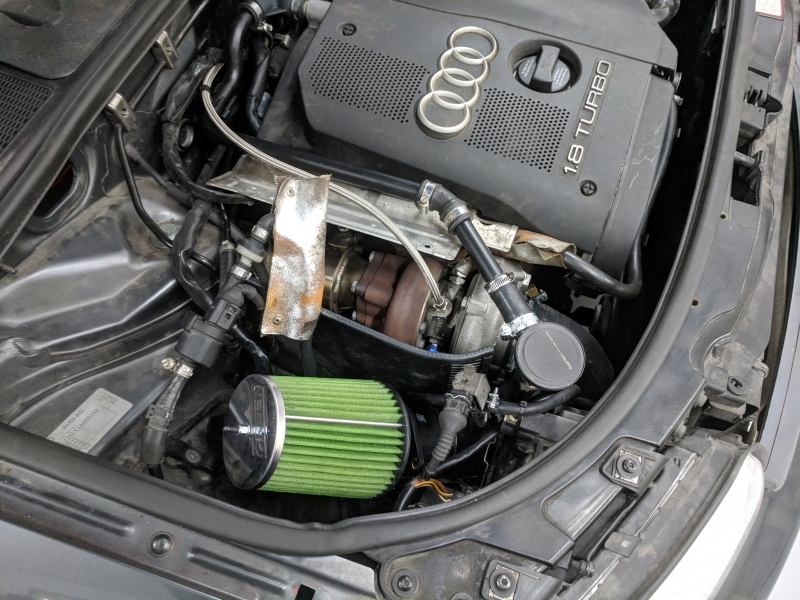 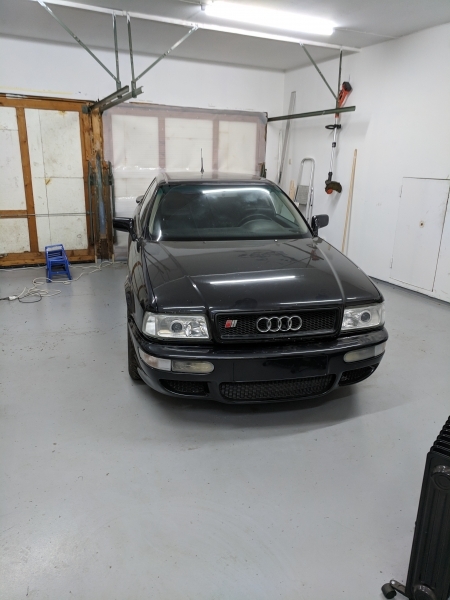 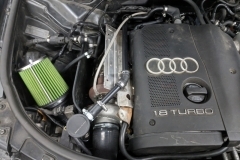 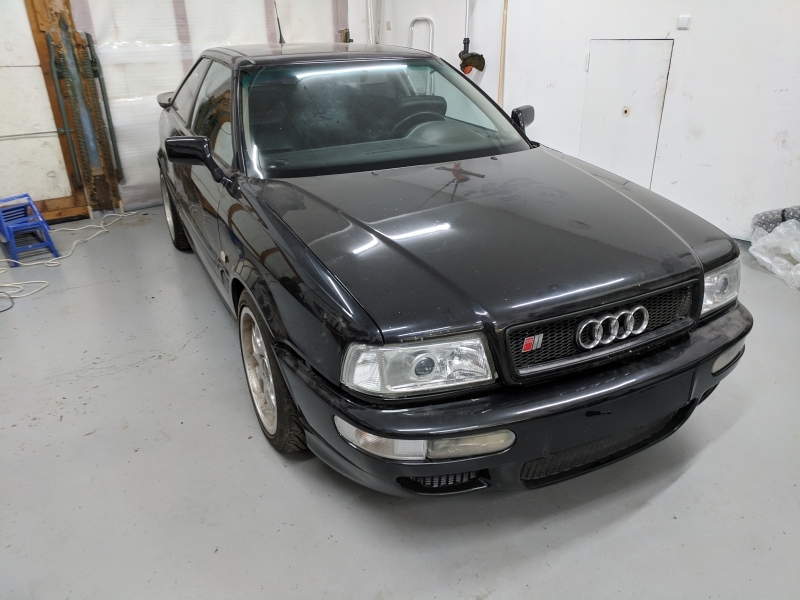 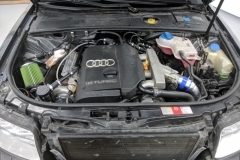 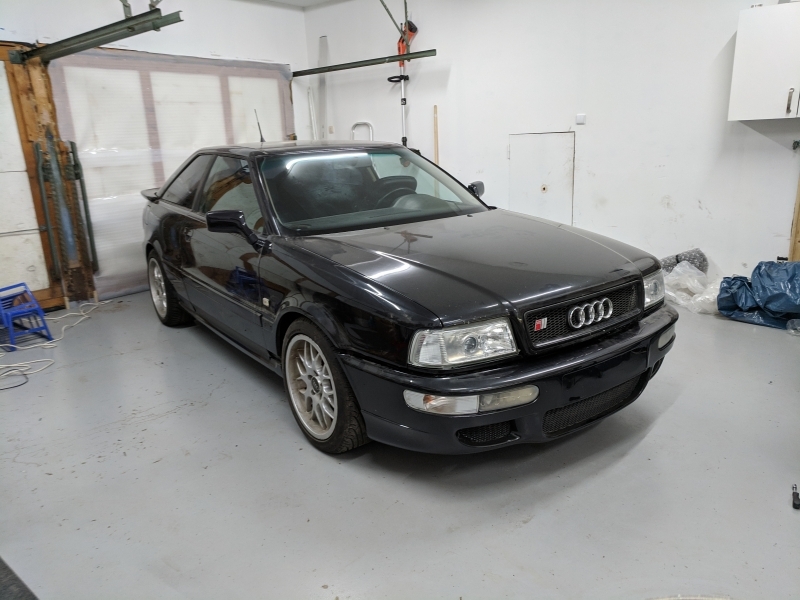 I did drive a 2.8 V6 Audi 80 a couple of years ago so I expected it to be somewhat similar to that one, just slightly more powerful. 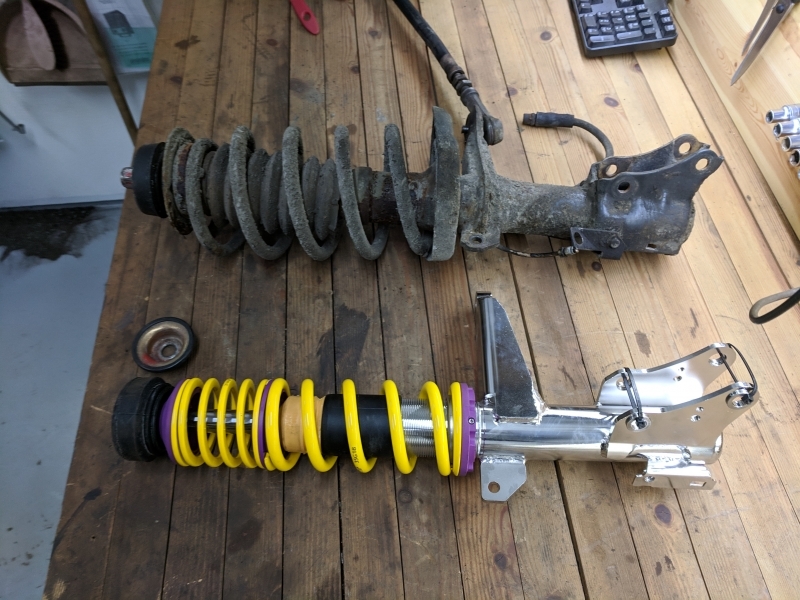 Boy was I surprised! 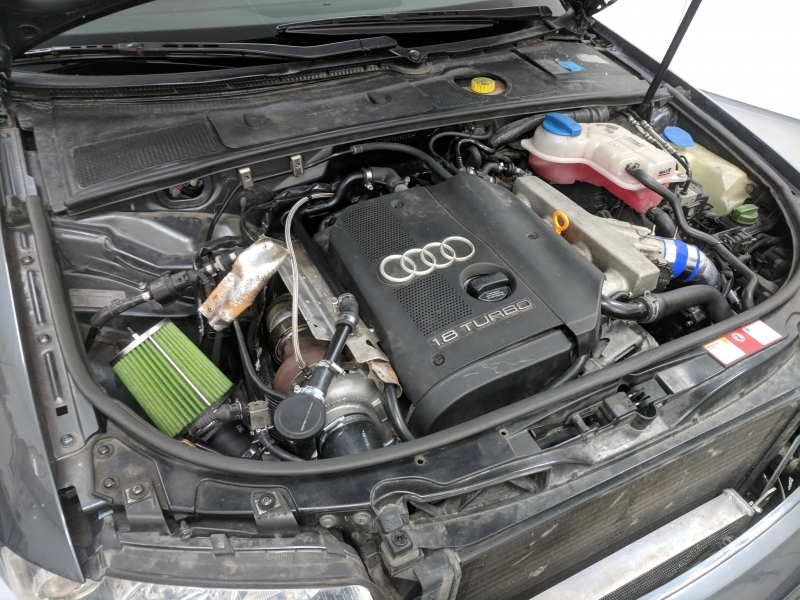 It’s nothing that can compare to the sound of the Audi I5 2.2l turbo engine when it comes on boost 🙂 Almost everything worked flawlessly throughout the two days of driving, although there were some issues. 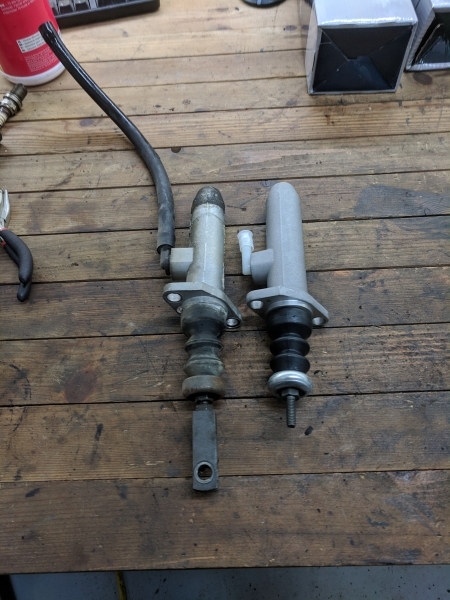 The driver side door latch kept slipping out of its second stage notch and the horn didn’t work but these were easily fixed. 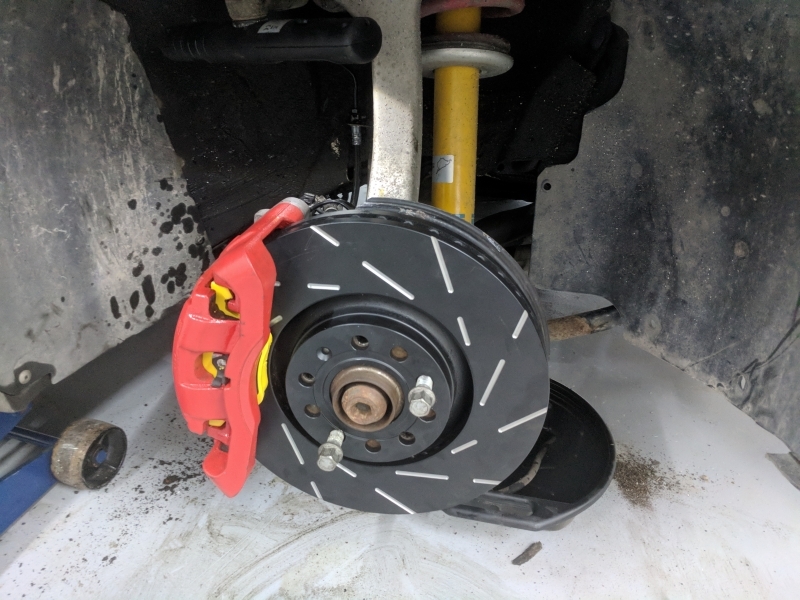 The main issue were the brakes. 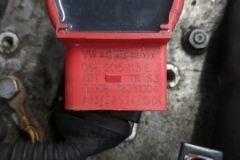 Since I bought the car, the red brake warning light has been flashing every time I turned on the ignition. 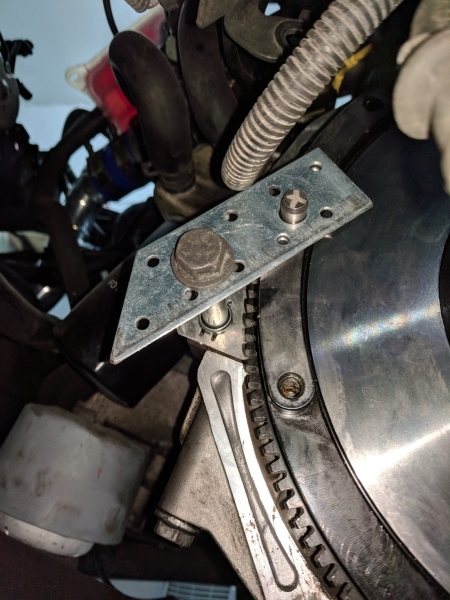 I thought this was because there were no pressure in the system and that it would fix itself once I got it driving a bit, but it unfortunately, it wasn’t that easy. 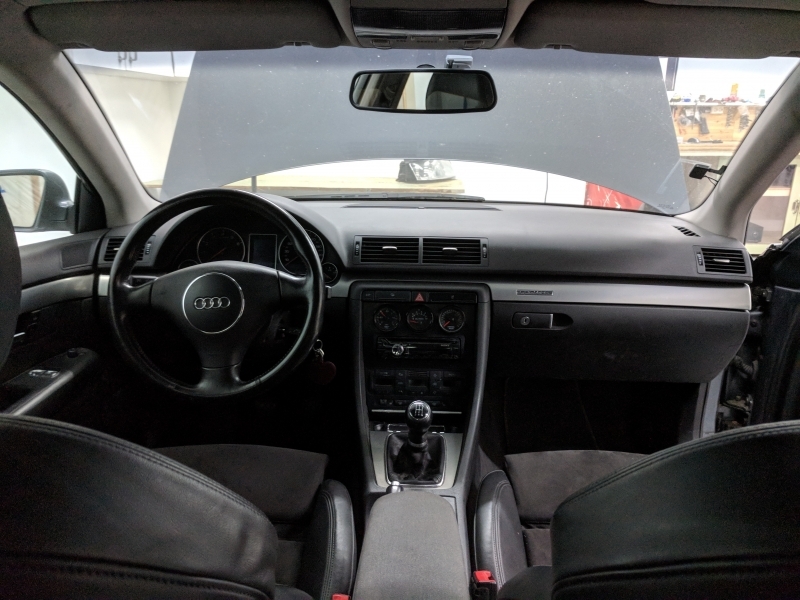 The warning light did go away once I got some revs on the engine, but it came back under hard braking or braking while the engine was idling. 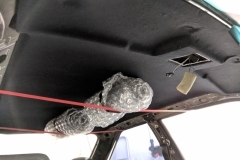 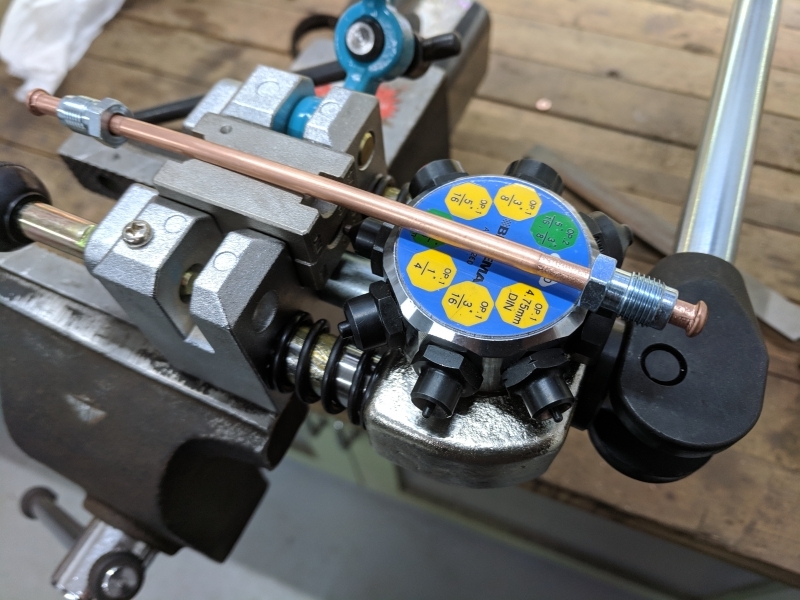 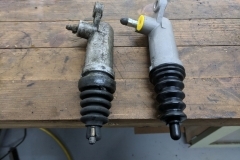 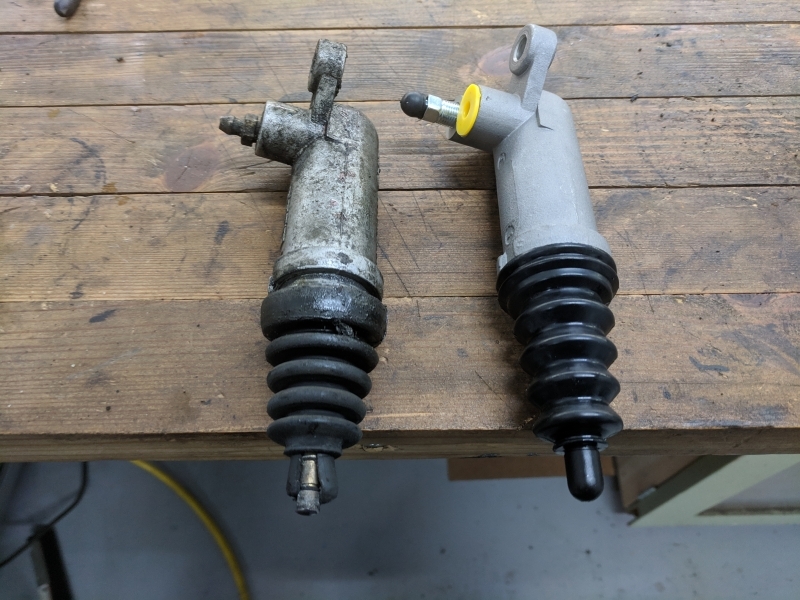 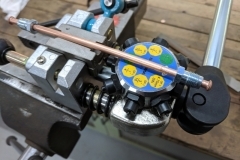 I deduced that it had to be the brake pressure accumulator, aka the Bomb, as the symptoms of a broken accumulator were exactly the same as I had. 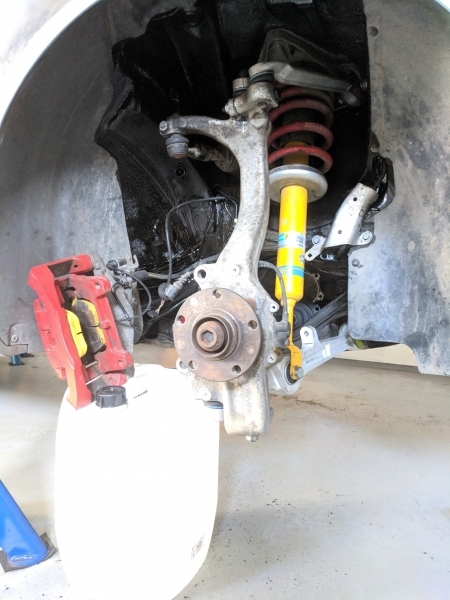 I also had an issue with the left rear brake getting stuck while driving so I decided to replace it. 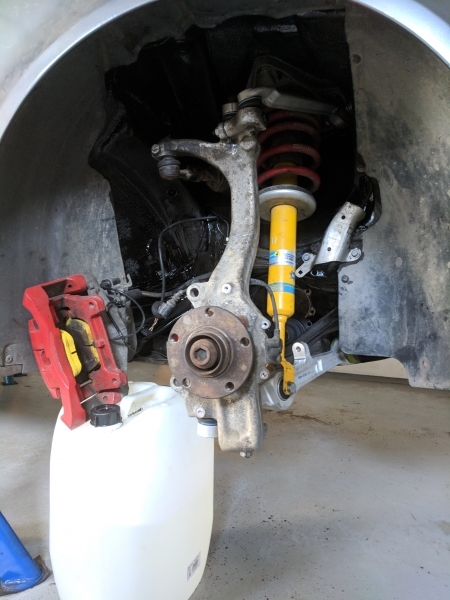 I’m not a hundre percent sure what got stuck so I’m gonna replace the disc, the pads, brake lines and fluids as well as refreshing the seals in the caliper using a rep-kit. 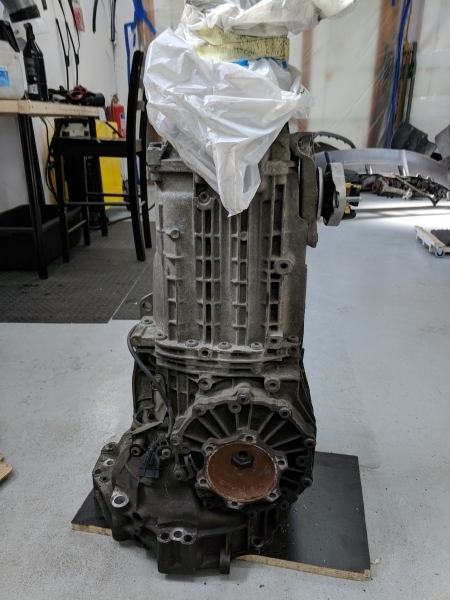 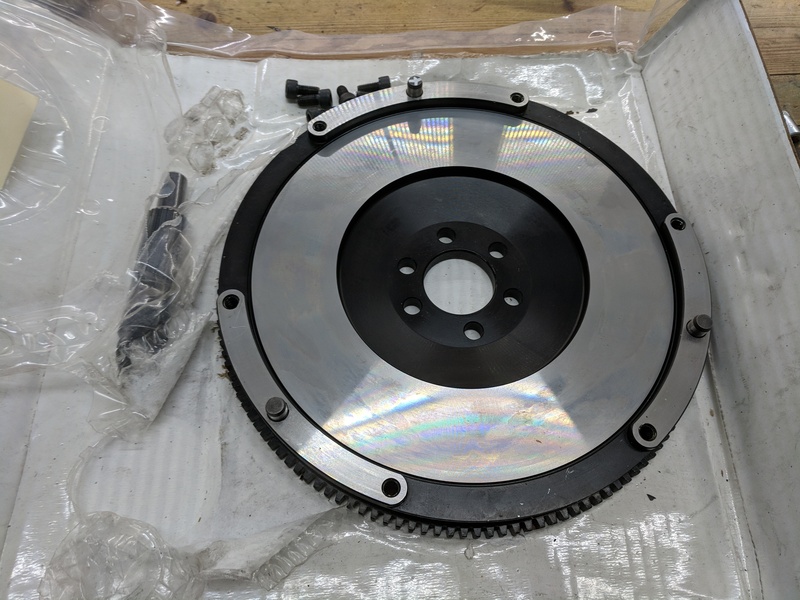 I’ve ordered new parts, so now it’s just to play the waiting game. 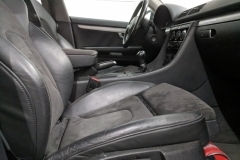 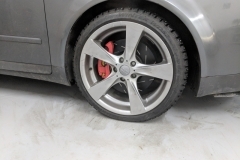 I’ll add some pictures of the car with the summer tires. 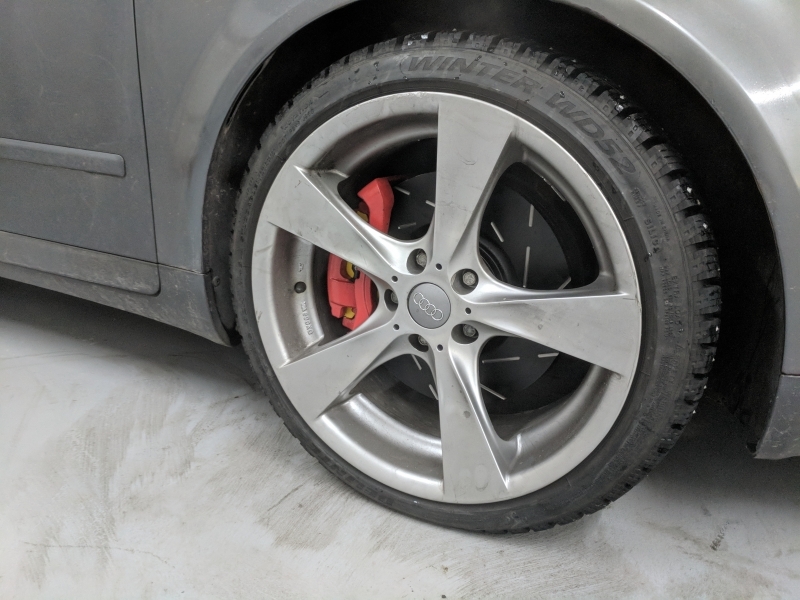 I’m still not sure if I like em though, might swap them for some other ones during the summer. 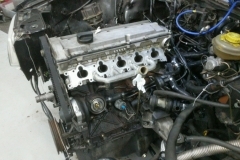 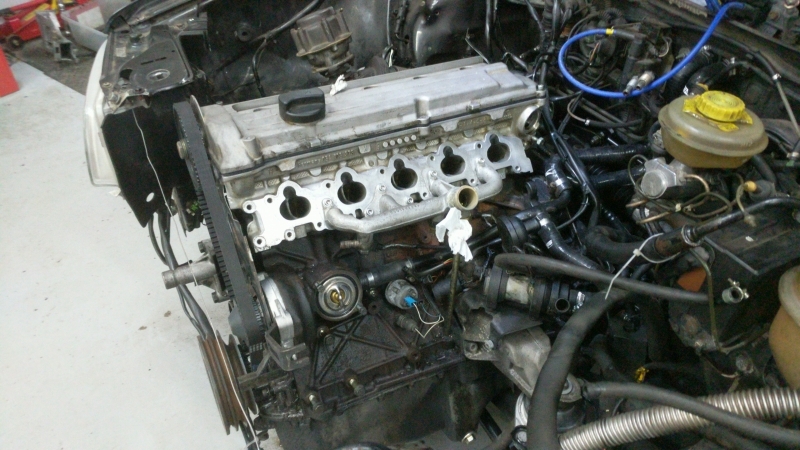 After completing the interior, it was time to go take a look at the engine. 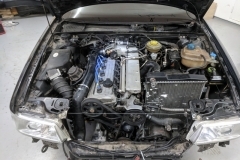 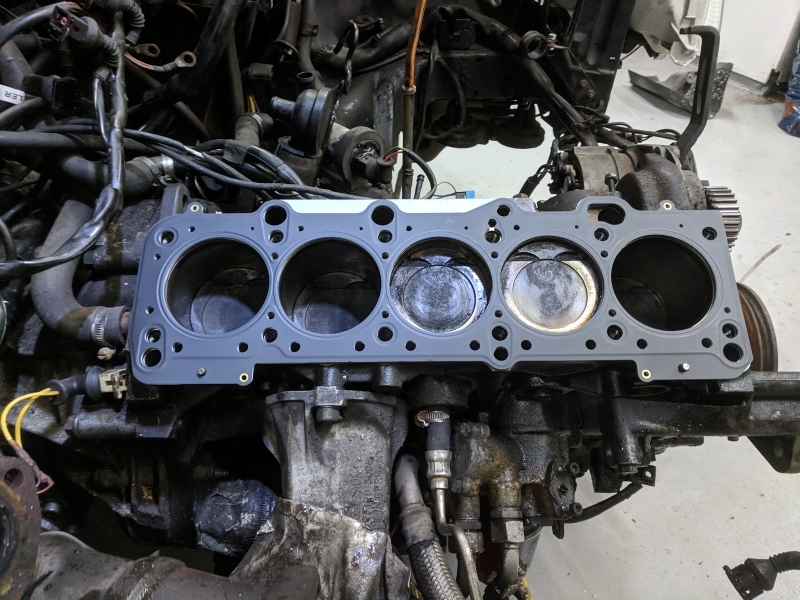 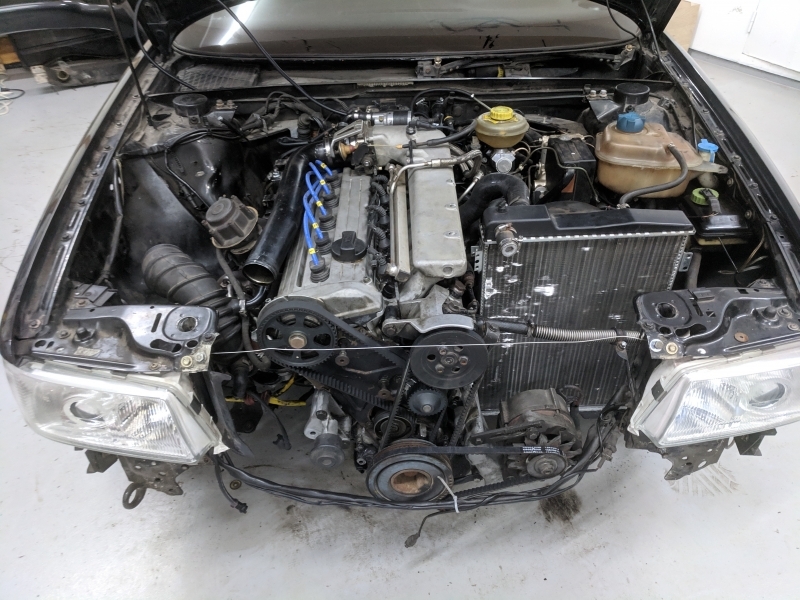 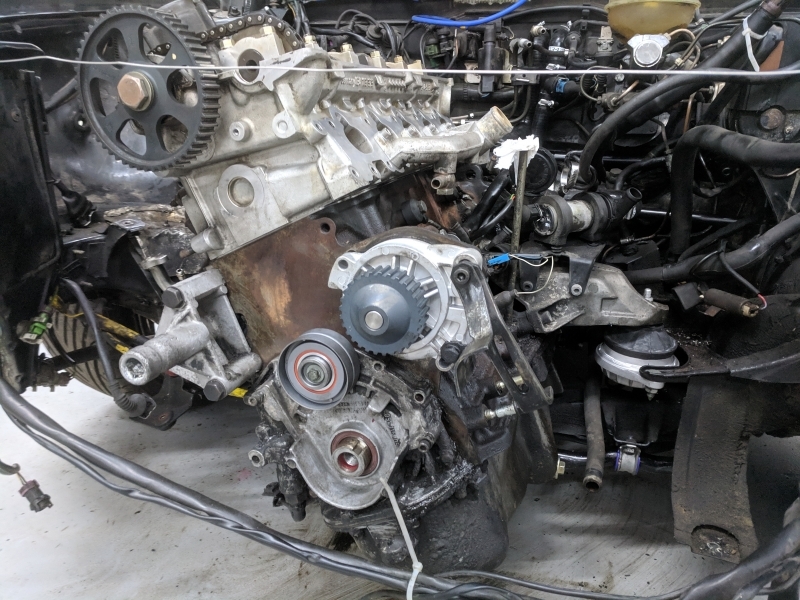 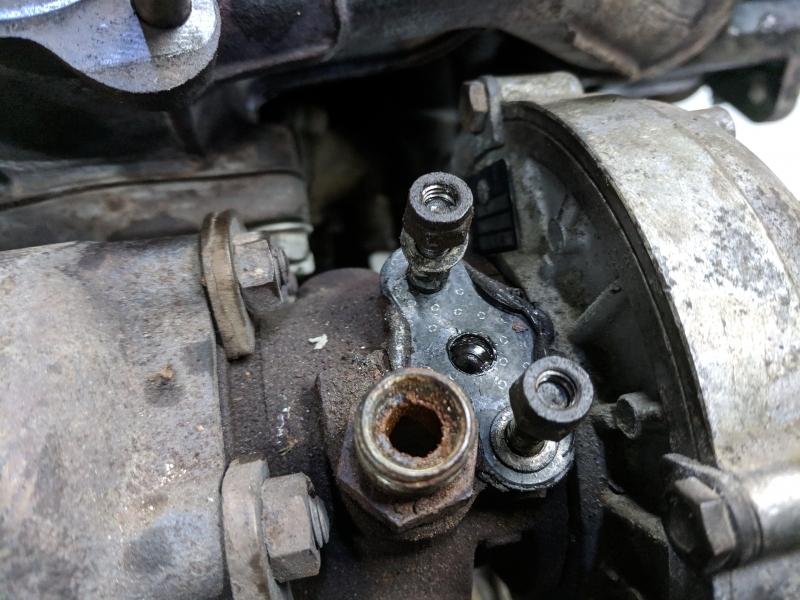 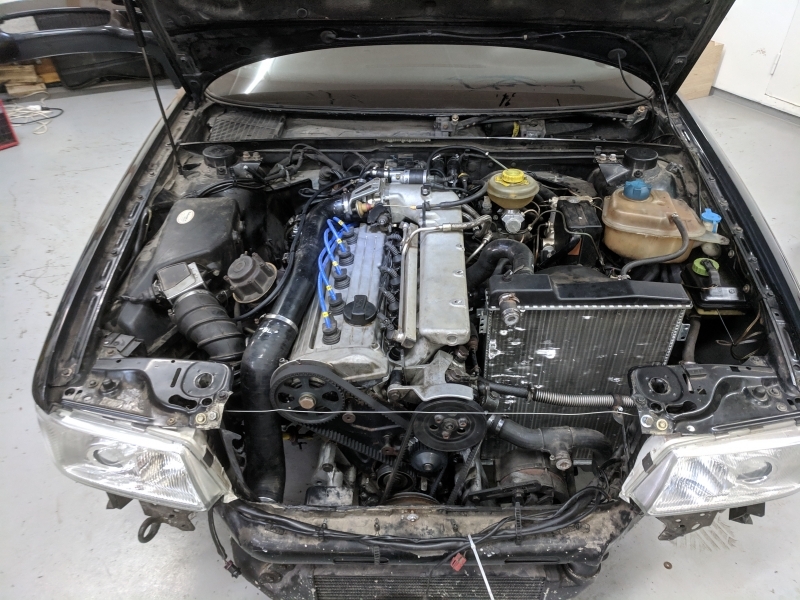 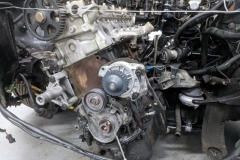 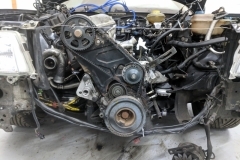 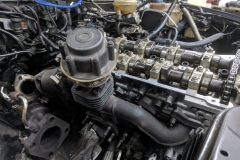 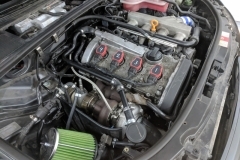 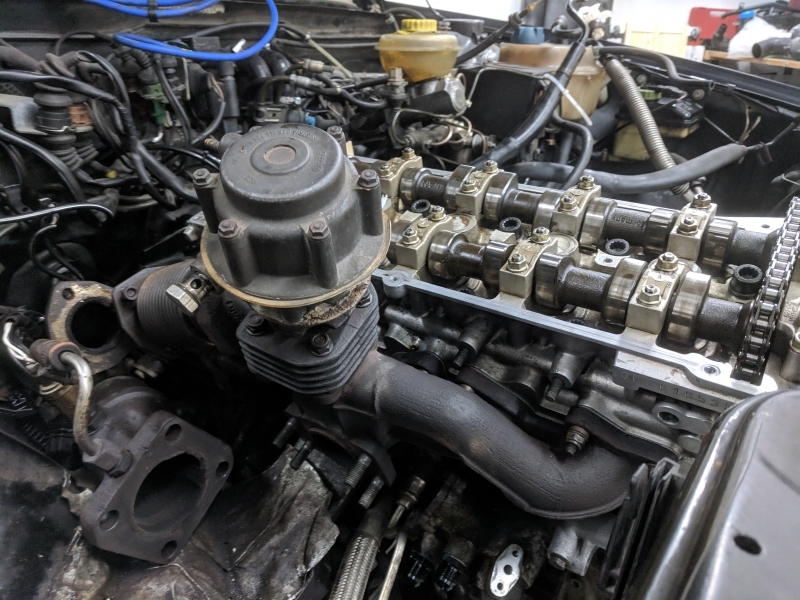 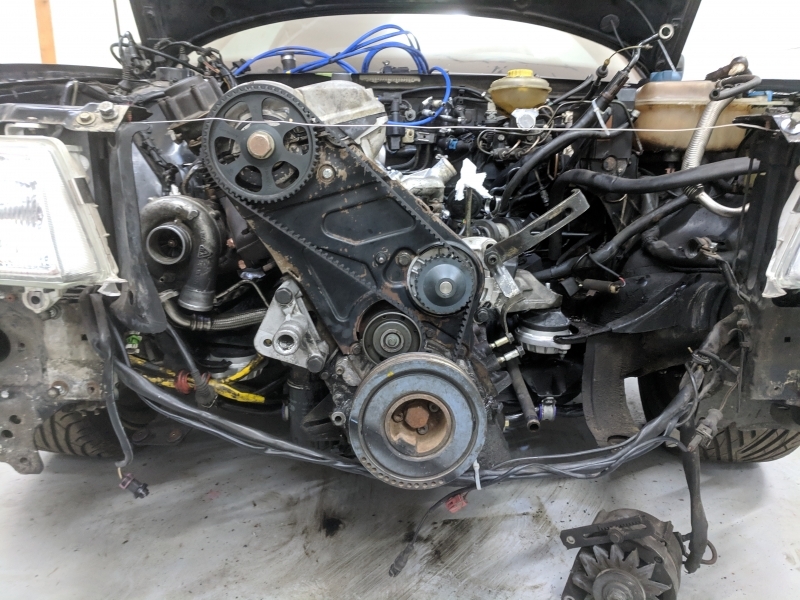 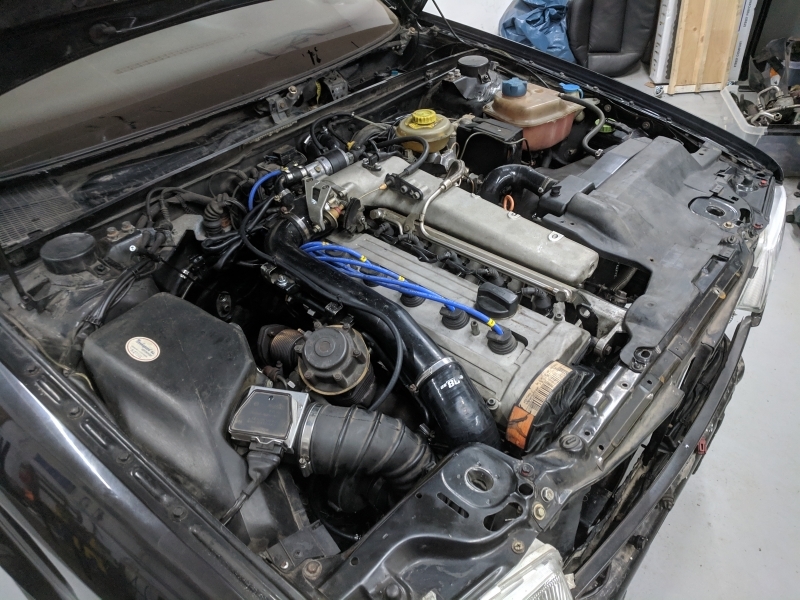 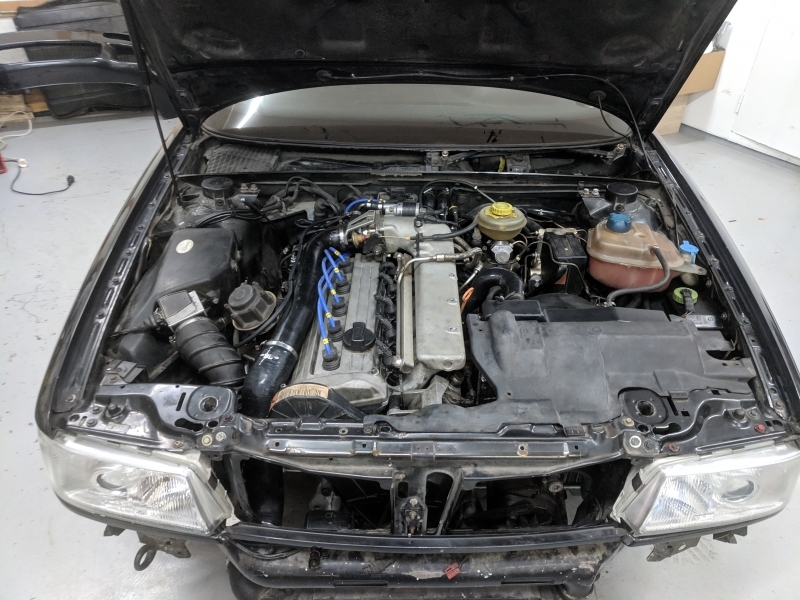 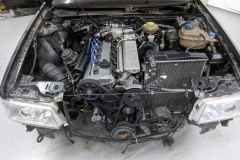 I had no information about when the cam-belt was last changed and I suspected the head gasket to be bad, so I decided to take the top off and change whatever I could find that looked old, broken or should be changed considering the car is almost 30 years old. 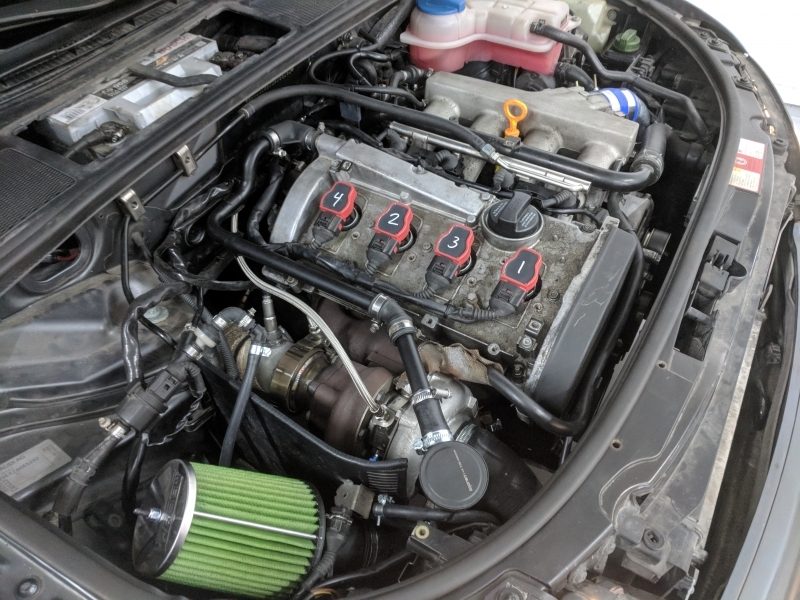 I’ll type a list of parts I changed and post some pictures. 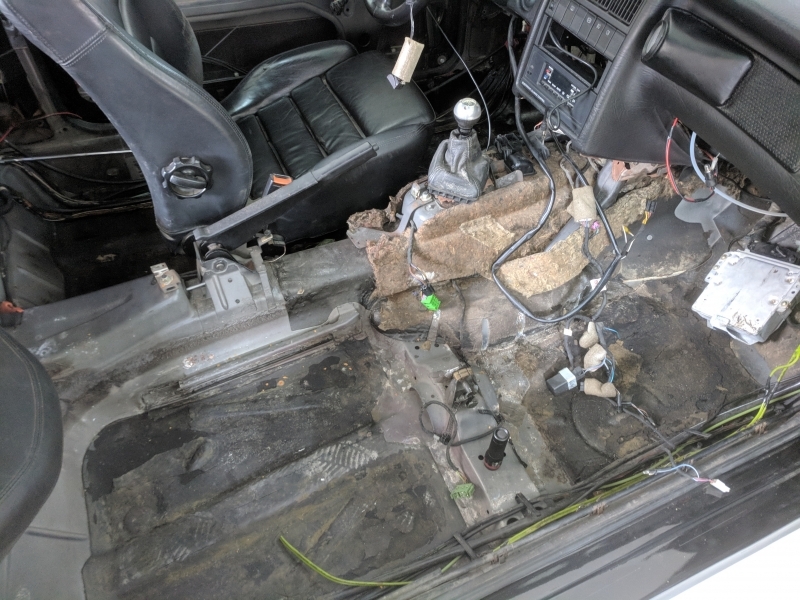 The job was easy enough, but I took my time and fixed whatever I saw necessary. 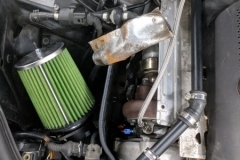 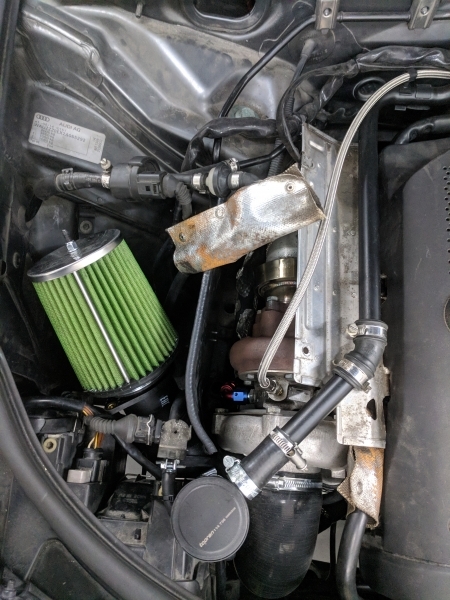 I also fitted the original air filter box, but I’m missing the heat shield towards the turbo and exhaust. 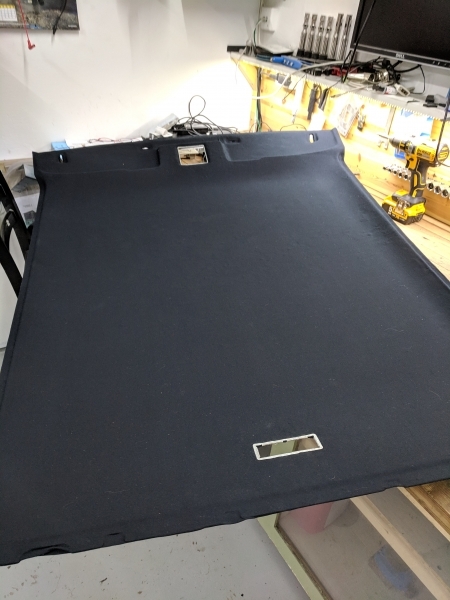 Guess I’ll have to make something. 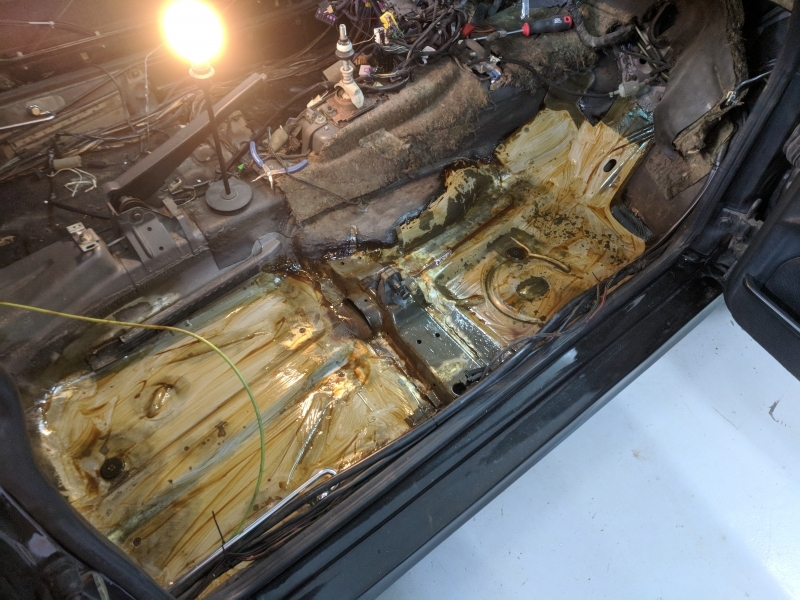 Good thing I decided to take the turbo water and oil lines of. 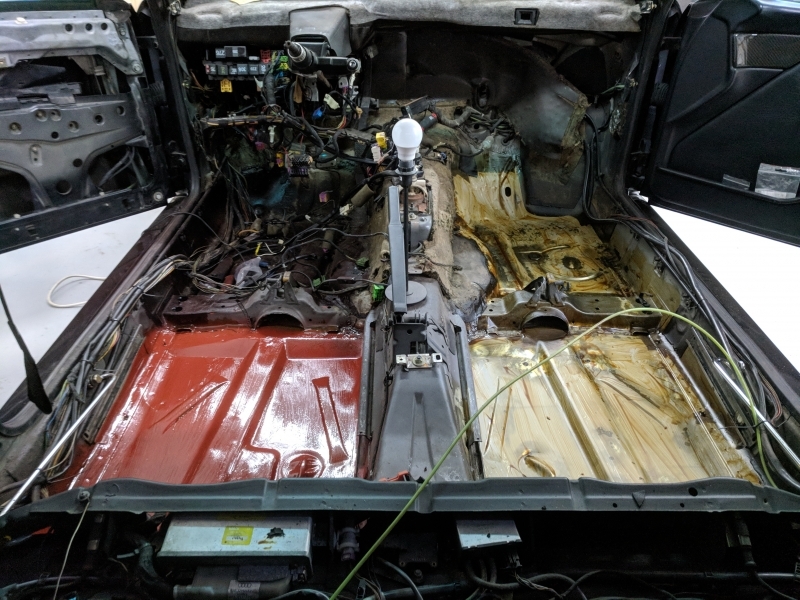 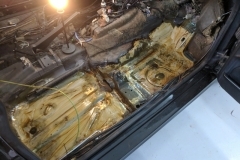 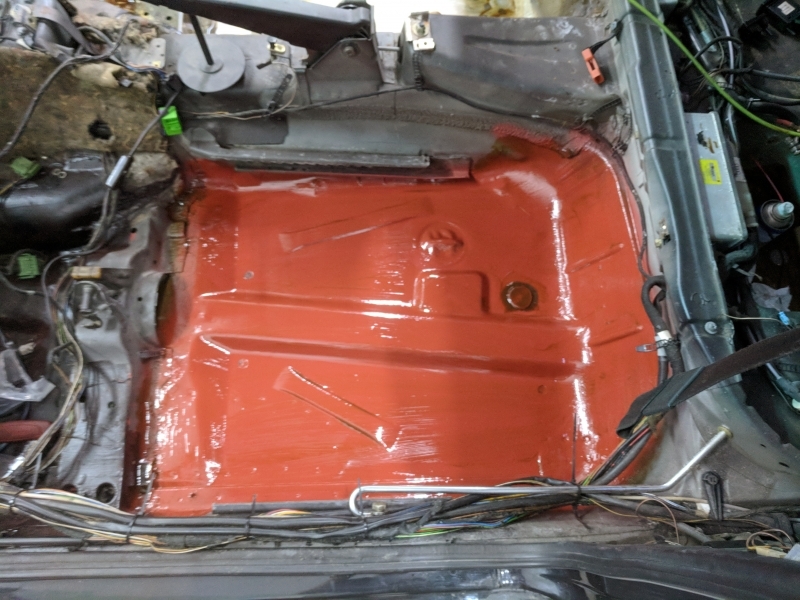 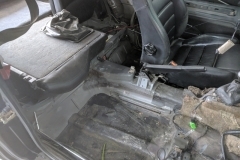 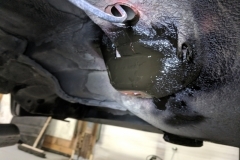 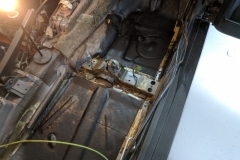 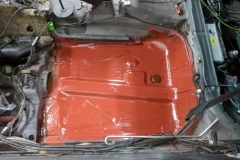 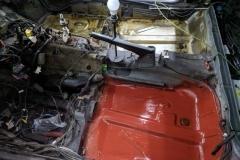 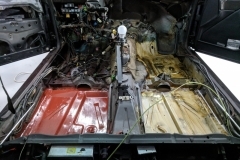 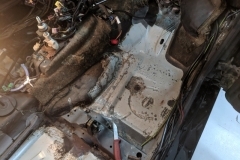 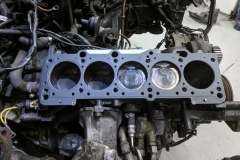 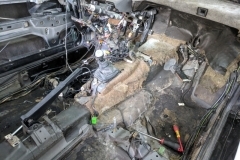 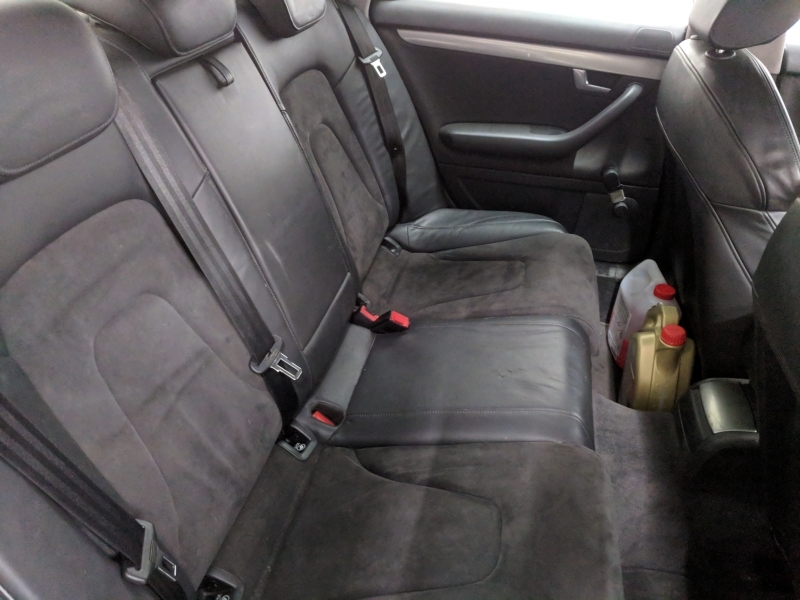 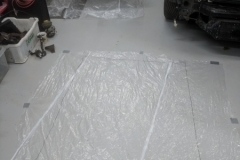 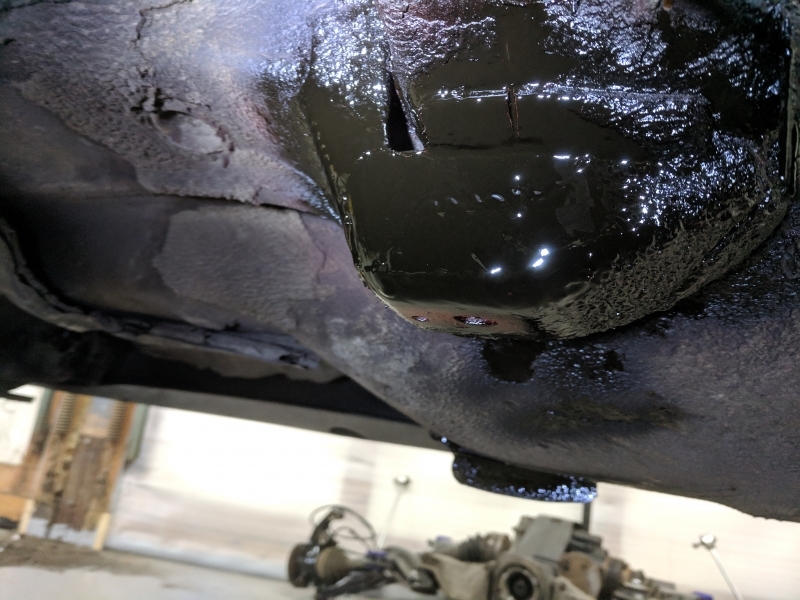 The last guy working on the car had used liquid gaskets, and applied too much.. 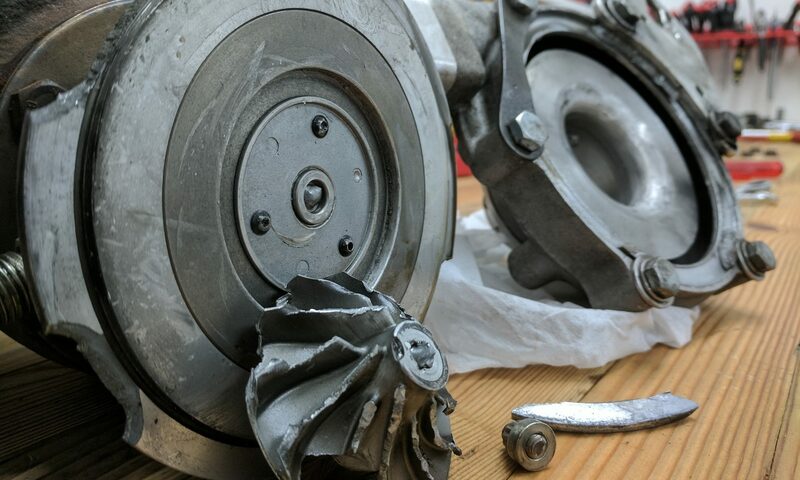 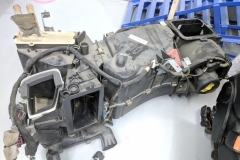 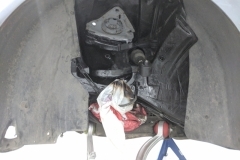 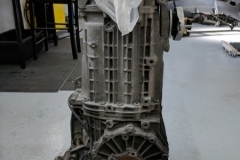 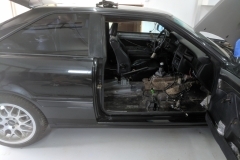 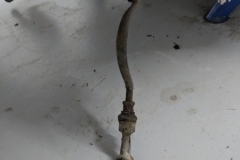 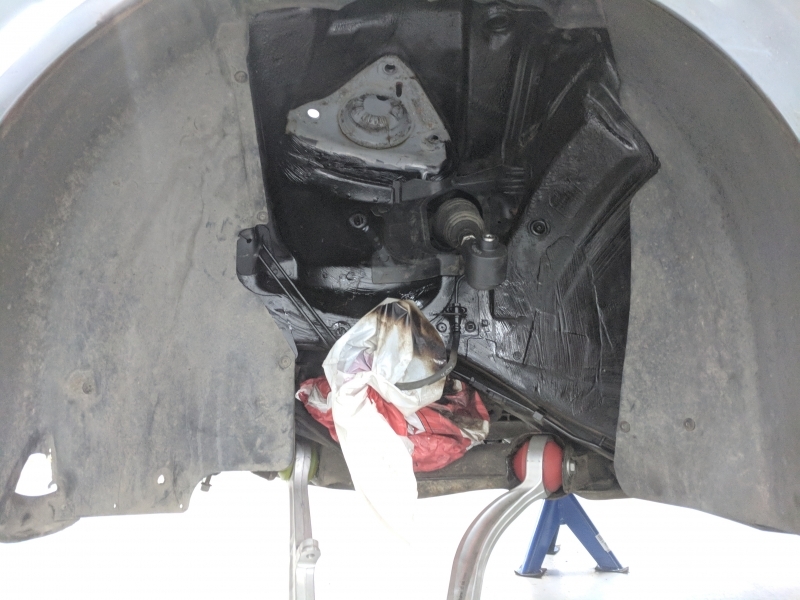 The hole was almost completely clogged up and would certainly be the end of the turbo. 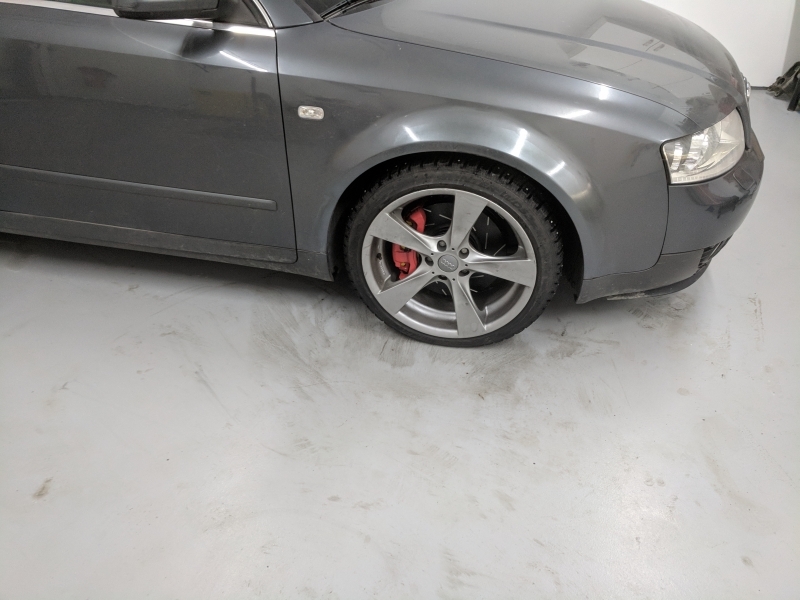 The clutch pedal on the S2 felt a little weird and it would not release the entire way before you helped it by dragging it with your foot. 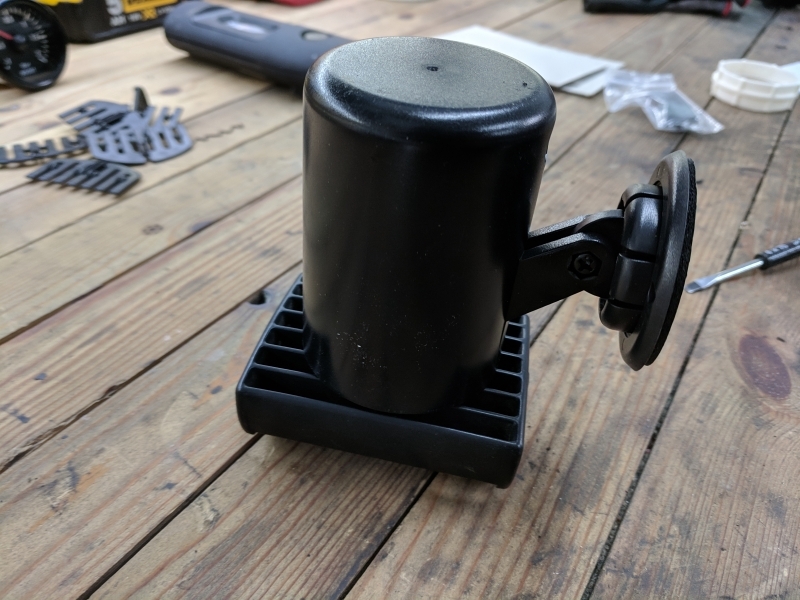 I decided to replace the master and slave sylinder instead as the parts aren’t that expensive. 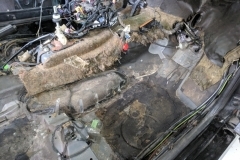 As I currently have the top of the engine, access was easy and the job was a quick one. 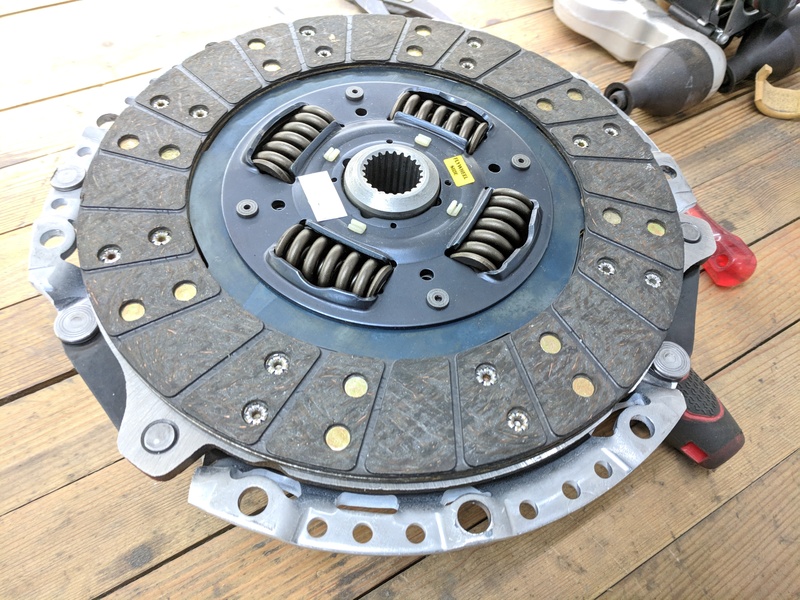 Spent some time bleeding the new system, but the result was a much better clutch feel and the pedal now extends the whole way without needing help. 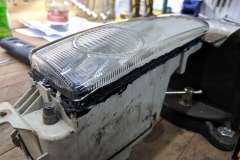 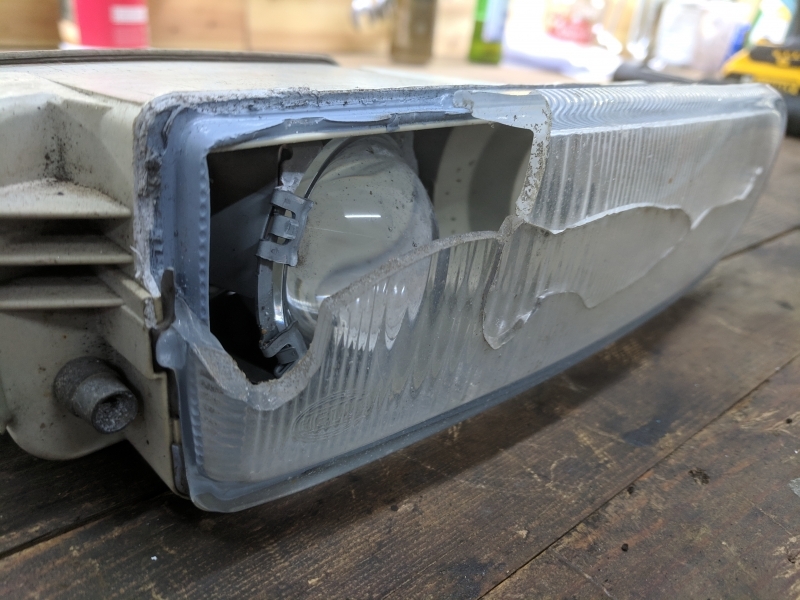 I had to fix one of the front fog lights as the glass was broken. 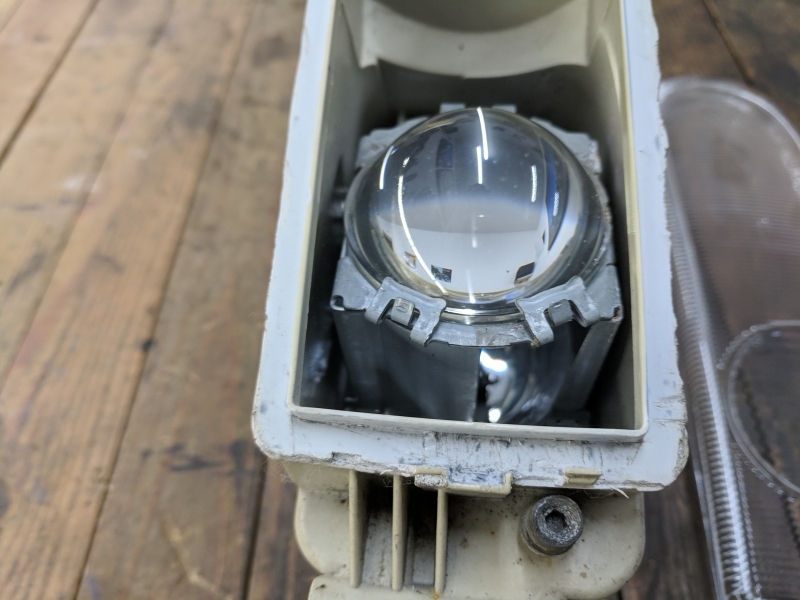 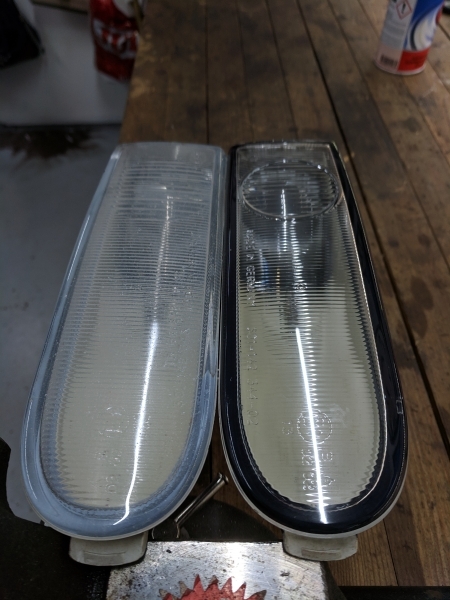 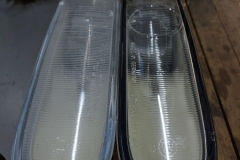 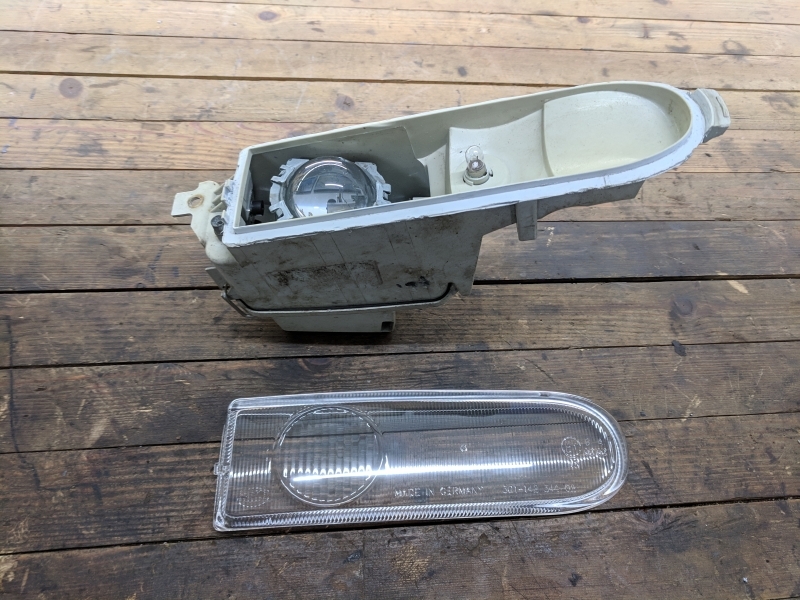 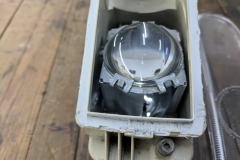 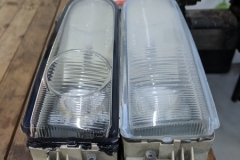 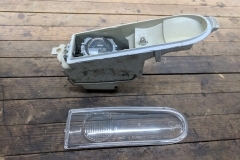 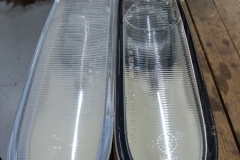 Both lights had become very gray and old-looking so I decided to replace the glass in both of them. 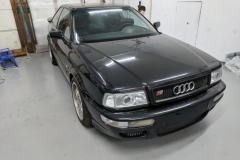 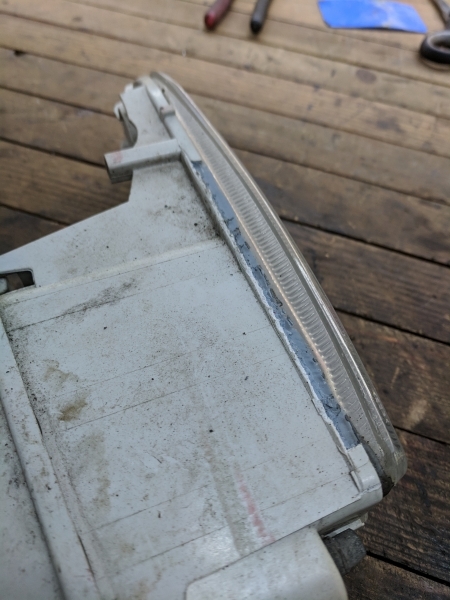 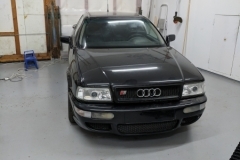 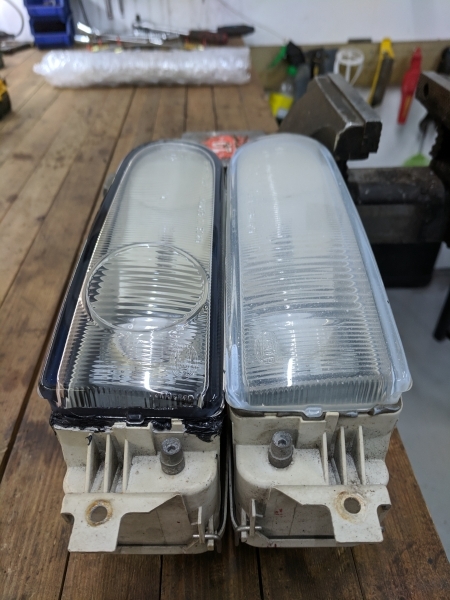 I discovered that the fog lights were from an old Porsche 993 and not the original Audi S2. 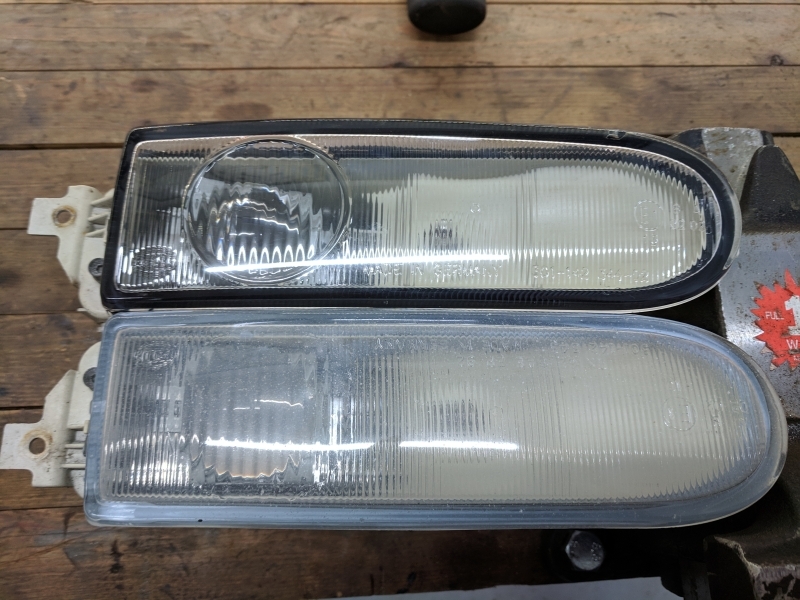 The front fender is an aftermarket fender which does not use the original lights.After a bit of searching, I got hold of a set of replacement glasses on eBay. 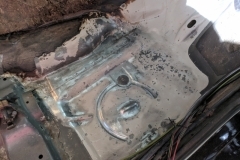 The glass replacement was a straight forward job. 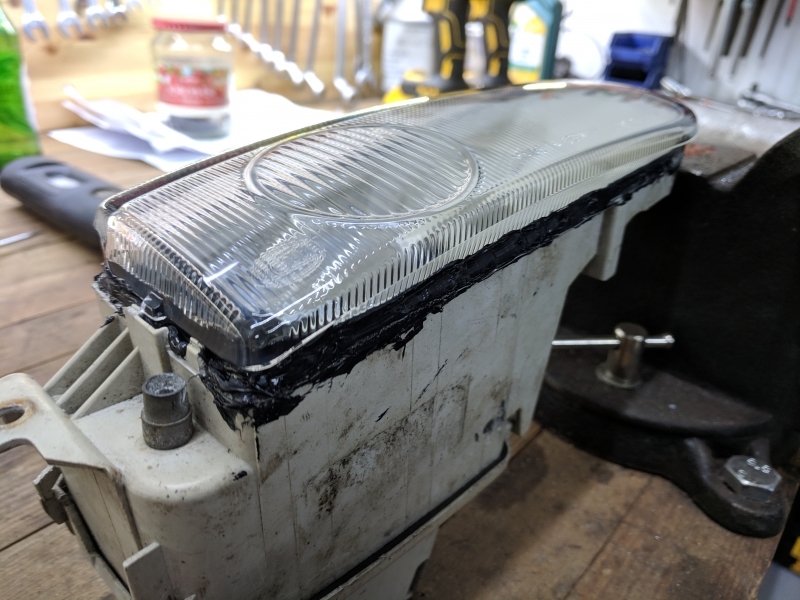 A little fiddling getting the old glasses out, but it turned out ok. 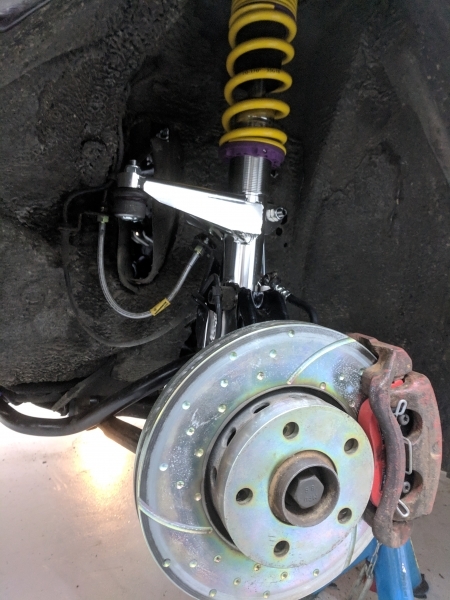 I completed fitted all the suspension upgrades and put the car back down on its wheels. 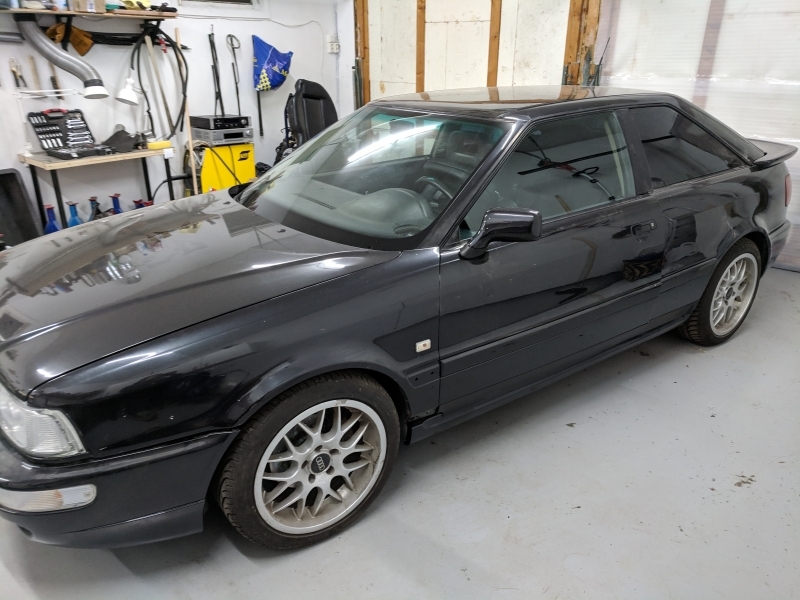 It looks good, but I will need to do a little tweaking to the ride height and do a four-wheel alignment before it is road ready. 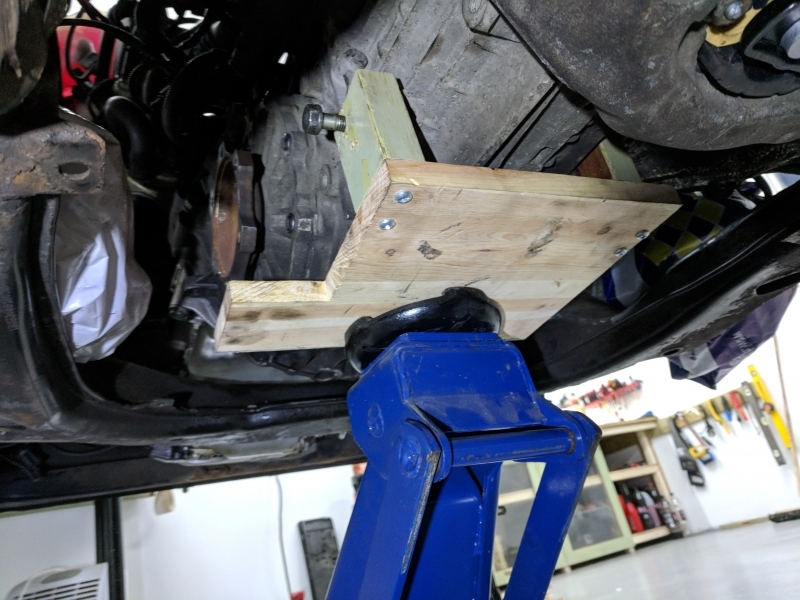 I found that the rear toe adjustment bars were too long so I had to fit the original ones, but that shouldn’t be a problem. 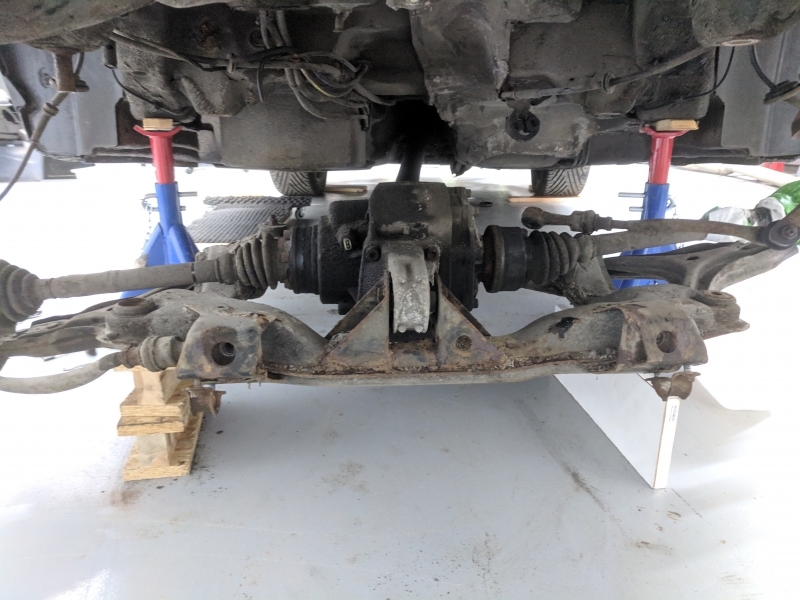 I had to create new break hard-lines between the two flexible ones on the front dampeners as the nuts were completely fused with the original lines and broke when I tried to get them off. 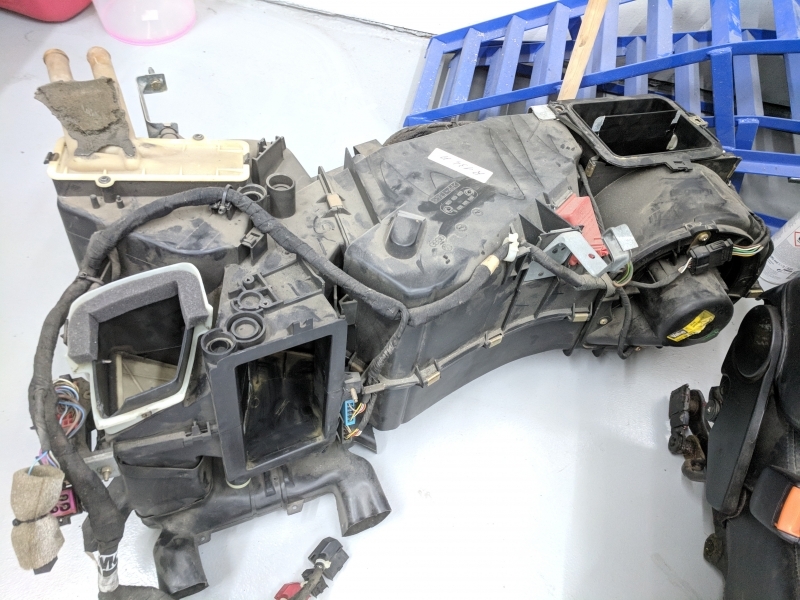 In addition to this, I had to cut a hole in the chassis to be able to get one of the bolts holding the rear subframe out. 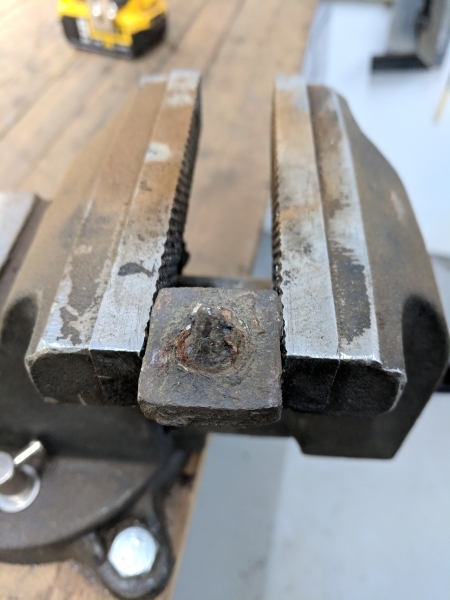 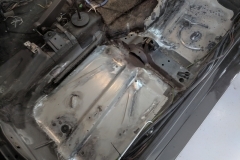 It was completely rusted to the threaded plate/nut in the chassis. 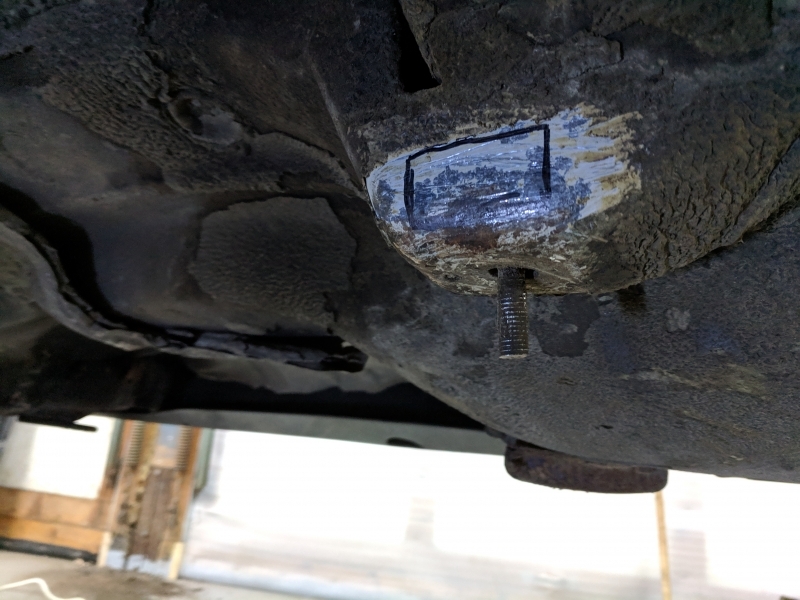 I found a piece of steel plate which I welded back in the hole and added some rust protection. 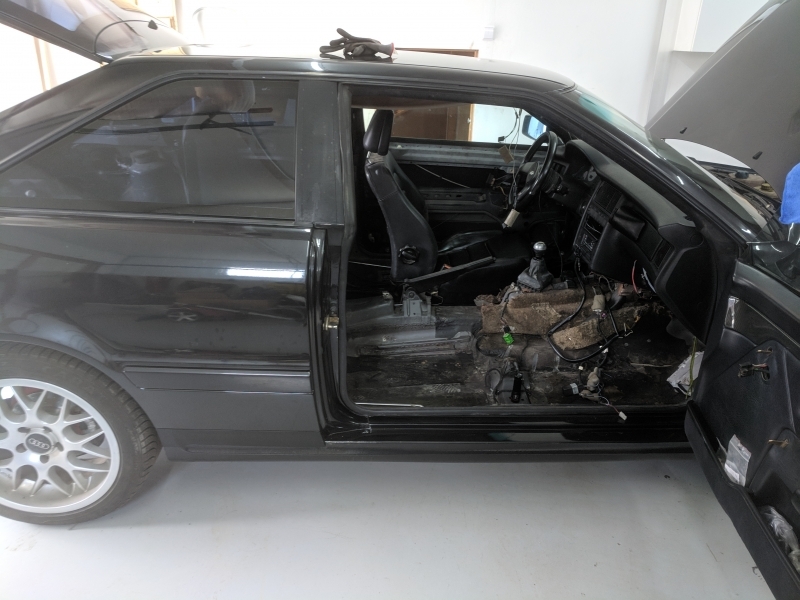 A couple of weeks ago, I got the urge to start the project as it was just sitting in the garage collecting dust. 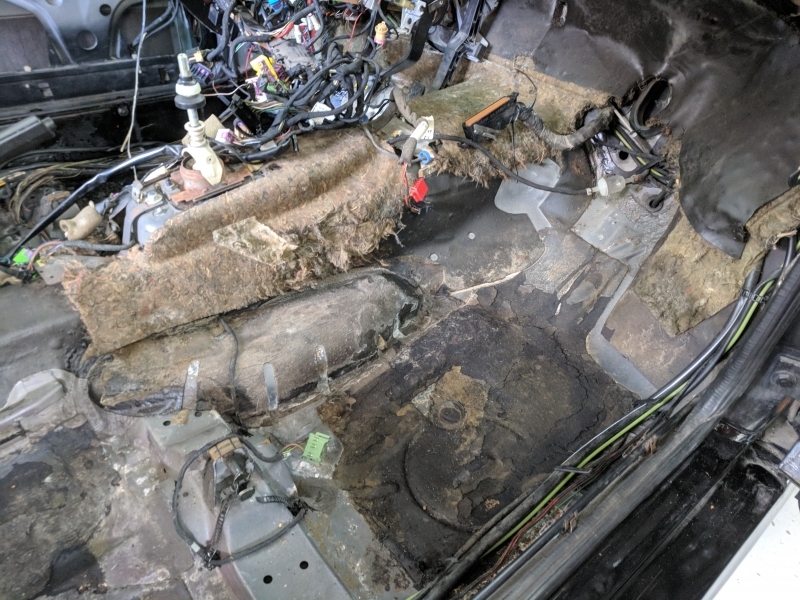 The car was stripped of all interior parts so this was my first mission. 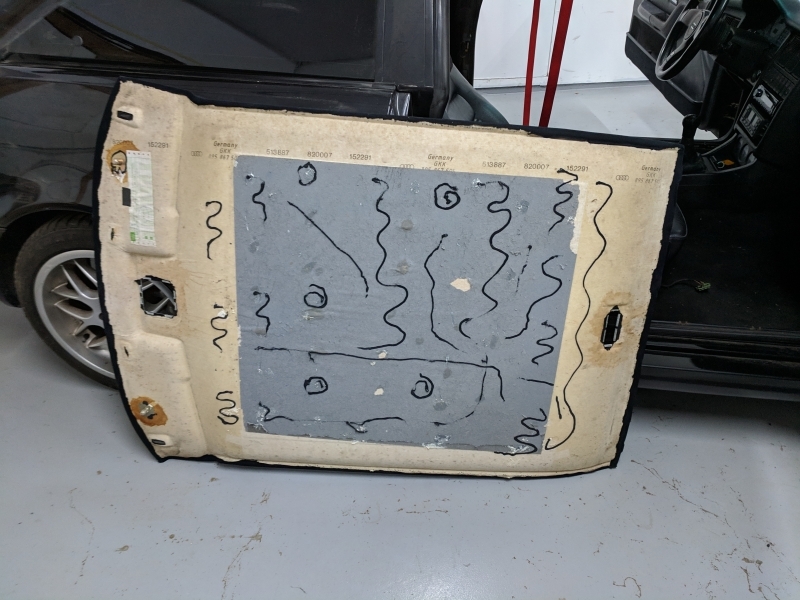 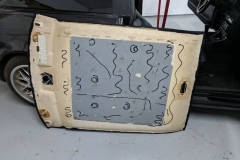 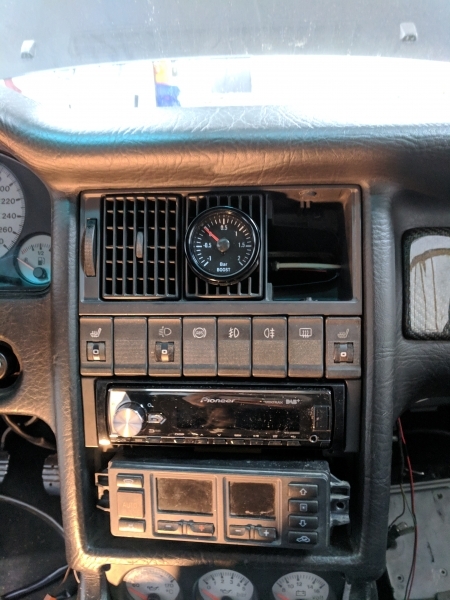 I also decided to upgrade the heater core to one of newer date with the upgraded controls. 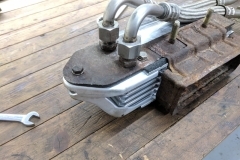 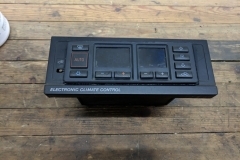 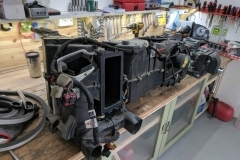 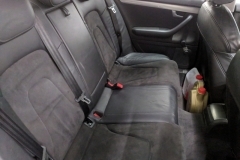 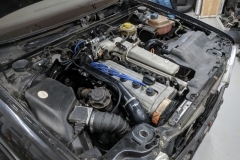 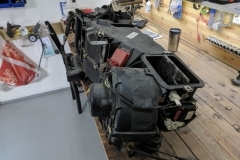 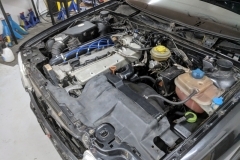 The car, being a 91-model had the first generation electrically operated climate system. 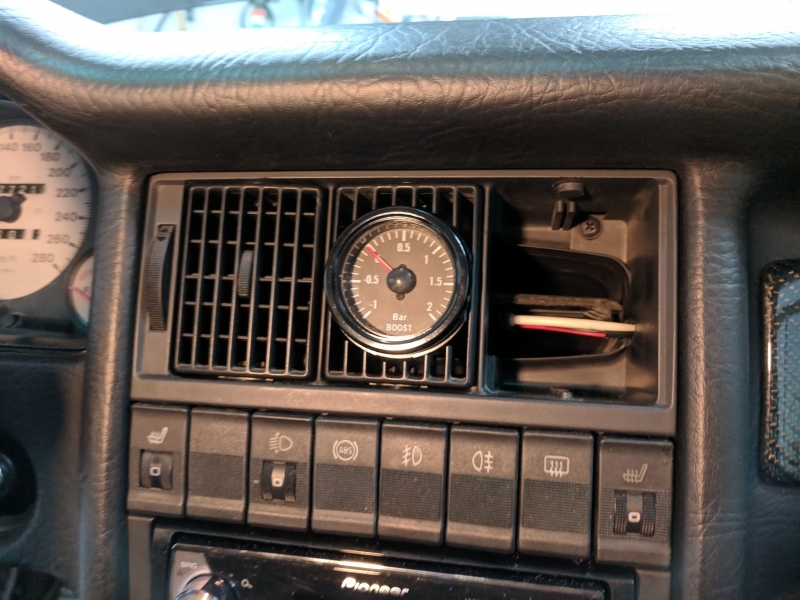 I got a salvaged second generation climate system when I bought the car so I decided to install it. 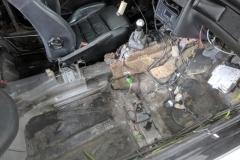 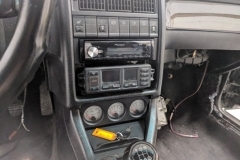 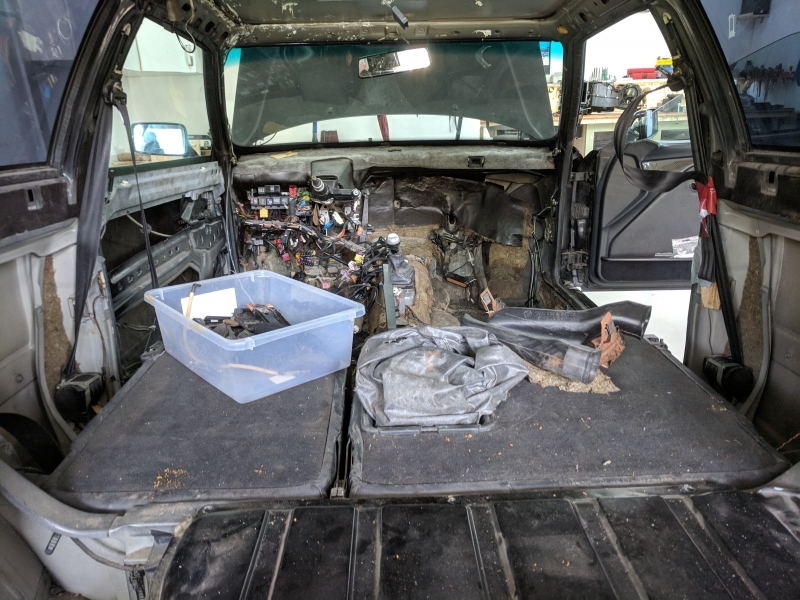 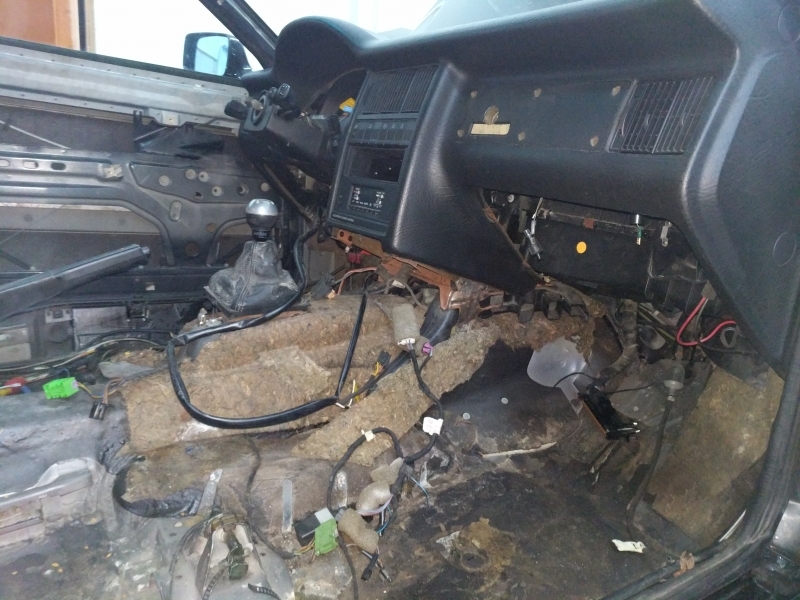 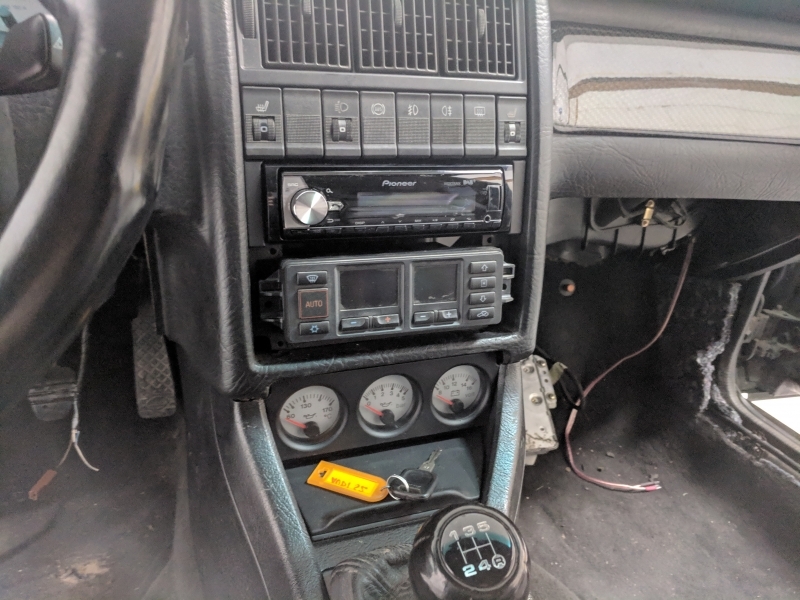 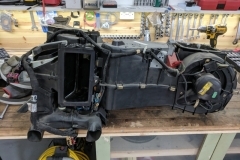 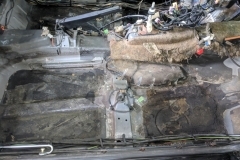 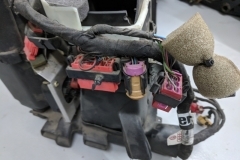 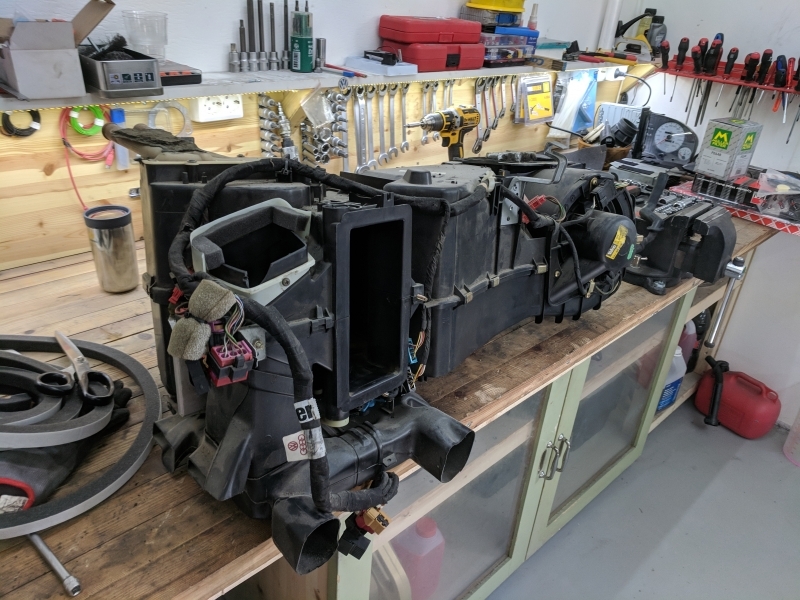 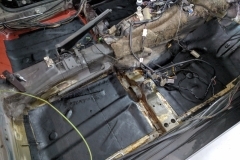 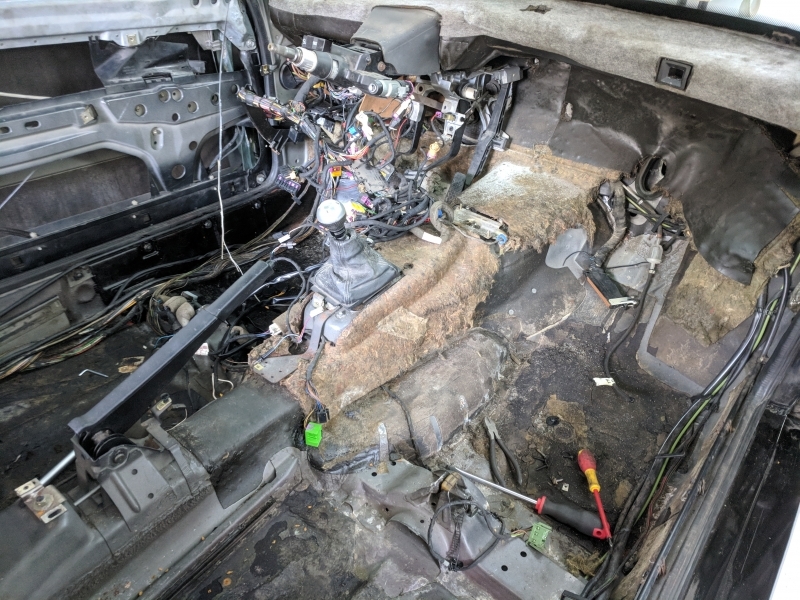 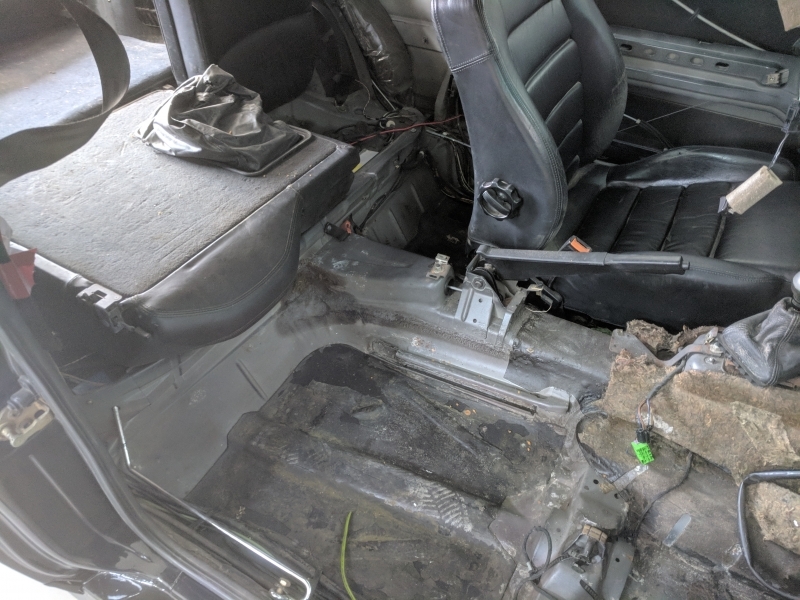 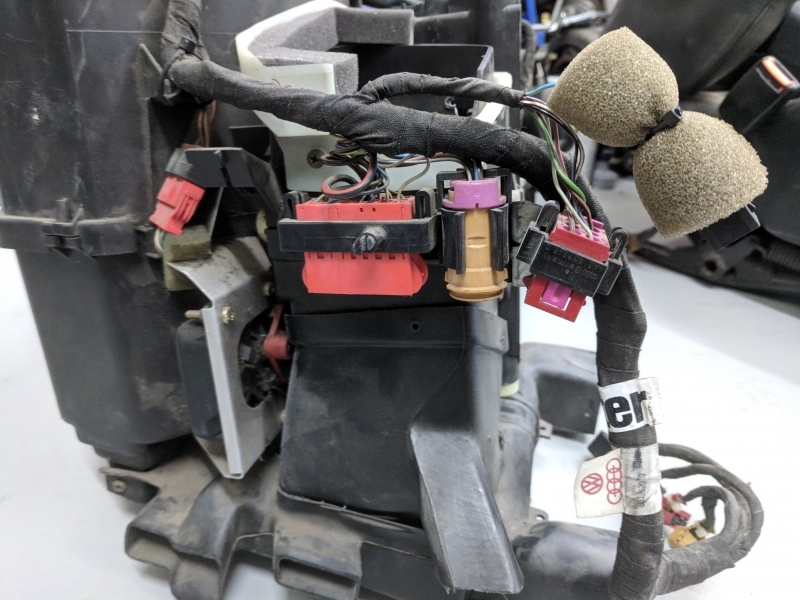 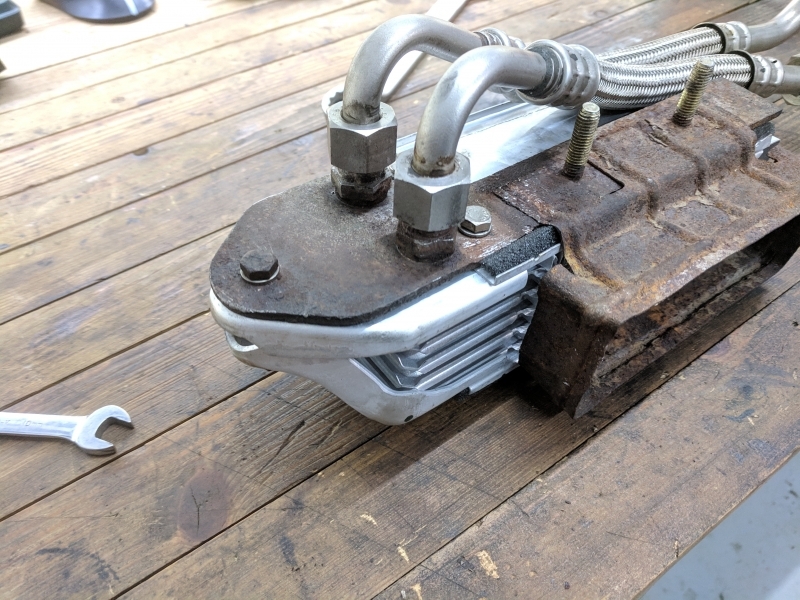 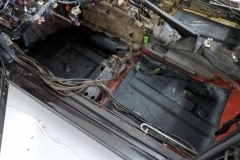 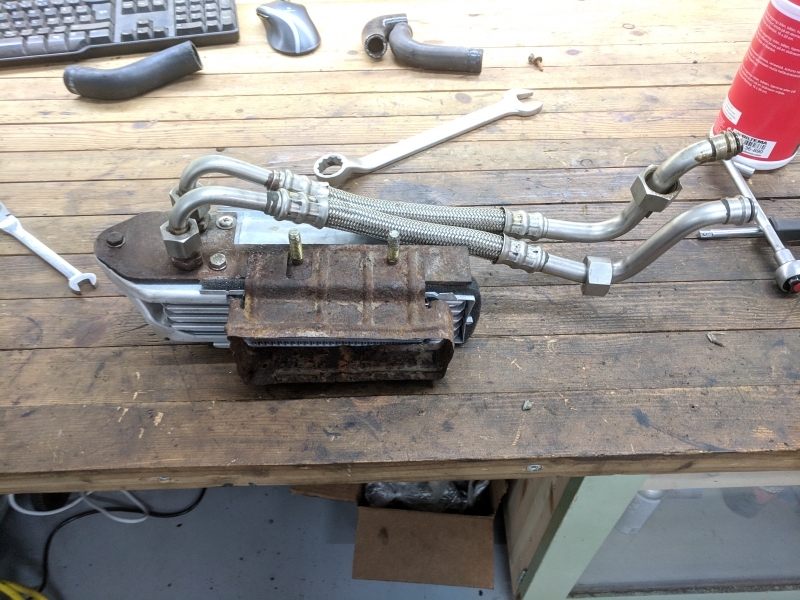 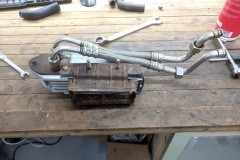 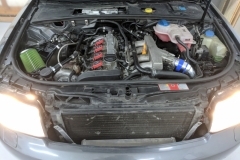 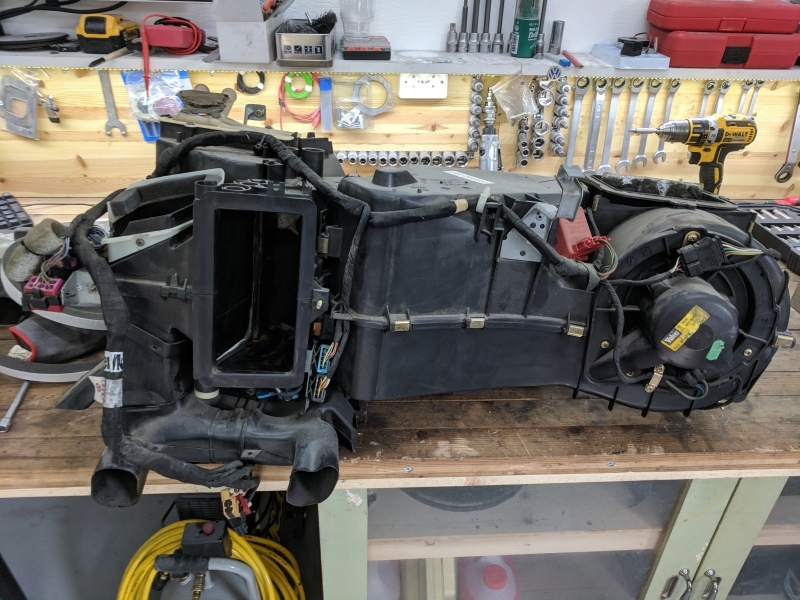 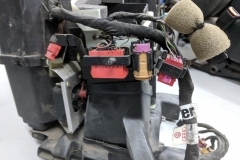 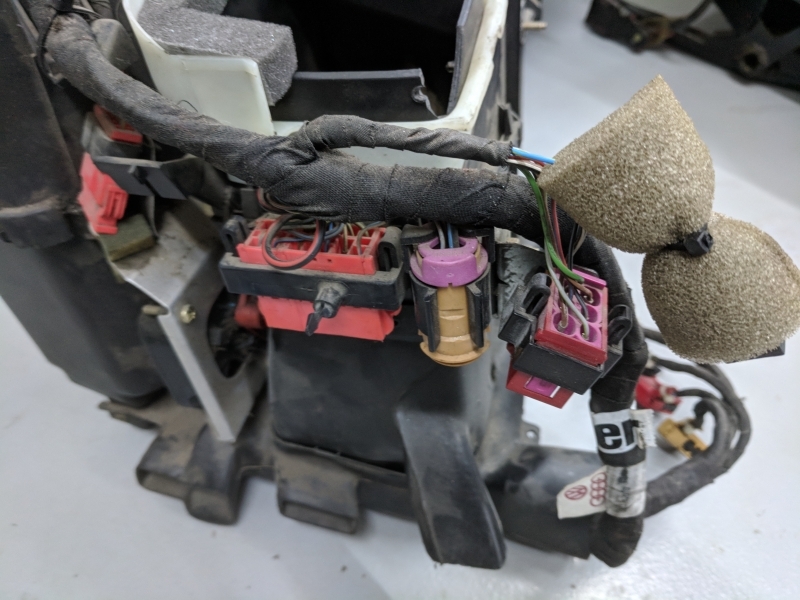 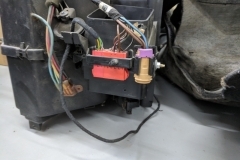 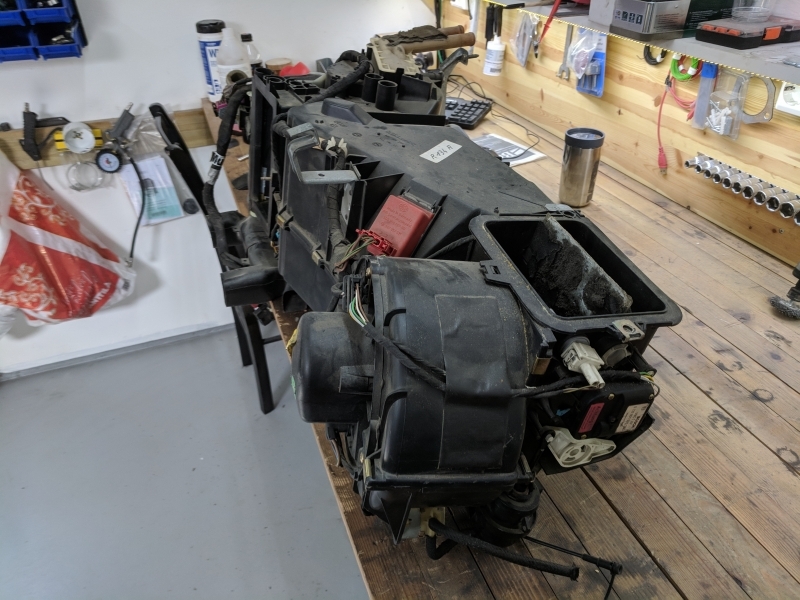 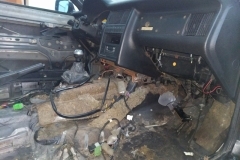 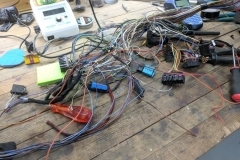 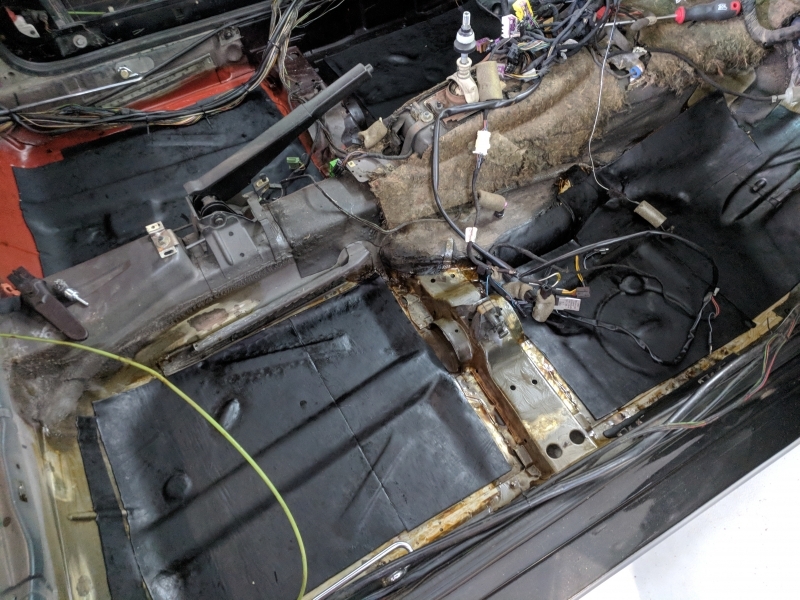 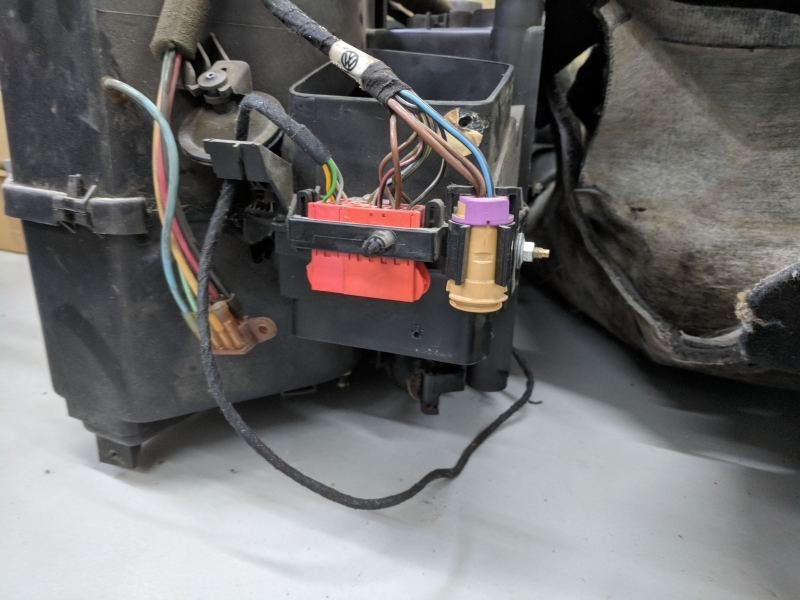 This project required me to rewire the entire system as even though the connector was the same, hardly any one wire was wired to the same feature on the car. 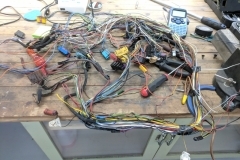 I spent hours and hours trawling through schematics to identify which wire should be connected where. 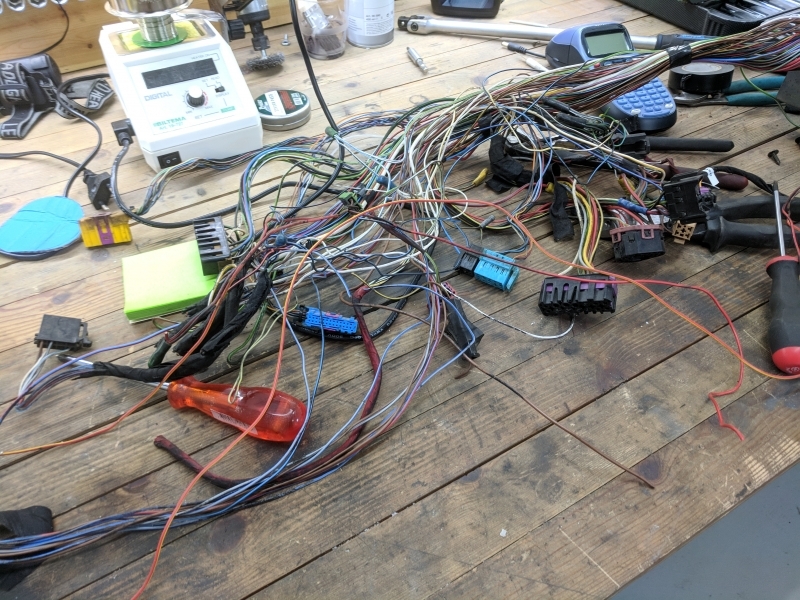 I ended up connecting almost all pins on the new system, but there were some pins which I did not connect. 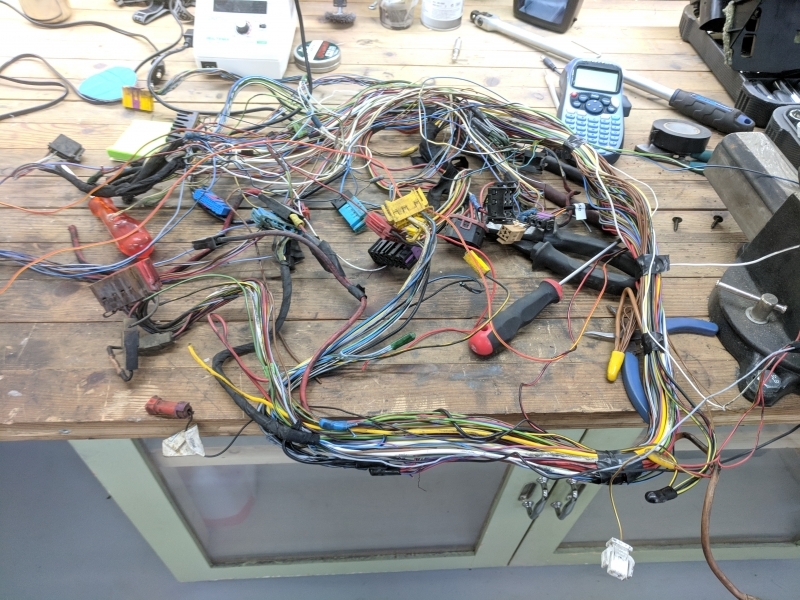 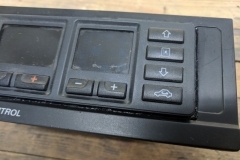 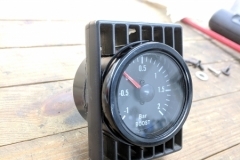 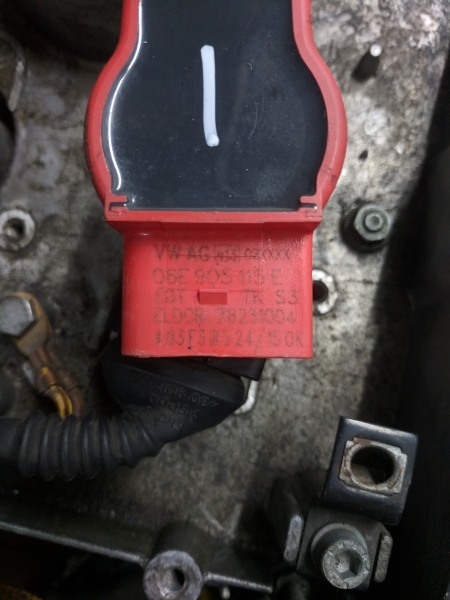 I think some of these were the rev-counter and full throttle wire which should be connected to the ECU. 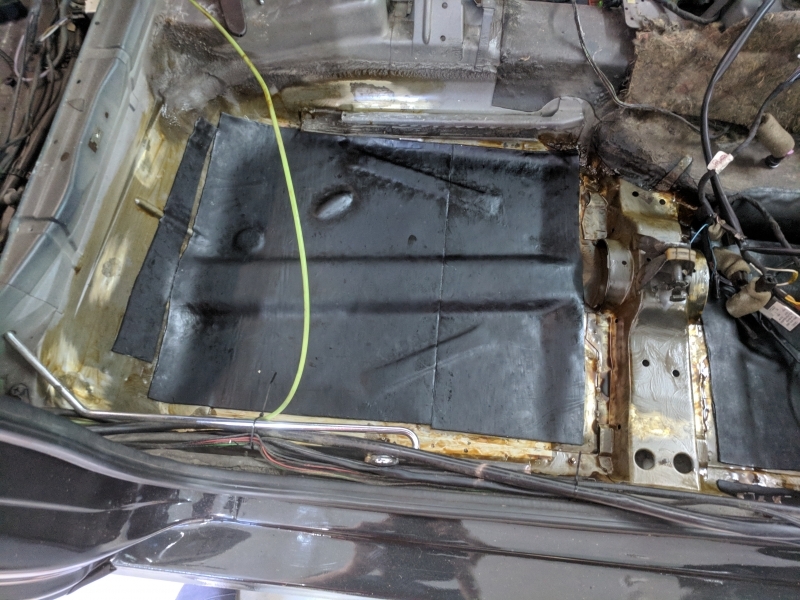 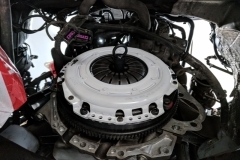 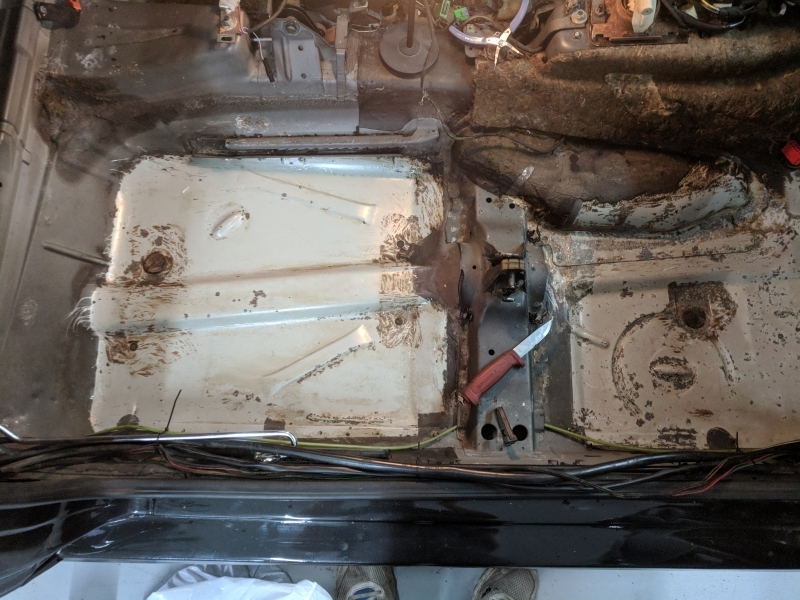 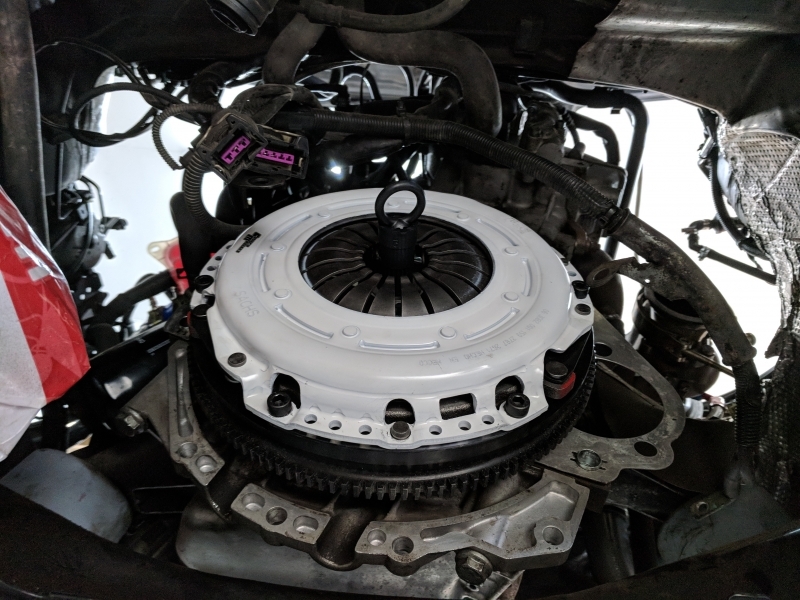 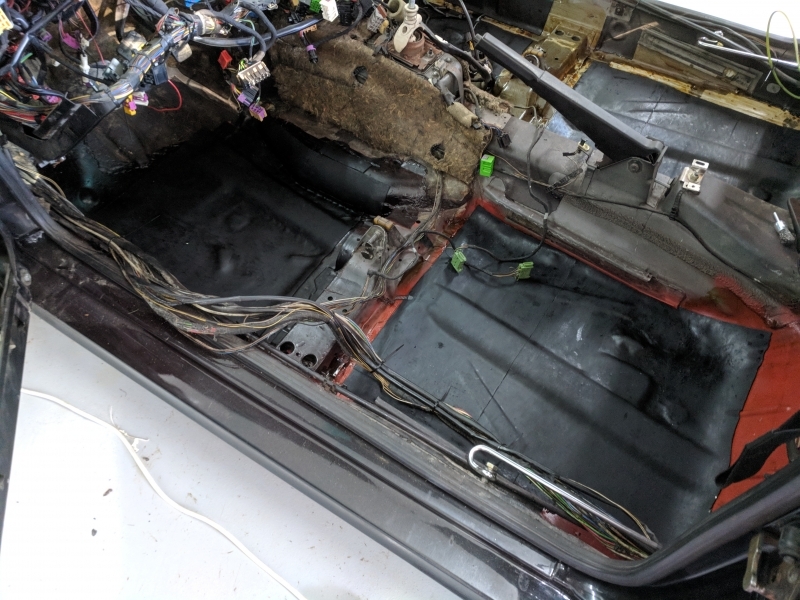 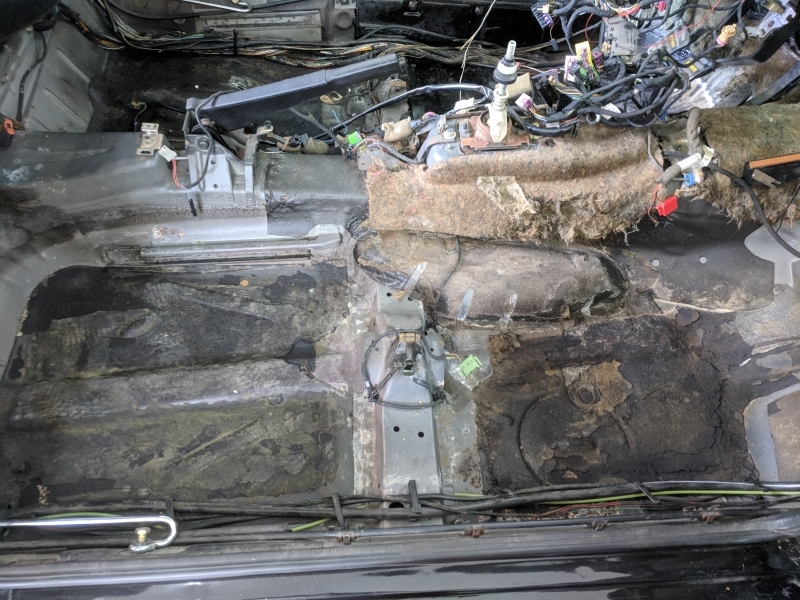 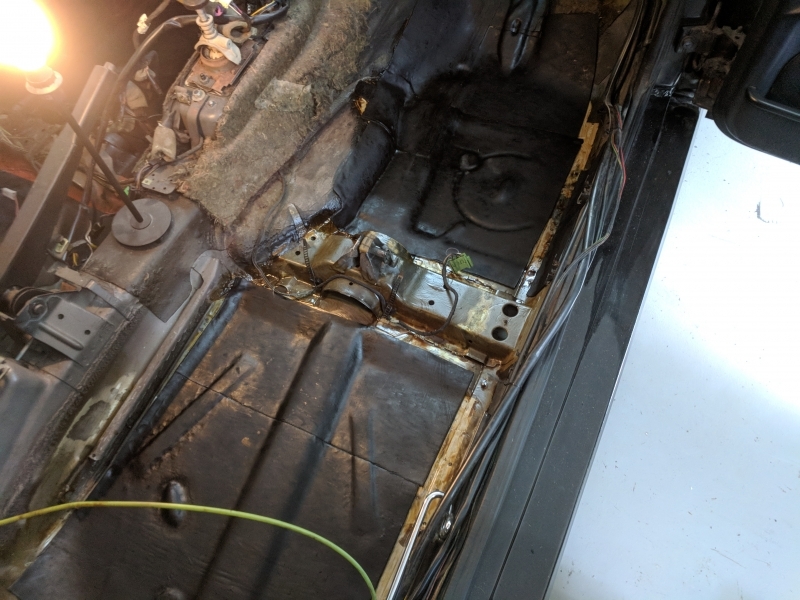 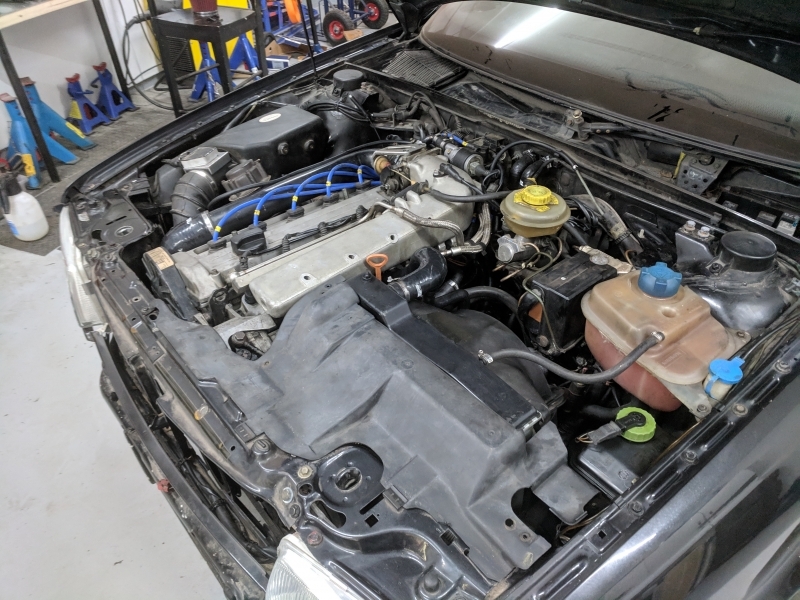 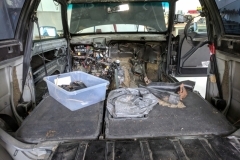 It was a little scary to connect the battery after rewiring and fitting the new heater core, but everything seemed to be working fine. 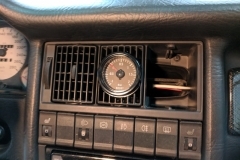 The only thing that needs to be fixed is the display on the heater-controls as some of the segments does not work. 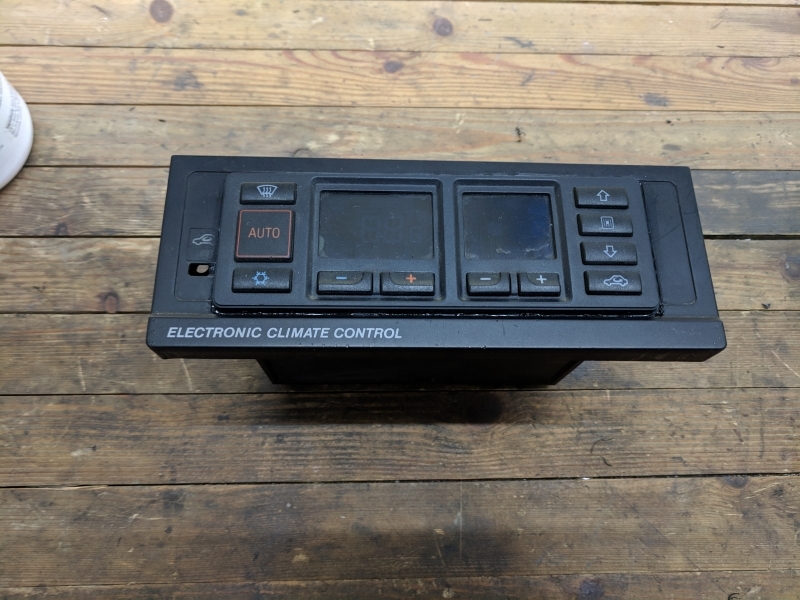 This is not important for the main functionality of the climate system so I’ll try to fix it at a later time. 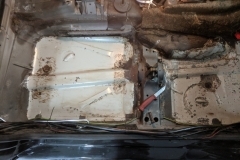 I did get all the parts for the interior spread amongst several boxes and containers so the next job was to install it. 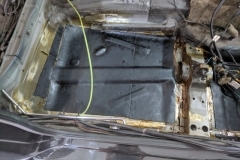 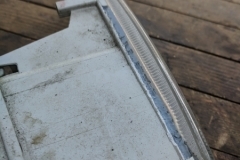 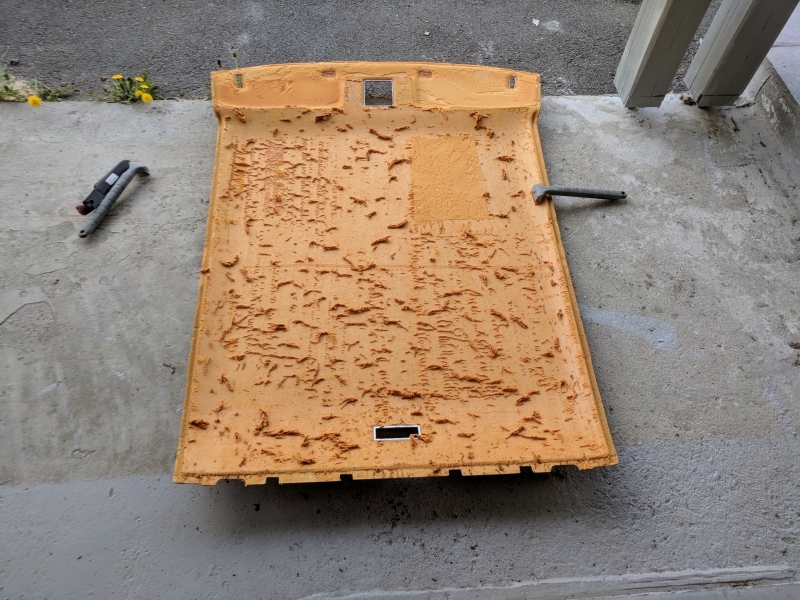 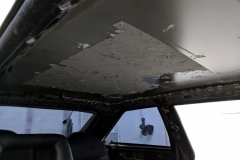 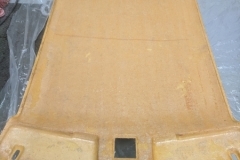 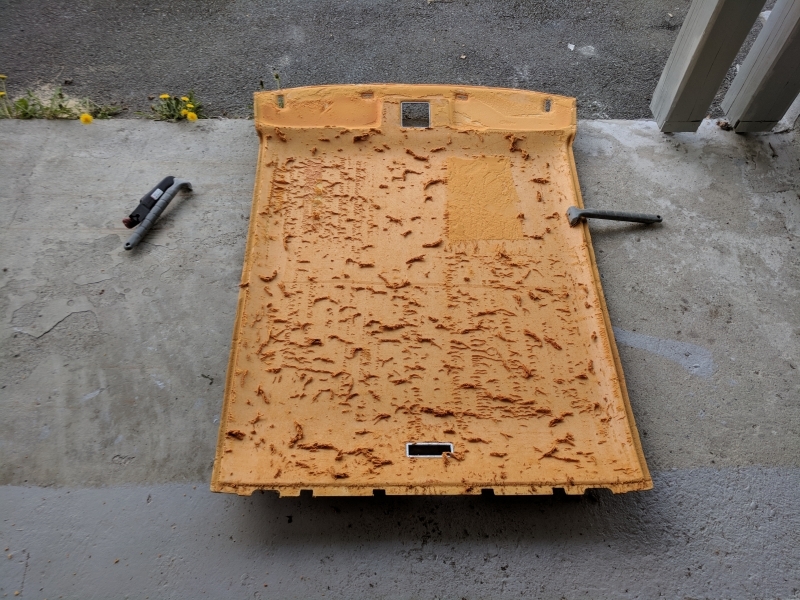 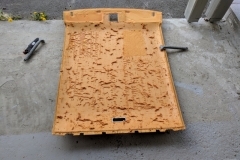 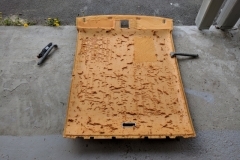 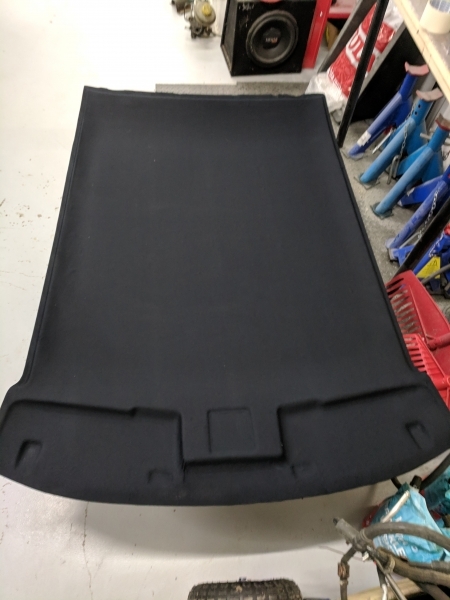 The first thing I did was to rip off the old roof liner as it was dirty and had almost fallen off by itself. 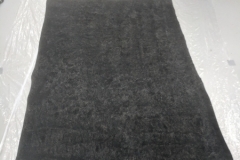 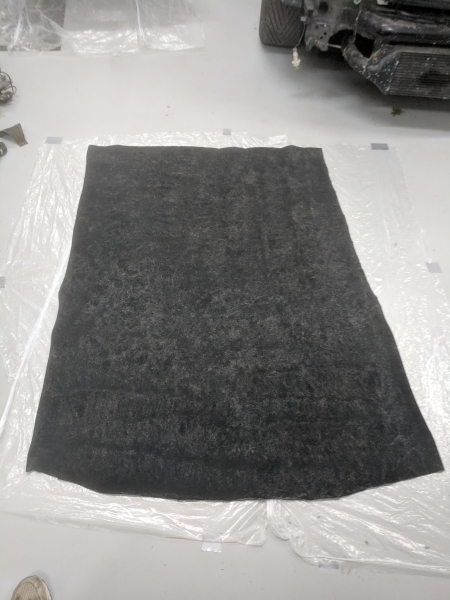 The original color was light gray-yellow-ish, so naturally, I decided to go for black. 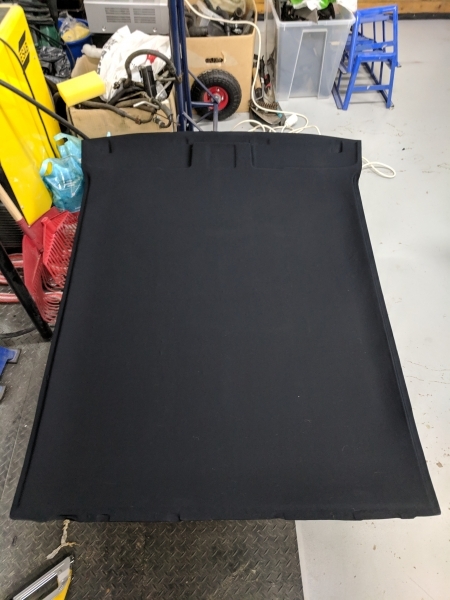 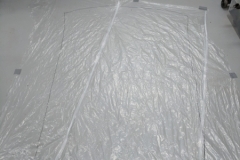 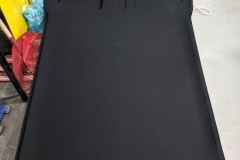 The first attempt failed miserably as the fabric managed to glue itself to itself… With that lesson learned, I recruited help from my wife and tried again, with a much better result! 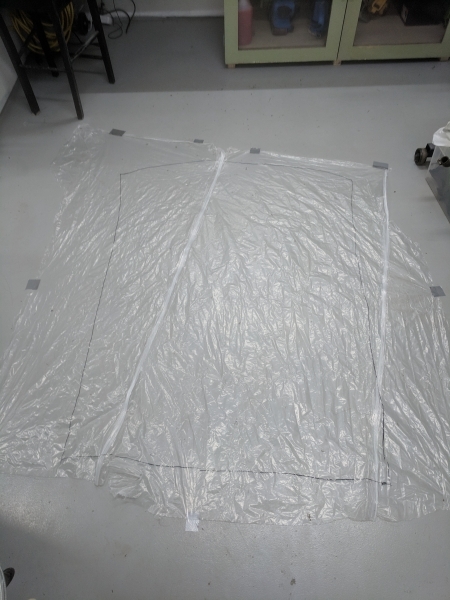 I did get some wrinkles, but I decided not to do it a third time. 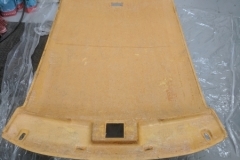 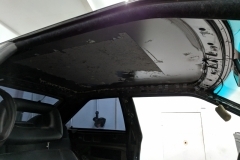 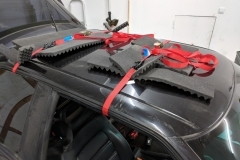 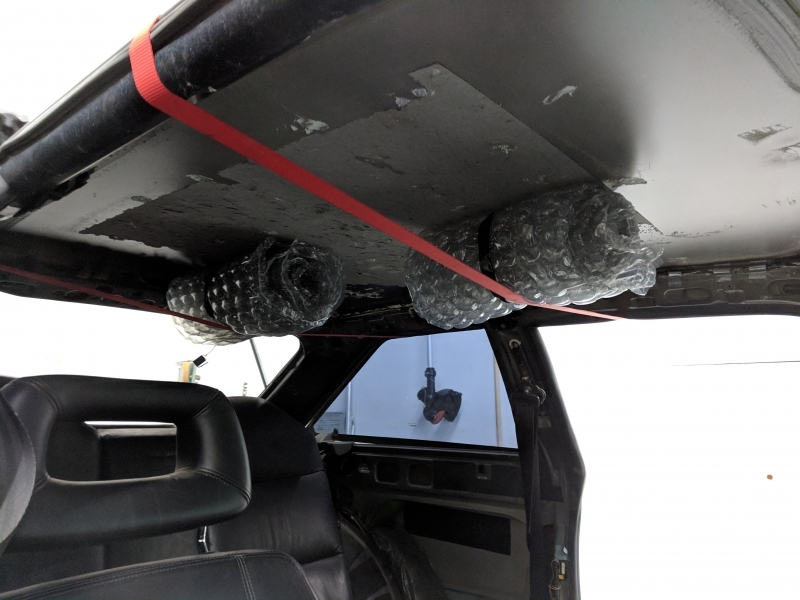 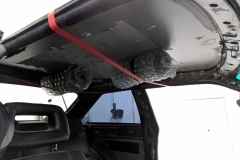 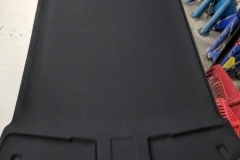 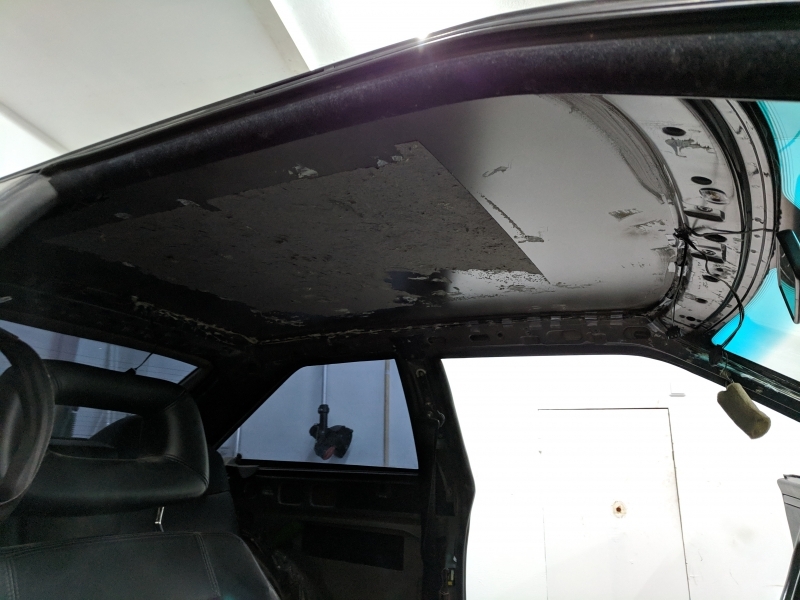 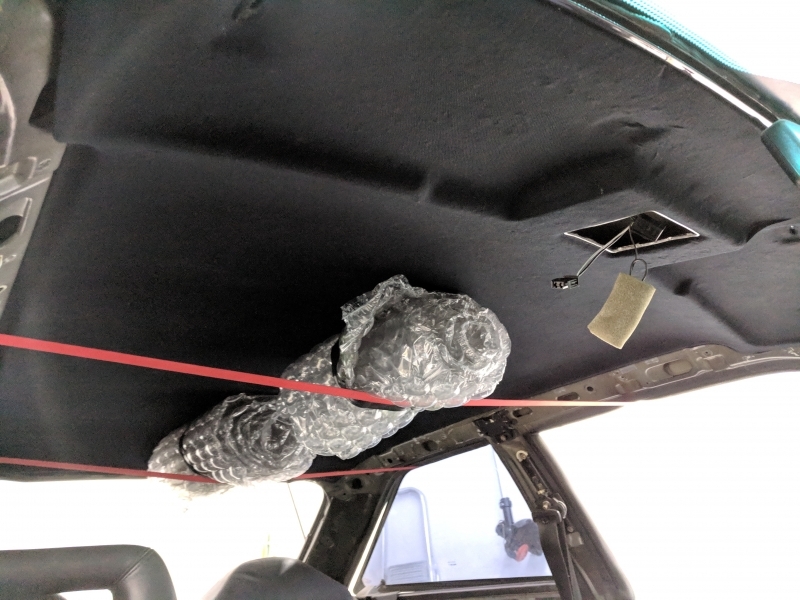 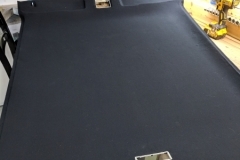 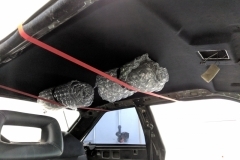 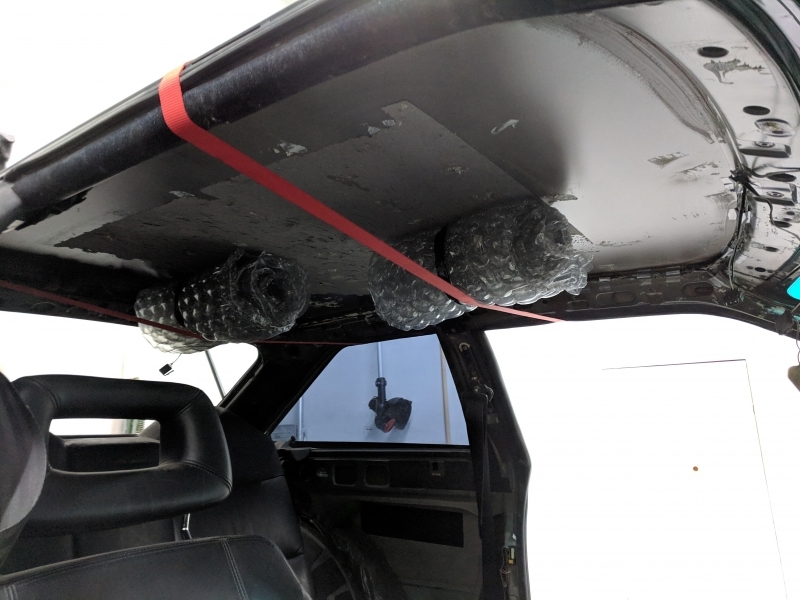 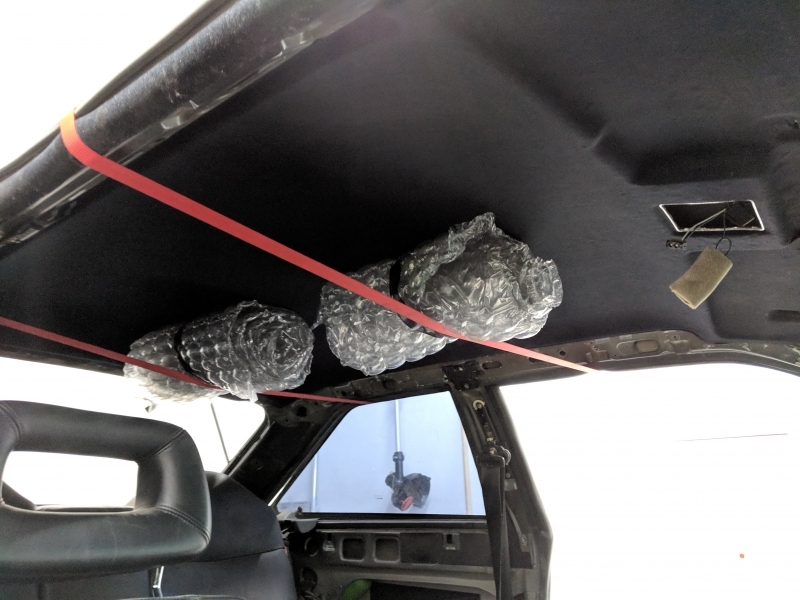 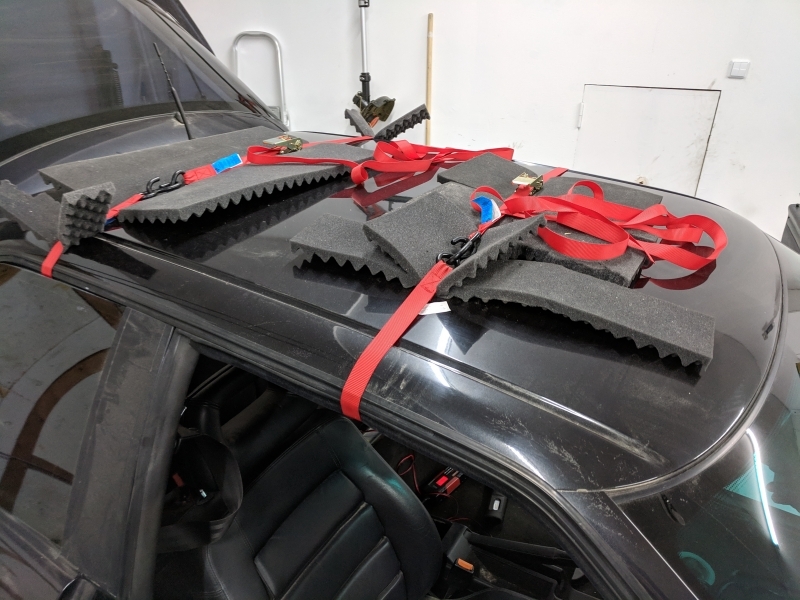 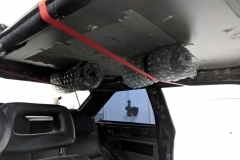 Finally I used a couple of jack-straps to glue the roof liner assembly to the roof of the car. 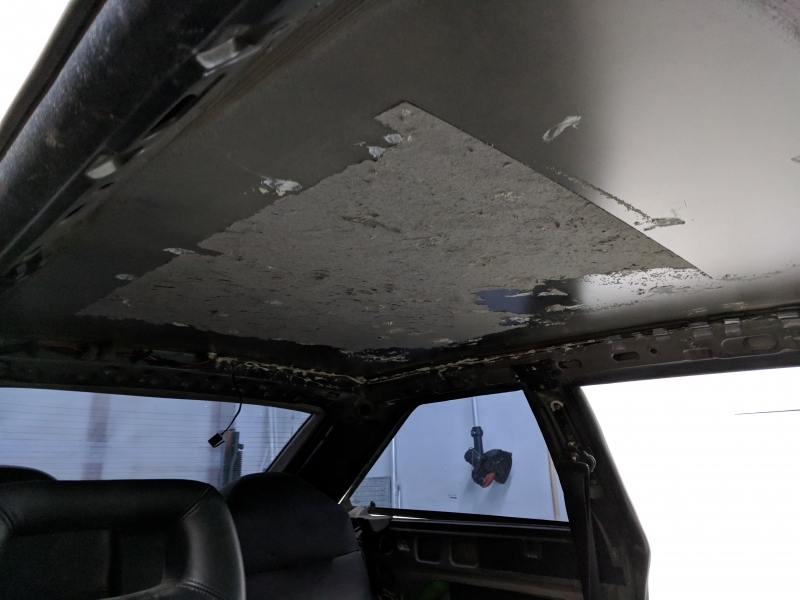 After installing the upgraded climate system I put the dashboard back in, the roof carpet, the plastic trim, the seats and the rest of the bits and pieces needed. 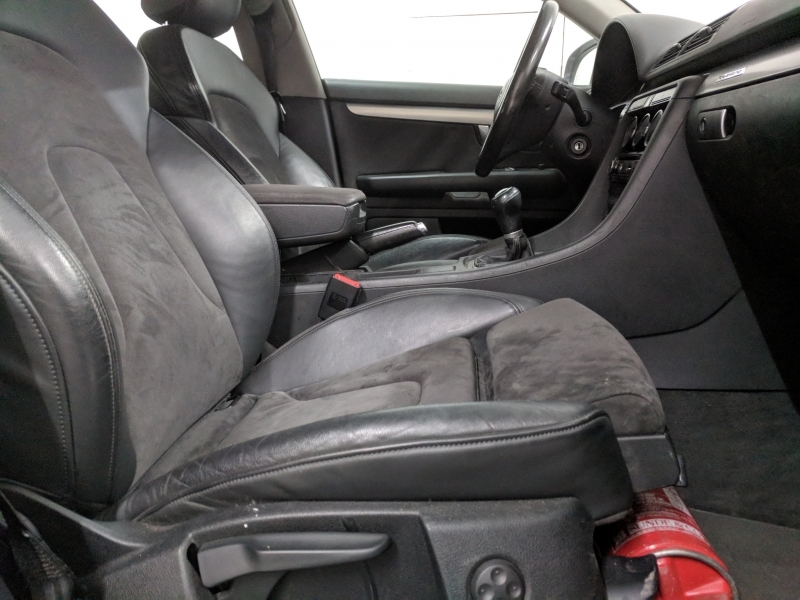 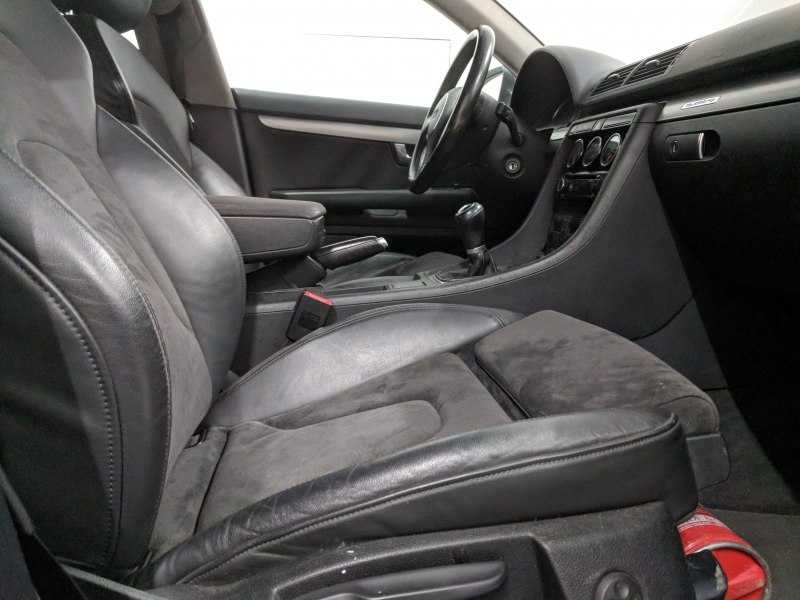 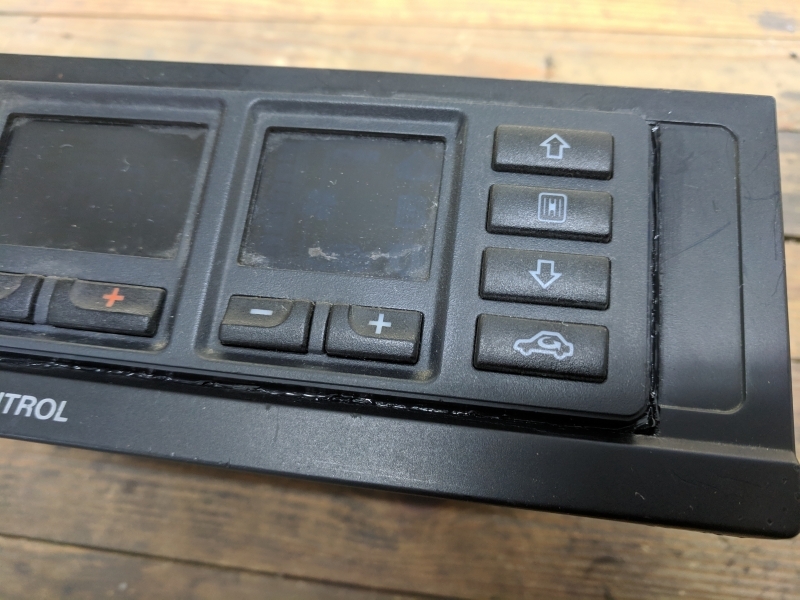 No real difficulties here except fitting the small compartment below the steering wheel… Too many wires… I got it in there, but it is not fitted exactly as it was from the factory. 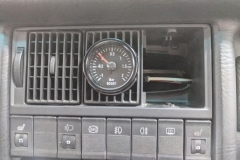 As this is a turbo car, it needs a boost gauge. 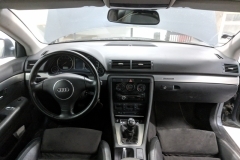 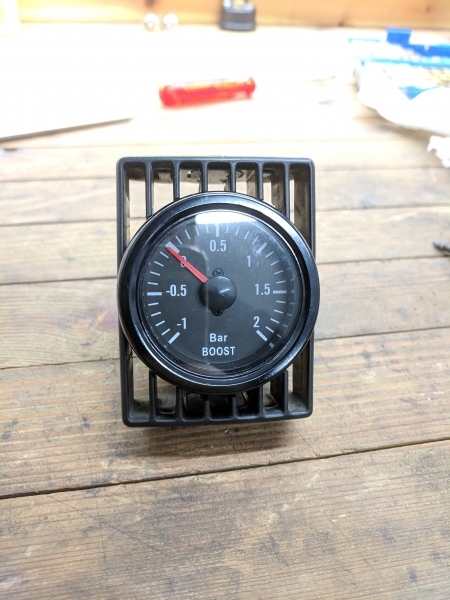 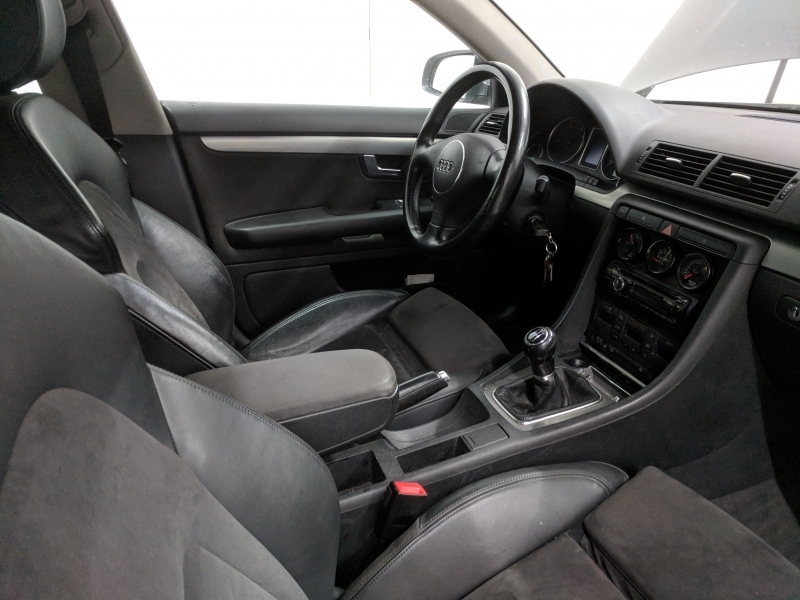 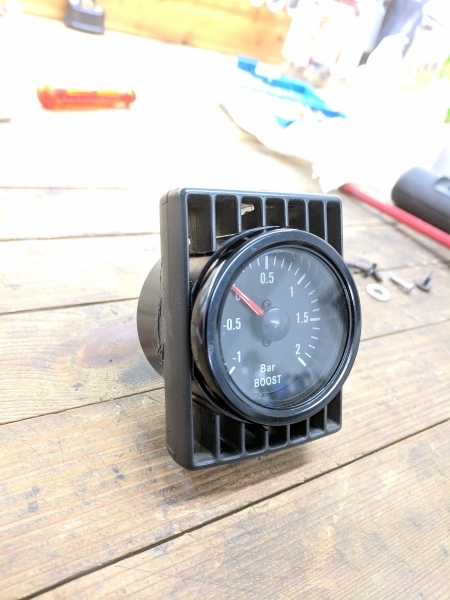 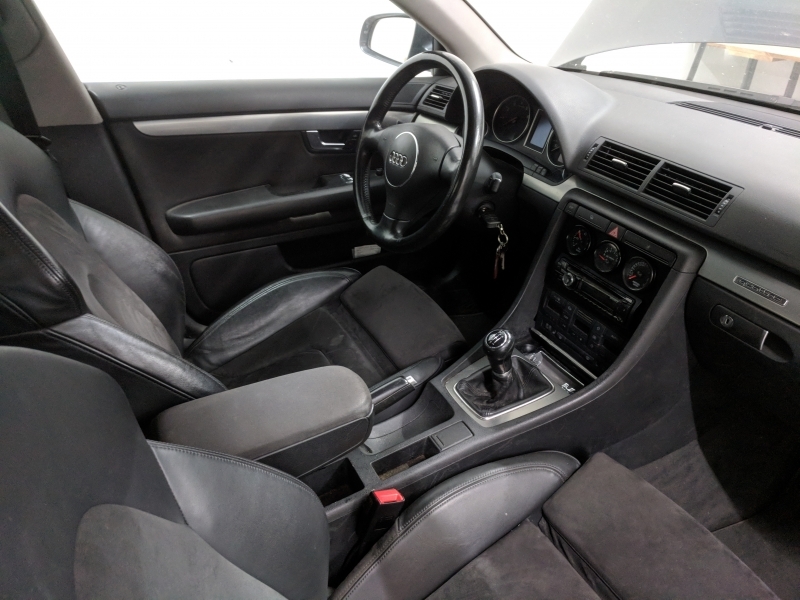 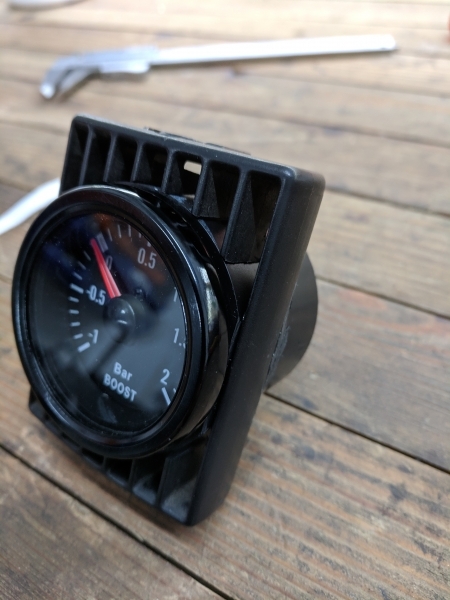 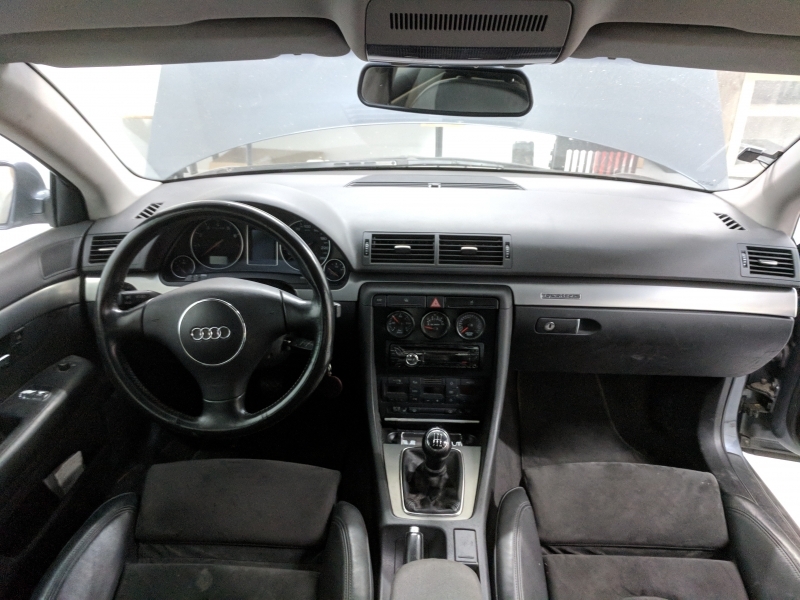 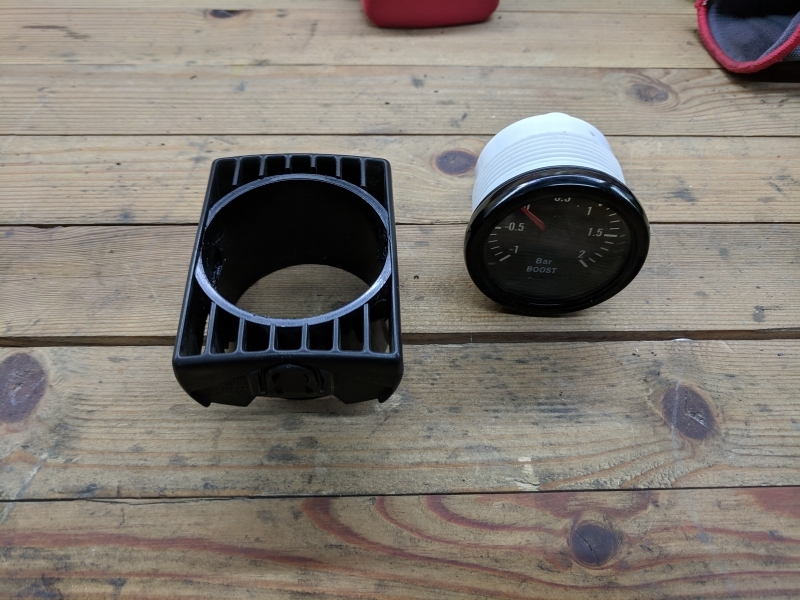 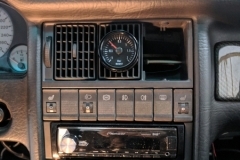 I don’t understand why Audi didn’t fit a boost gauge from the factory, especially on the S-models… I’ve seen many others fit the boost gauge in the middle of the three air vents in the center of the dashboard so I decided to do the same. 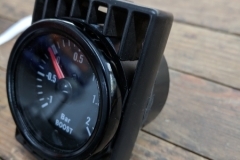 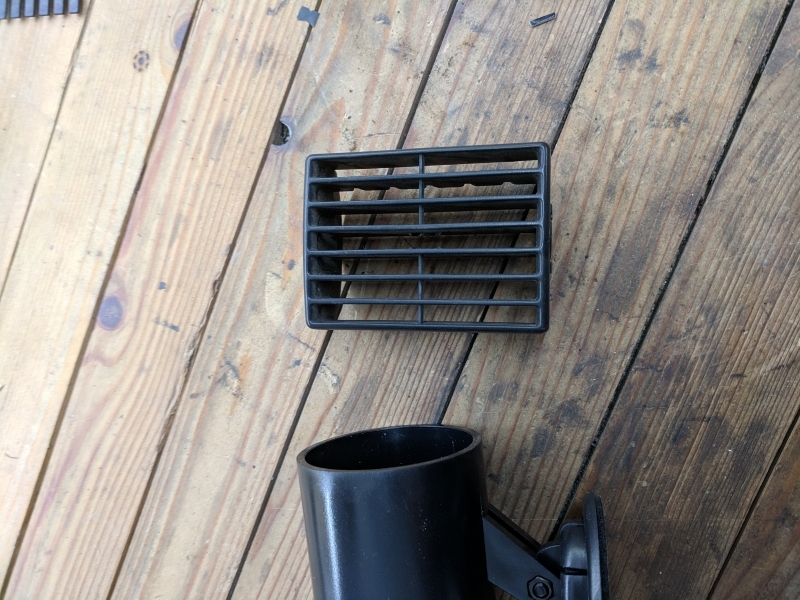 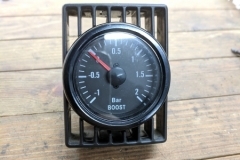 I have many air vent fronts from the previous owner, so I wasn’t afraid to destroy one to build the boost gauge frame. 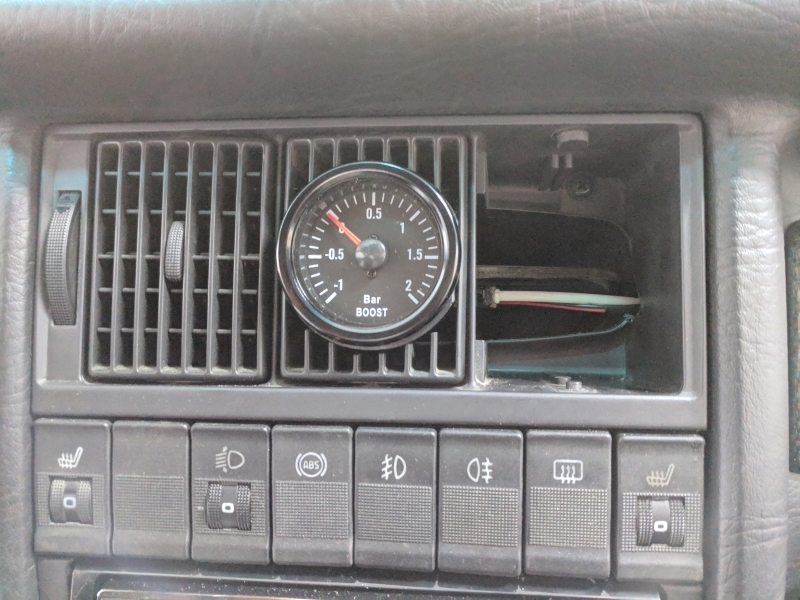 I wires the lightning for the boost gauge to the light controls such that it has light when the main light switch is on (same as the rest of the gauges in the dash). 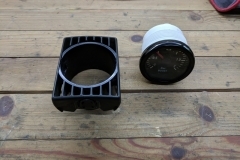 To get the manifold air pressure to the gauge I fitted a y-piece on the hose to the ECU. 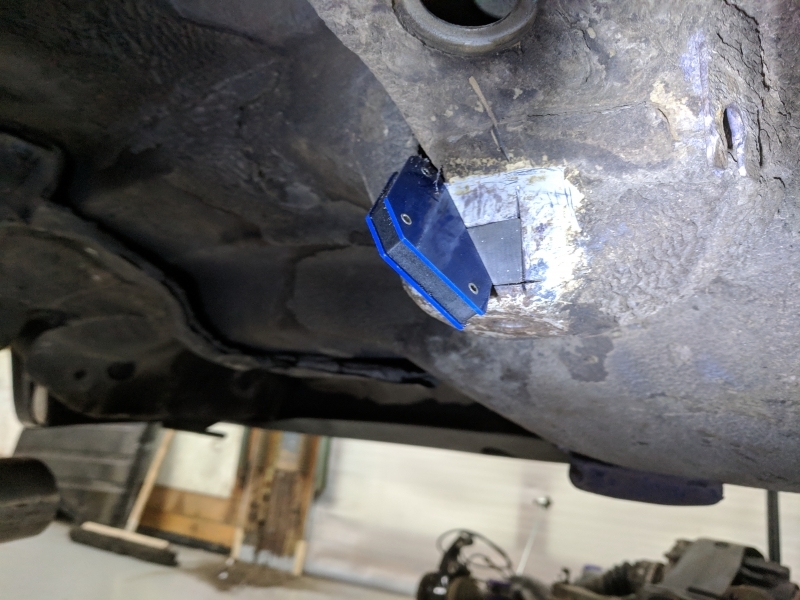 I test-fitted the front fender just to see what I had to work with. 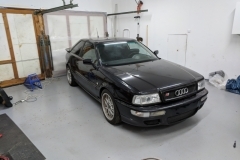 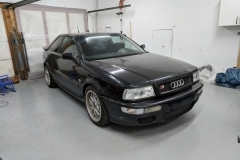 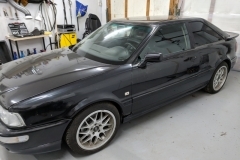 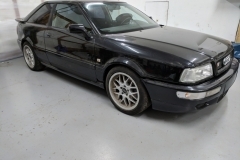 The fender is not an S2 original, but some sort of aftermarket RS2-copy of some kind. 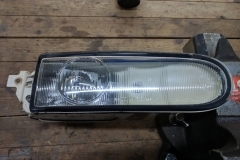 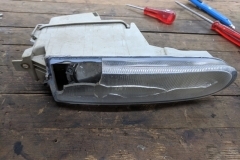 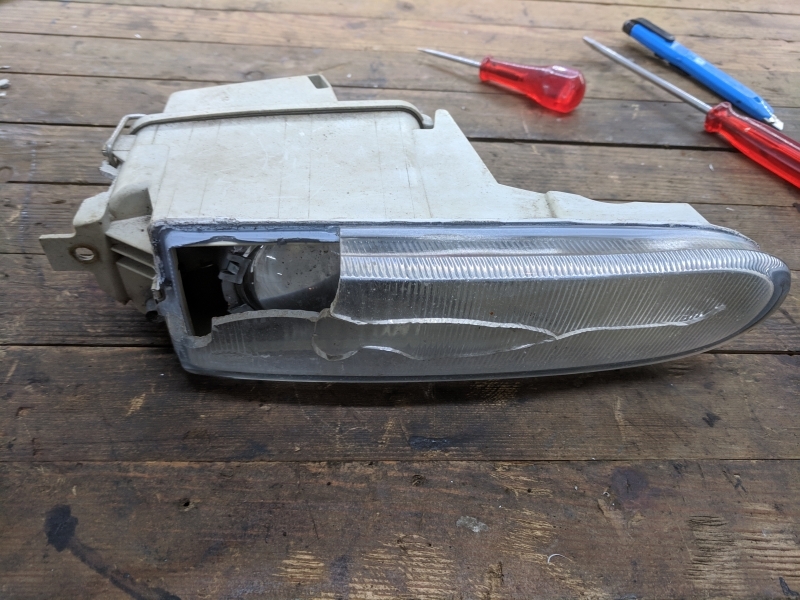 One of the fog lights were broken so I had to find a new one in order to pass the requirements for registering the car. 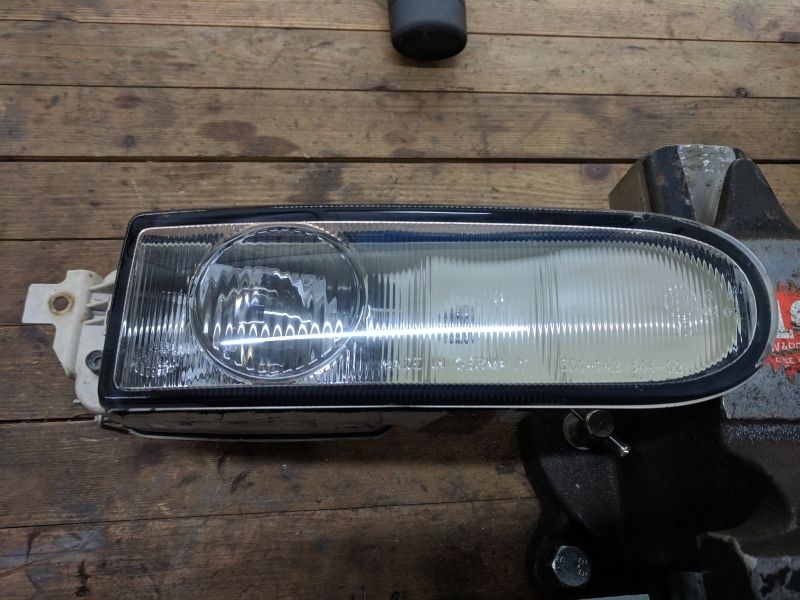 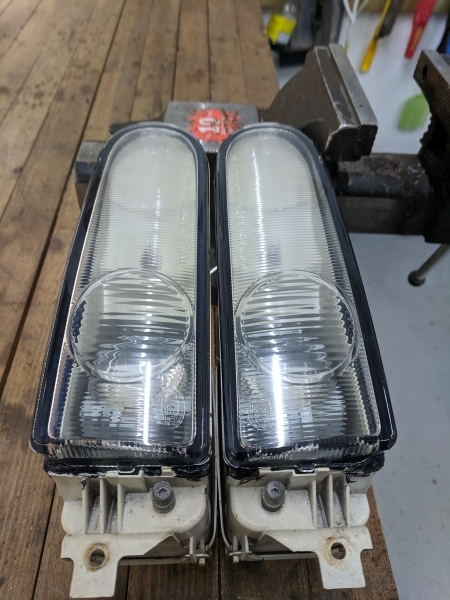 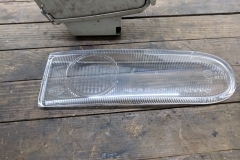 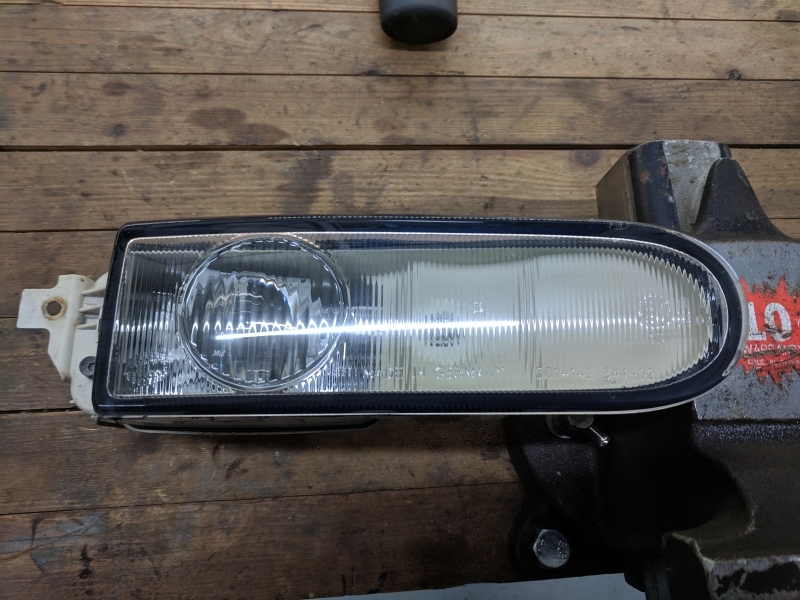 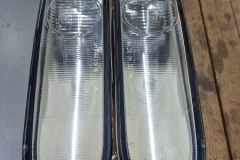 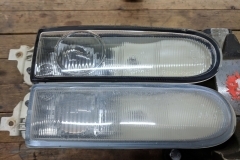 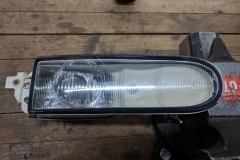 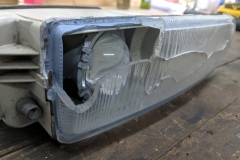 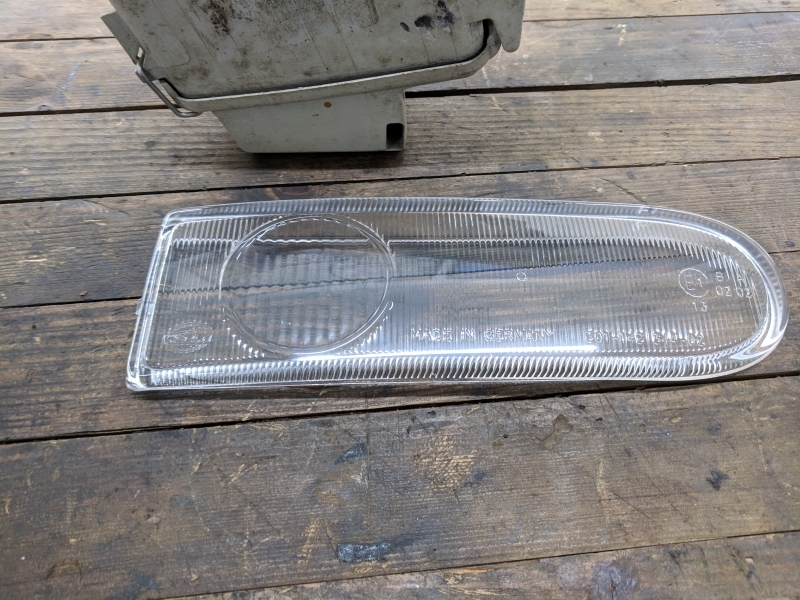 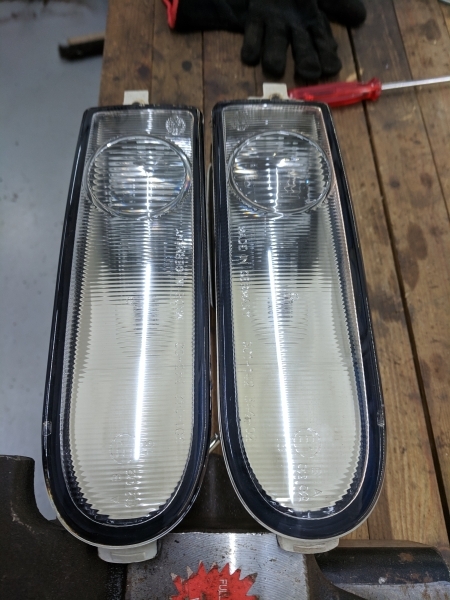 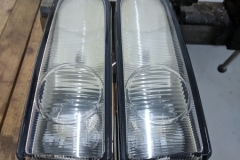 The fog lights were the same as an old Porsche 993 and I was lucky to find a pair on eBay which is noe en-route in the mail. 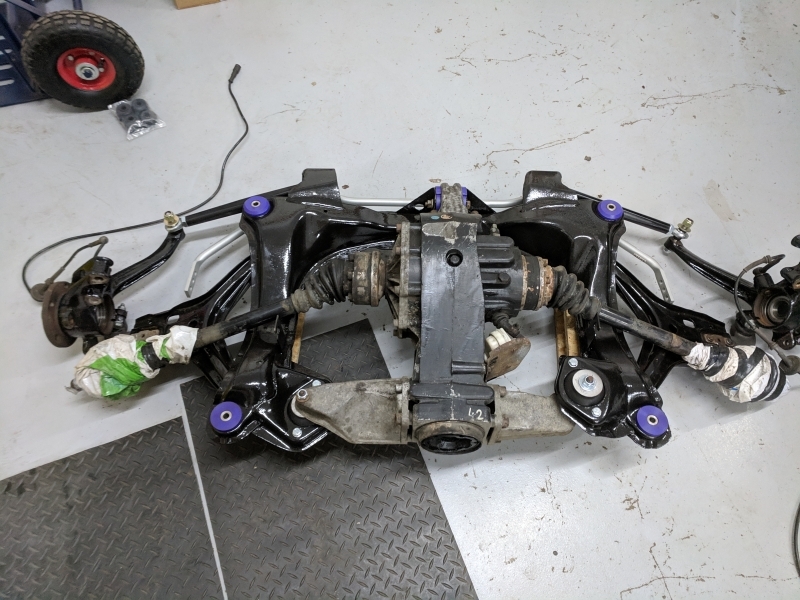 I’ve added an album with pictures from the suspension and subframe work so far. 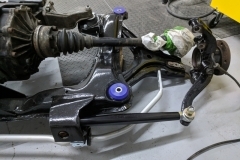 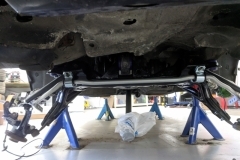 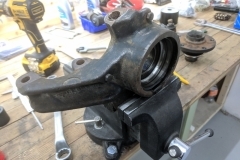 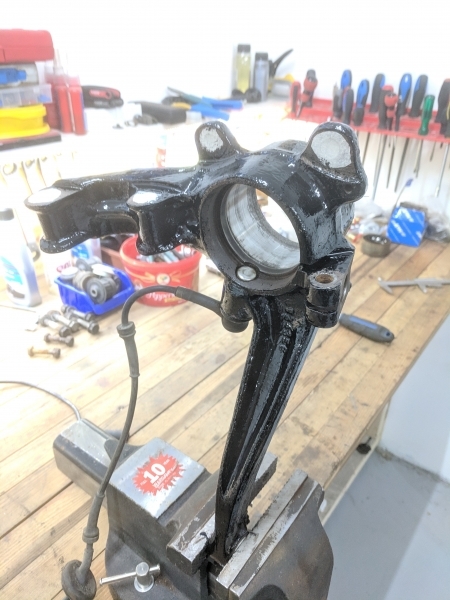 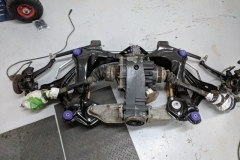 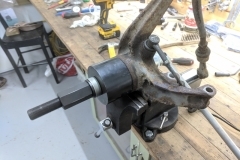 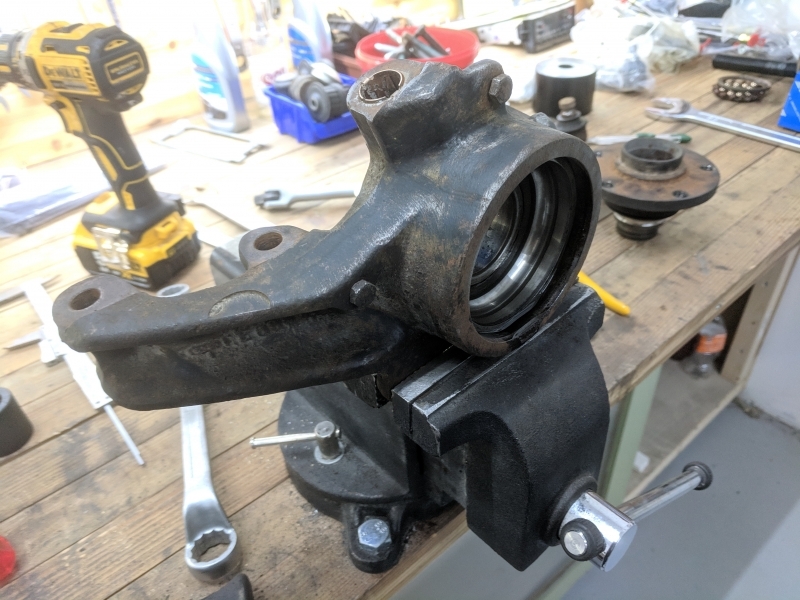 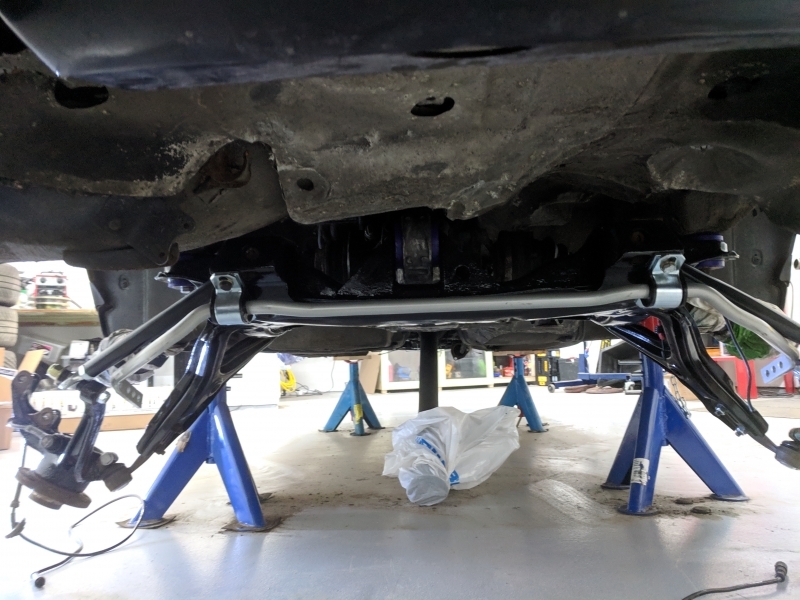 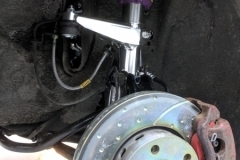 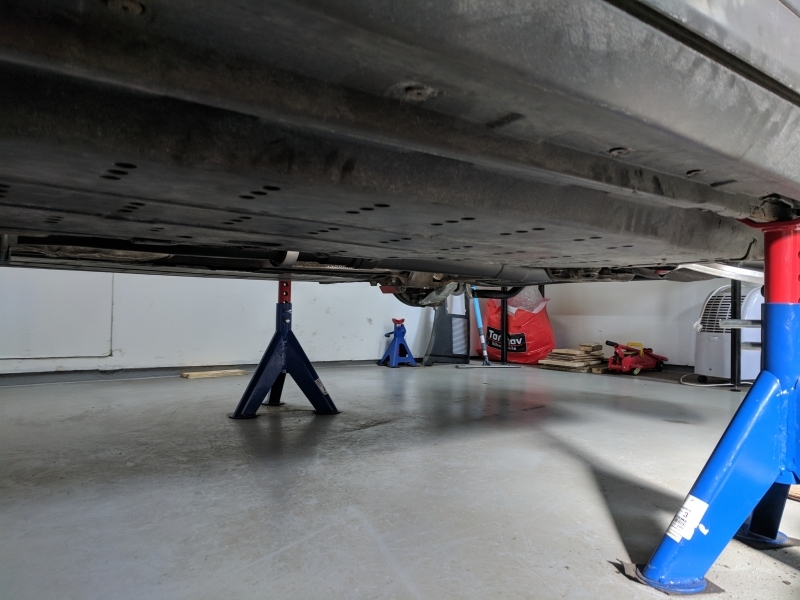 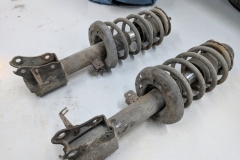 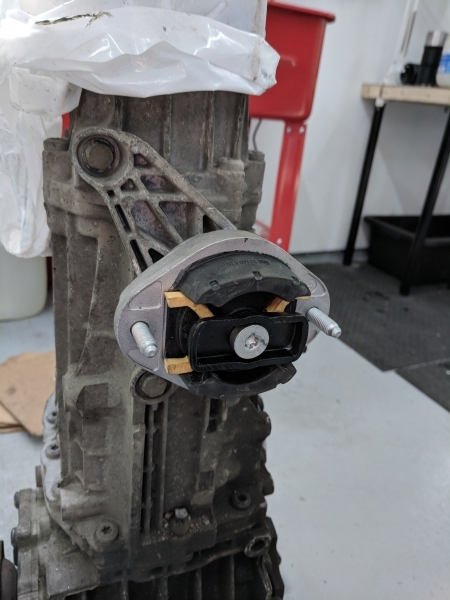 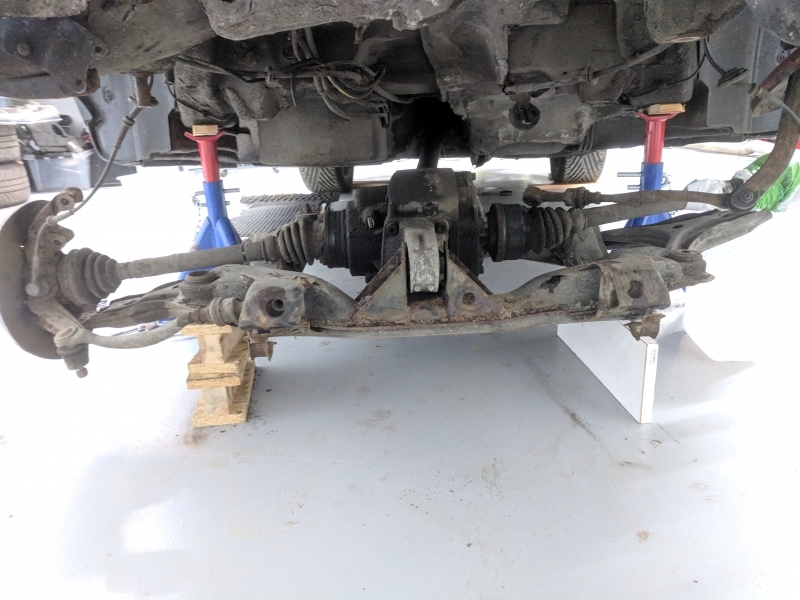 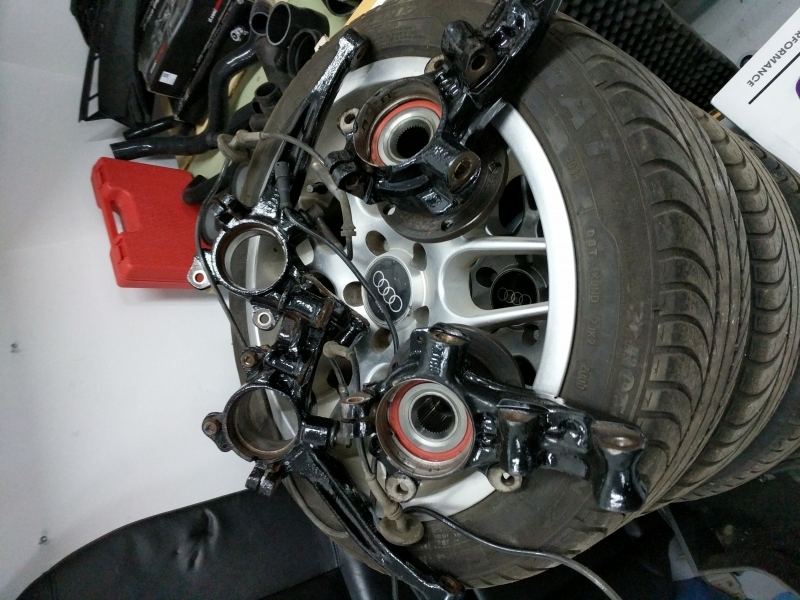 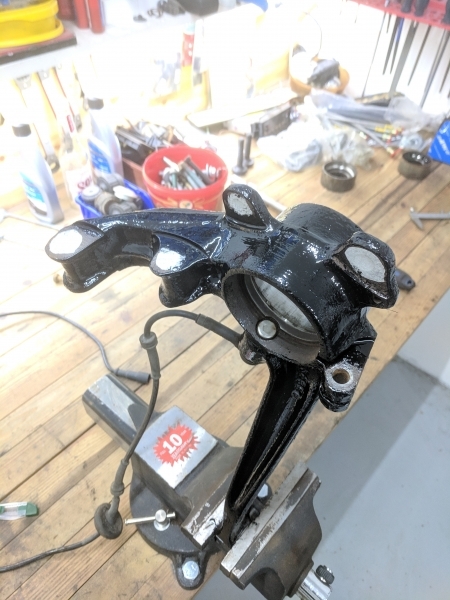 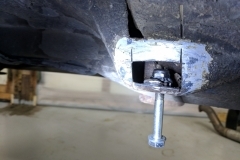 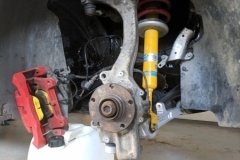 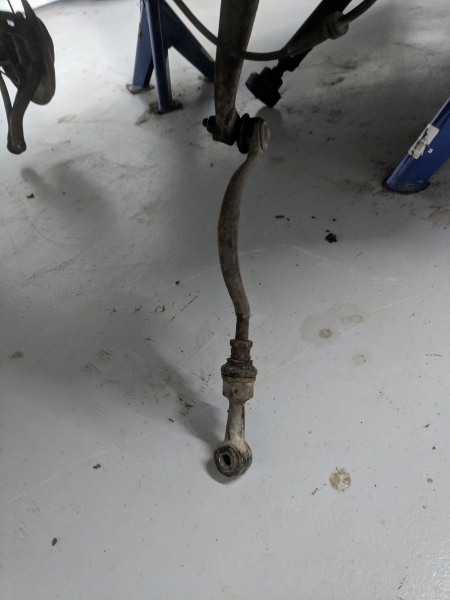 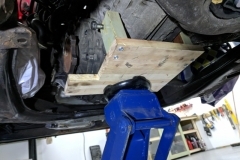 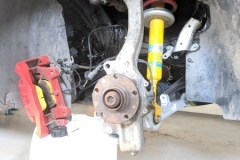 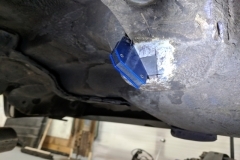 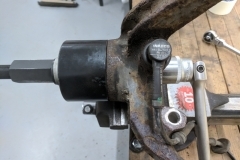 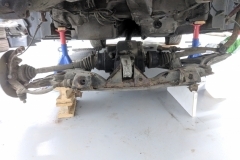 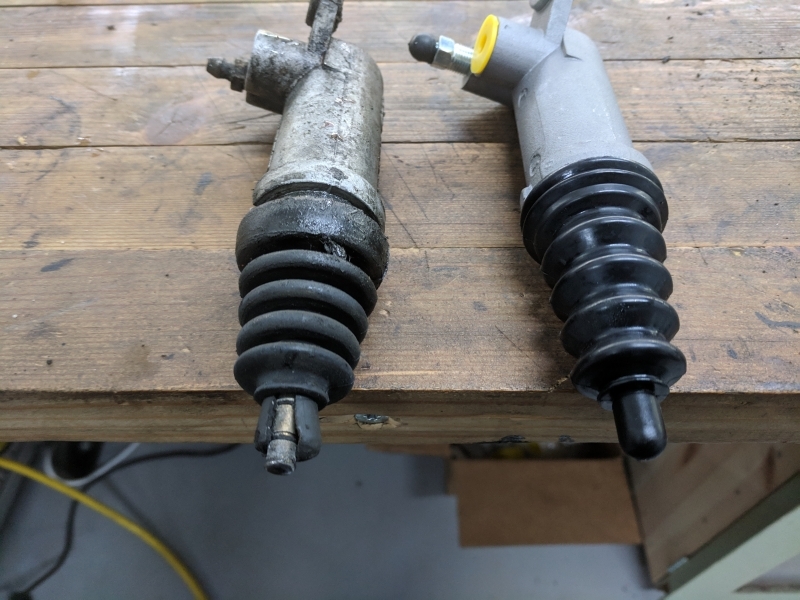 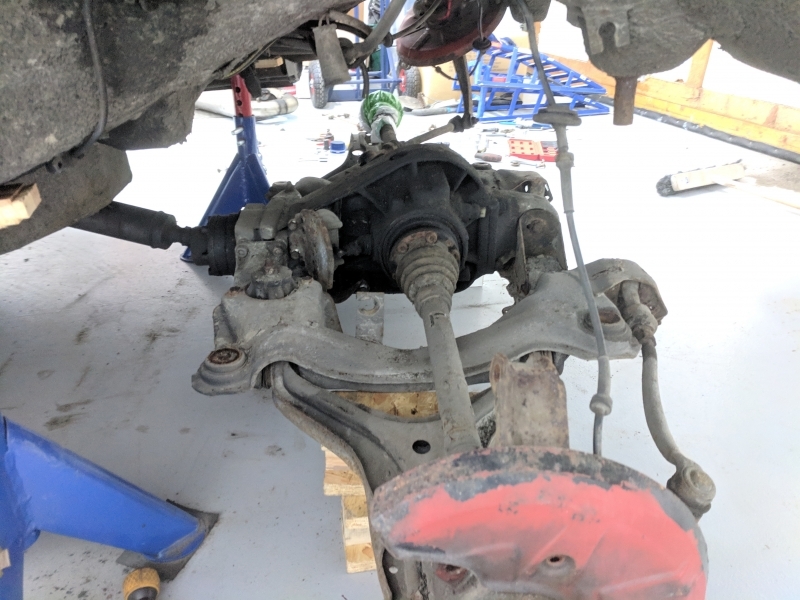 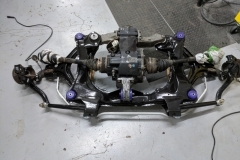 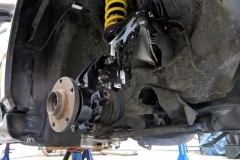 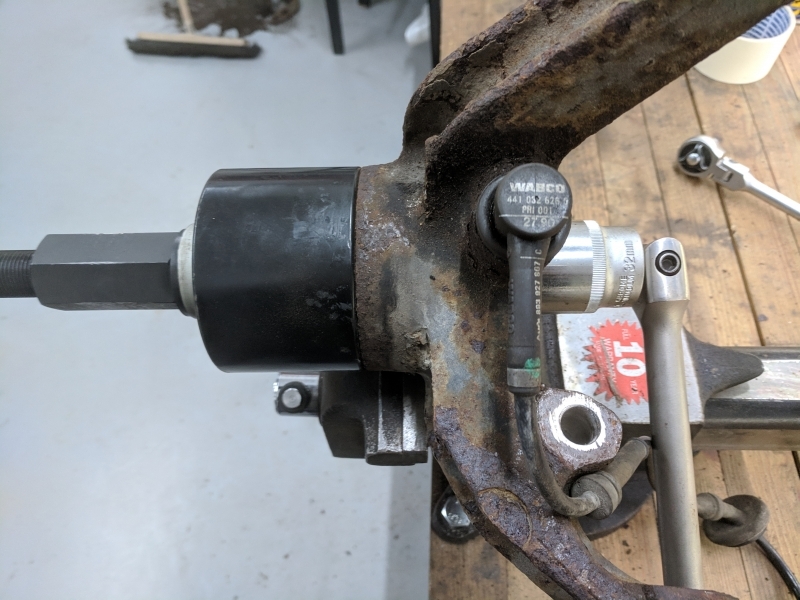 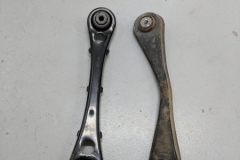 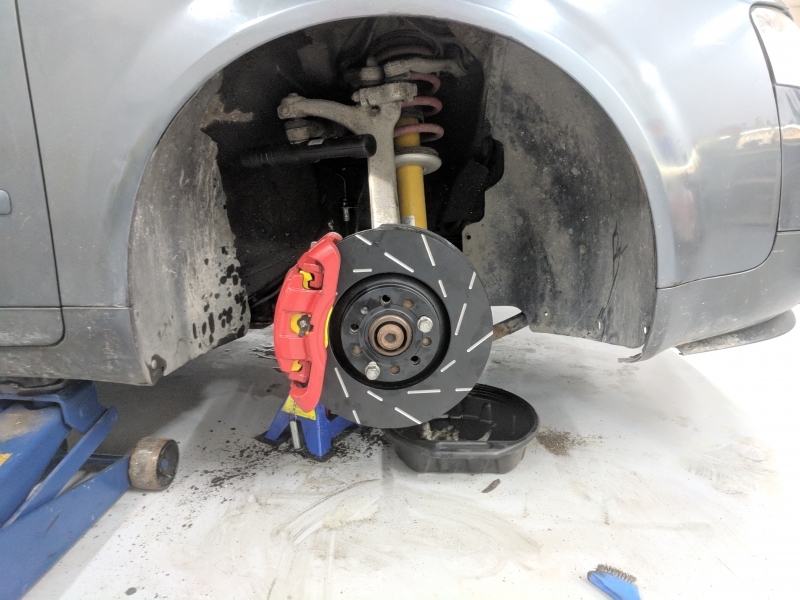 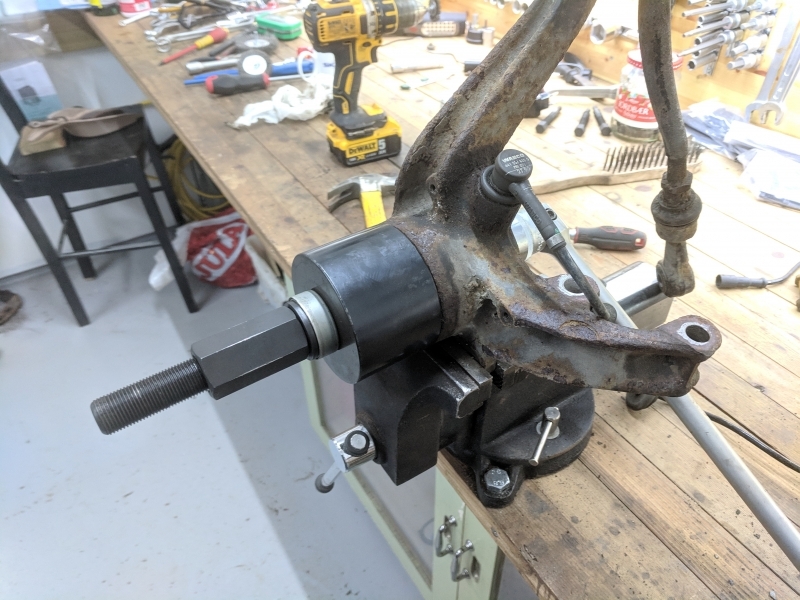 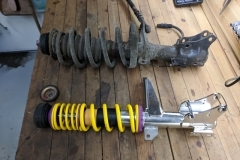 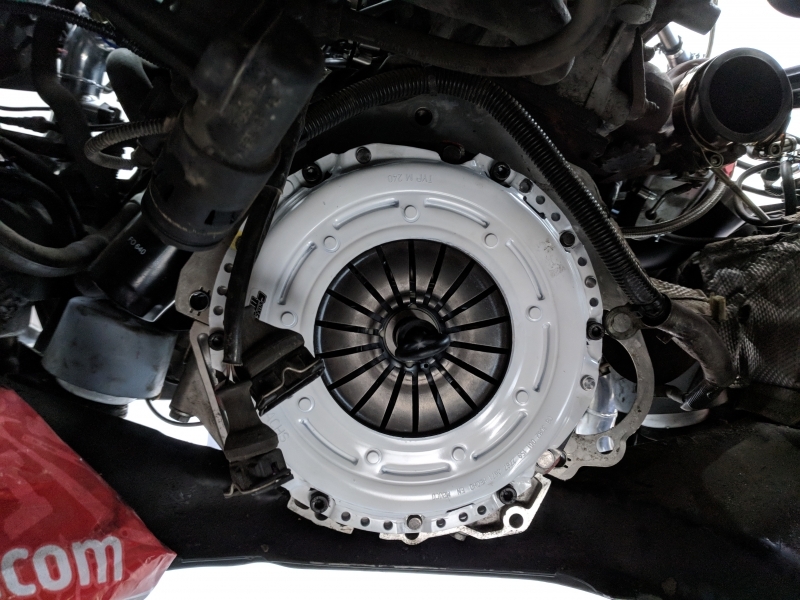 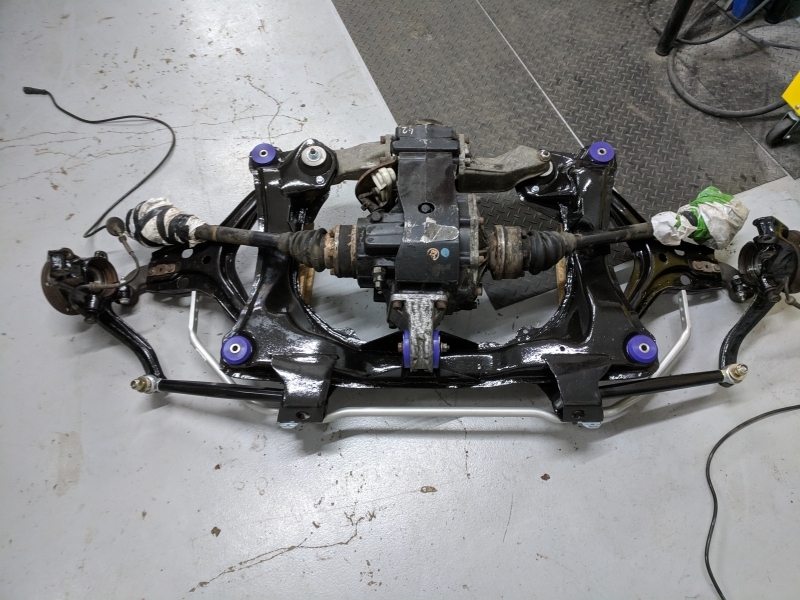 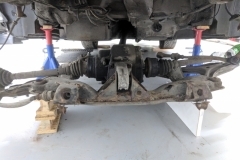 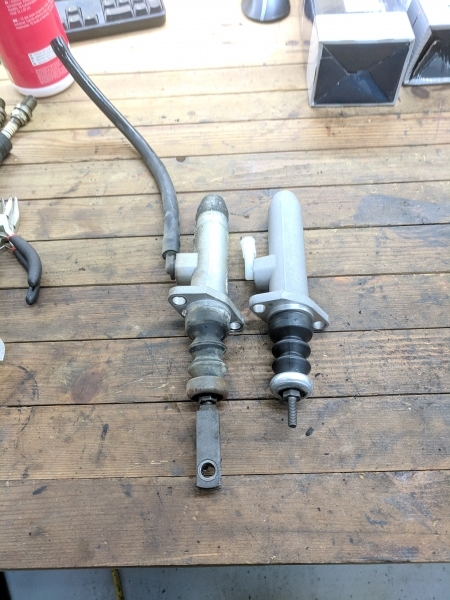 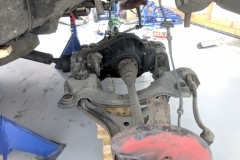 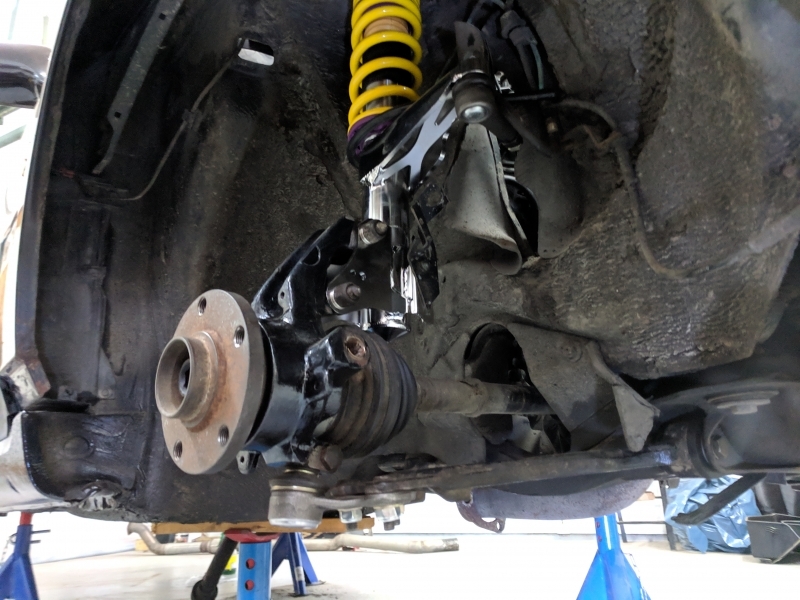 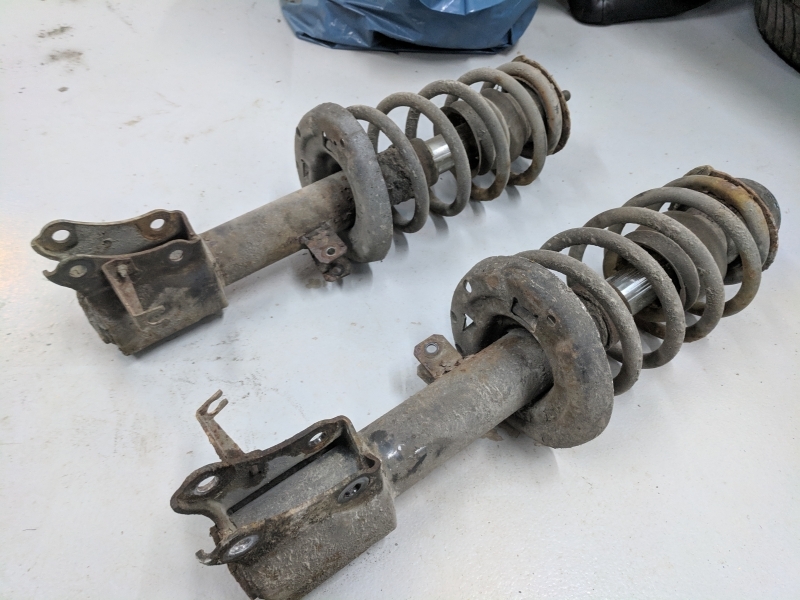 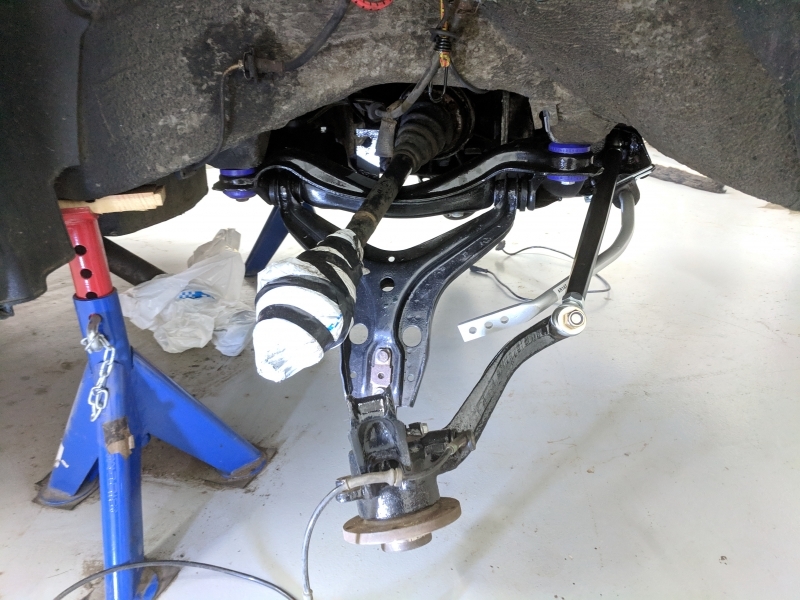 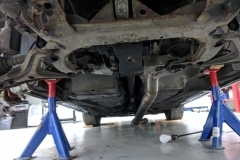 While the car was already on the jack stands and the driveline was disconnected, I decided to get new front suspension control arms and upgrade to polyurethane bushing as the original bushings were worn out. 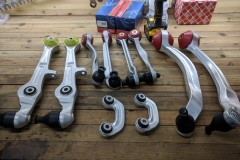 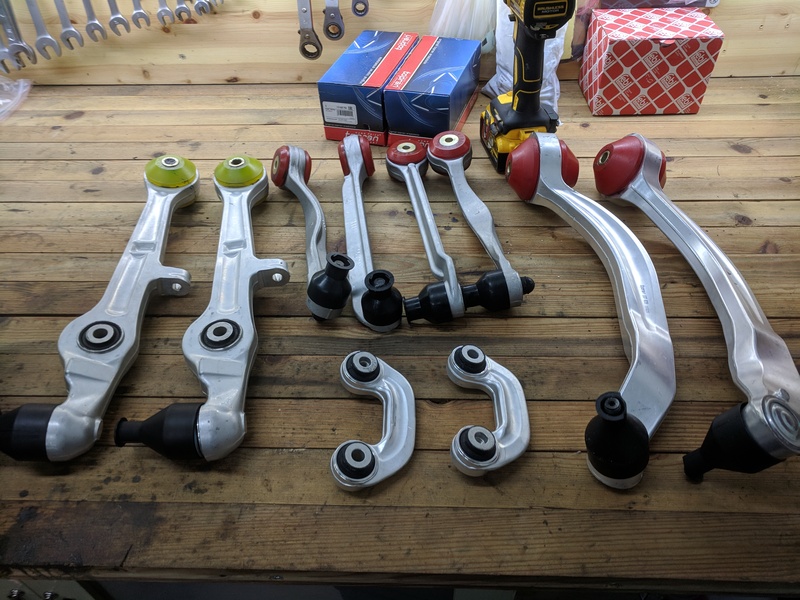 I got a complete set of front control arms and a complete set of bushings for street use (although I got an upgraded (track) piece for the lower-front control arm on both sides). 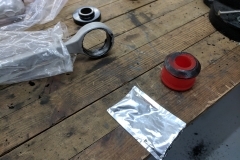 The tricky part installing these were to get the original rubber bushings out of the control arms. 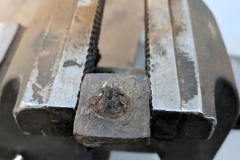 I don’t have a hydraulic press which ment getting the hammer and angle grinder out. 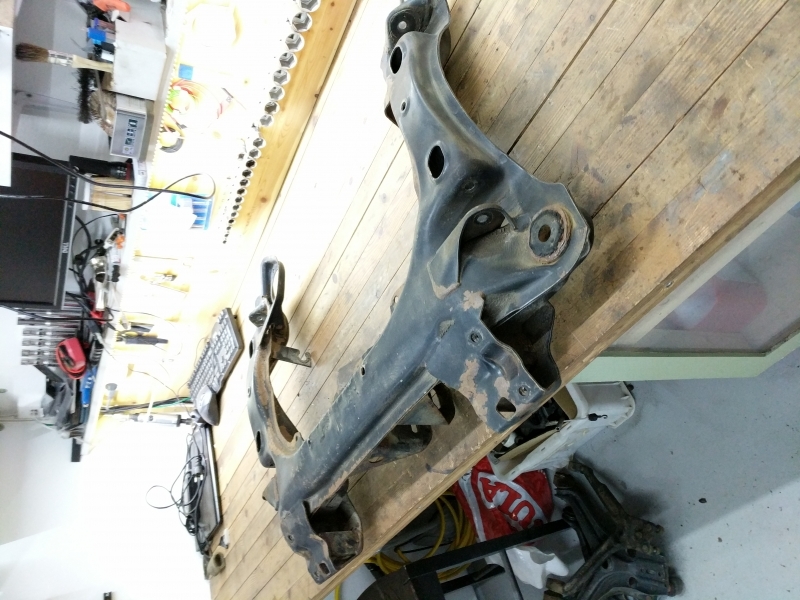 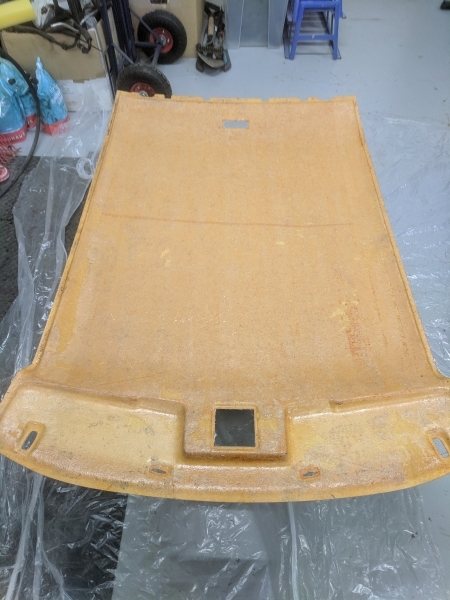 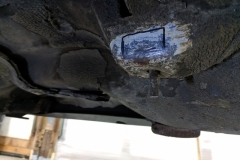 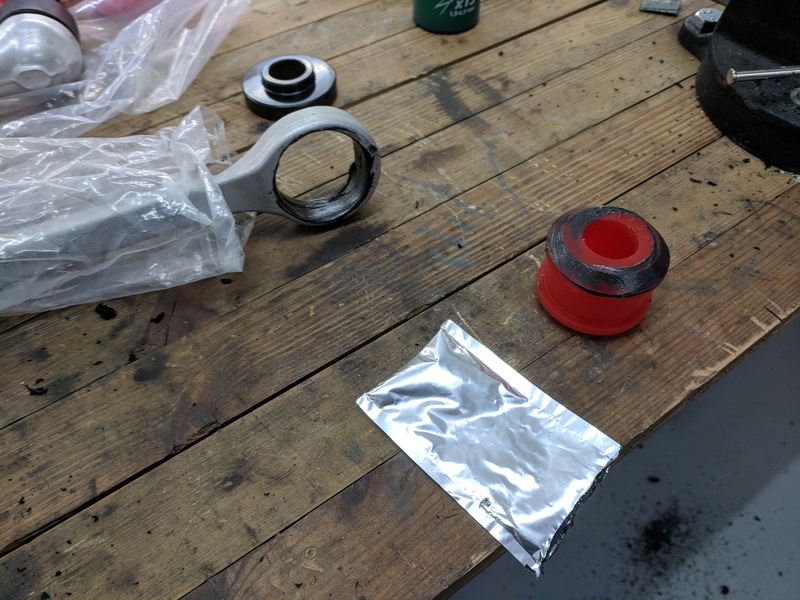 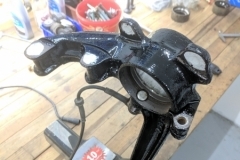 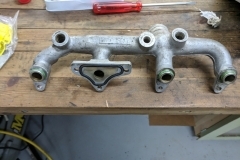 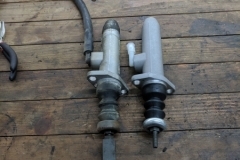 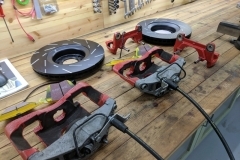 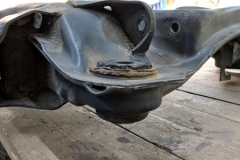 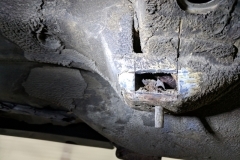 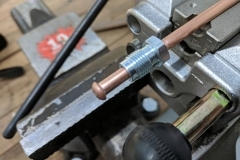 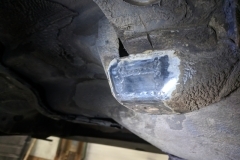 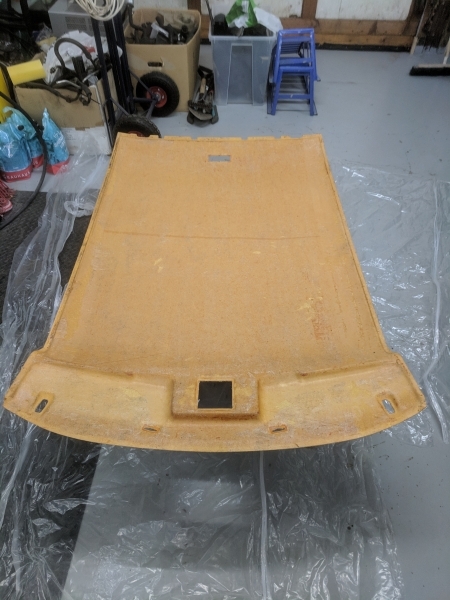 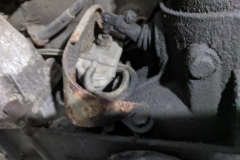 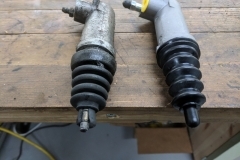 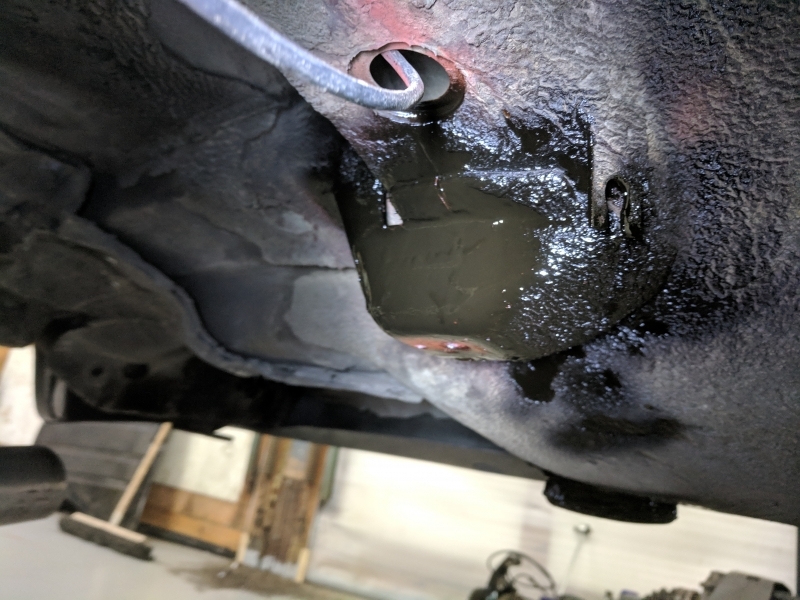 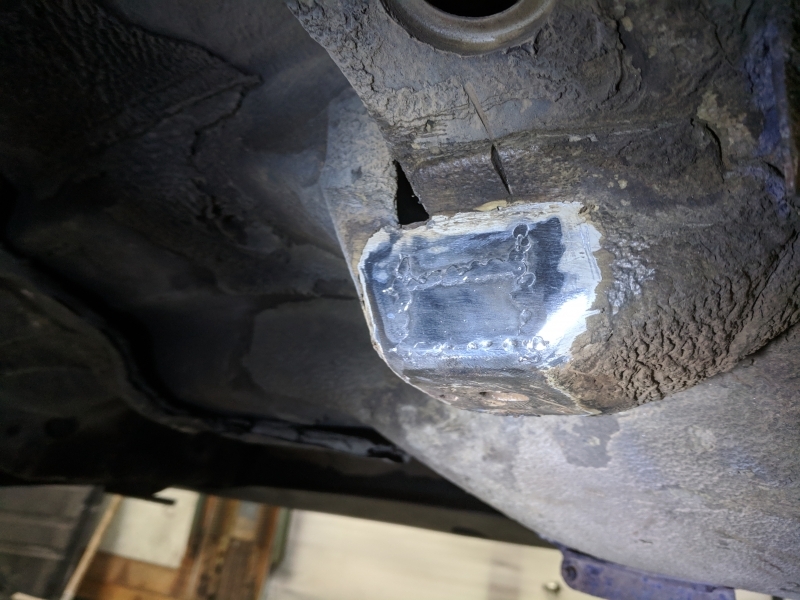 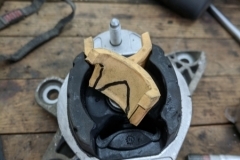 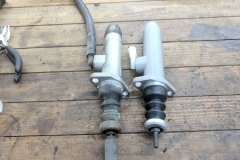 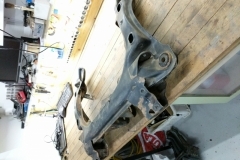 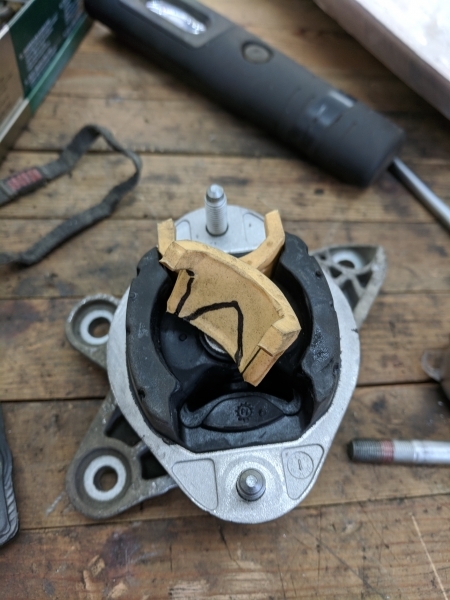 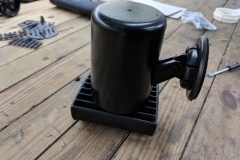 After some struggling, the original bushings came out without damaging the control arms and the polyurethane bushings were installed using the supplied grease. 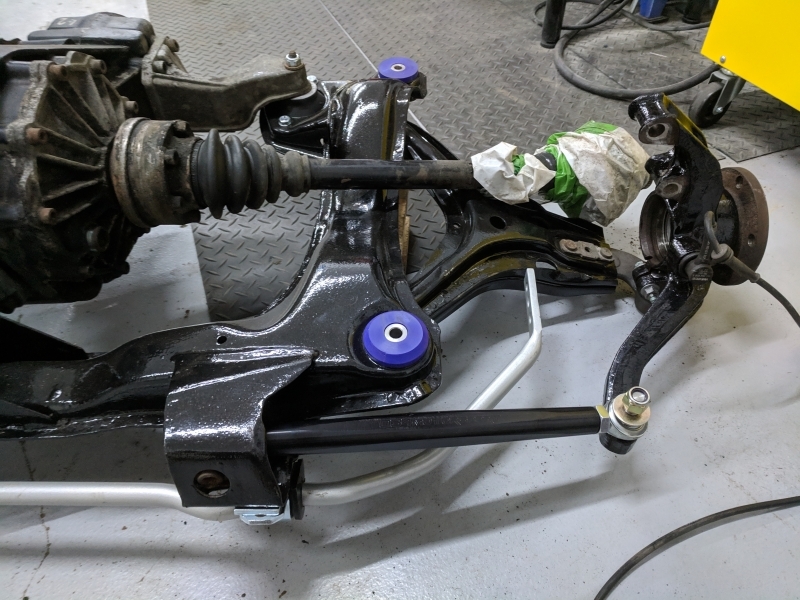 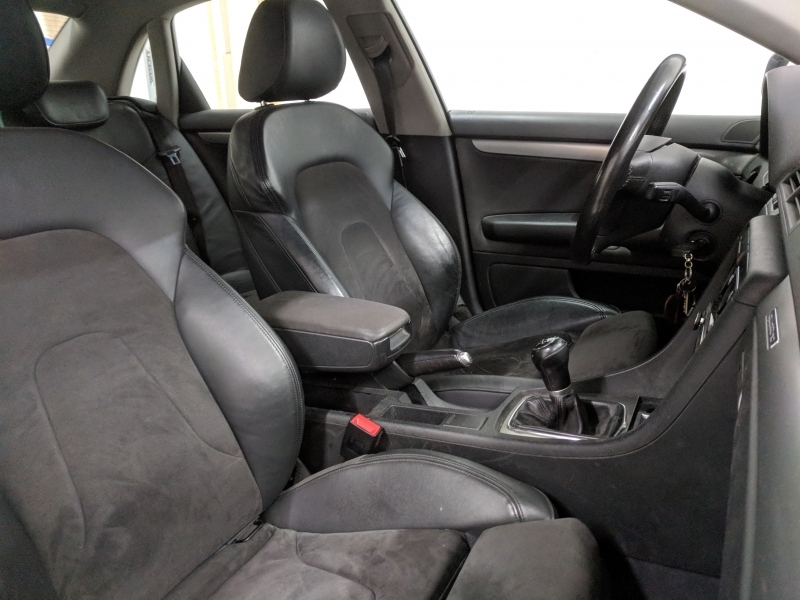 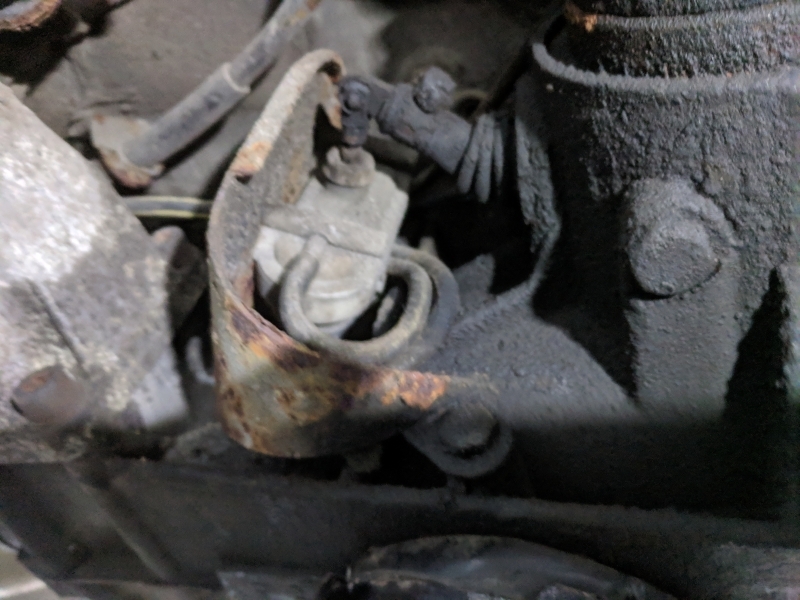 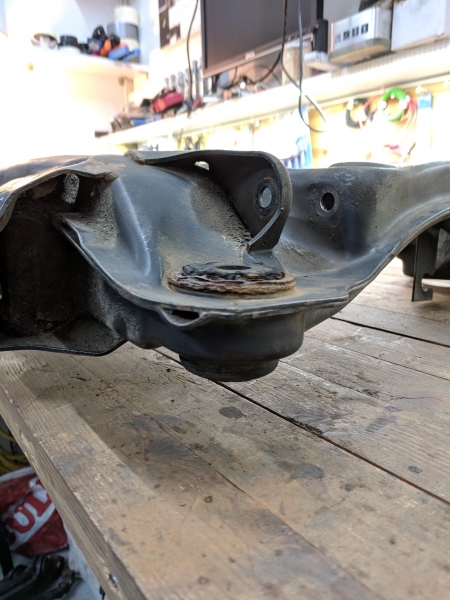 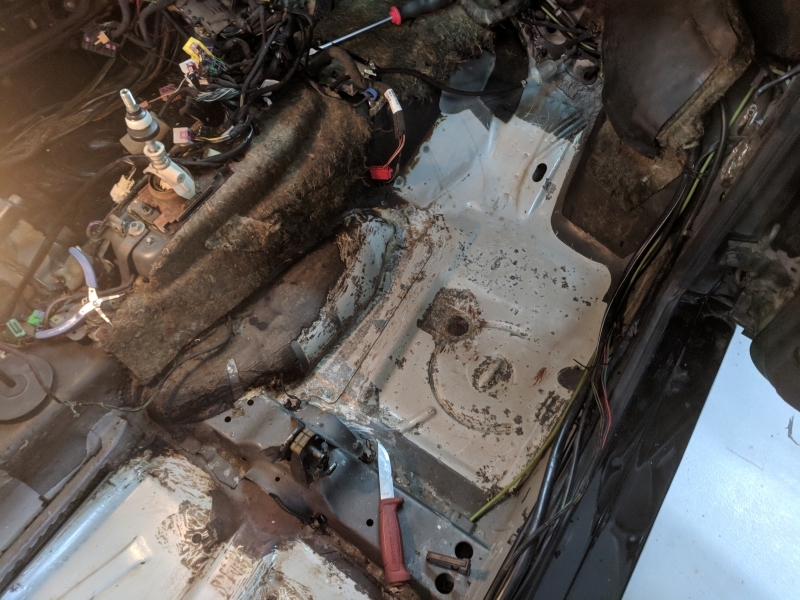 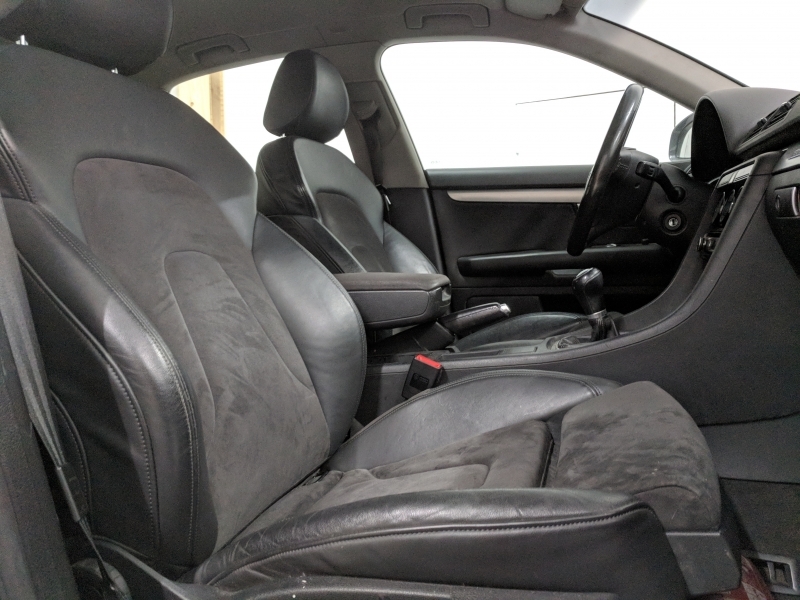 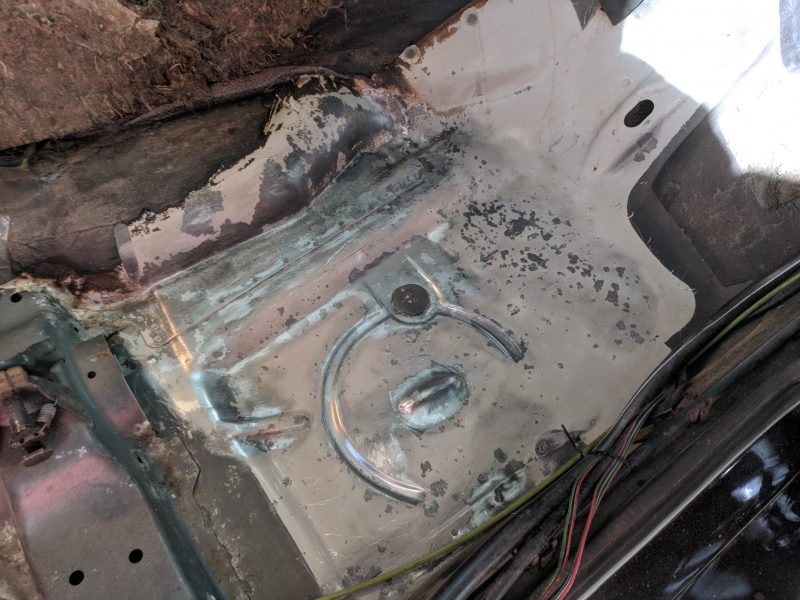 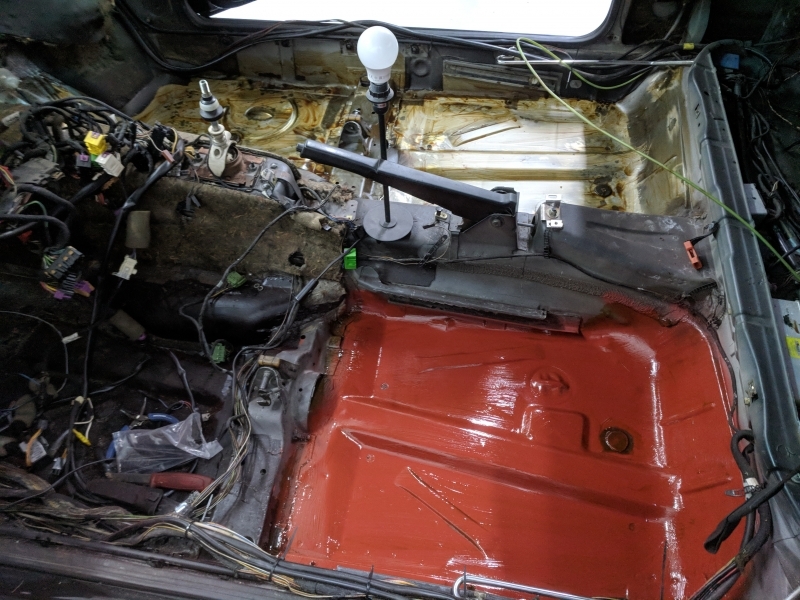 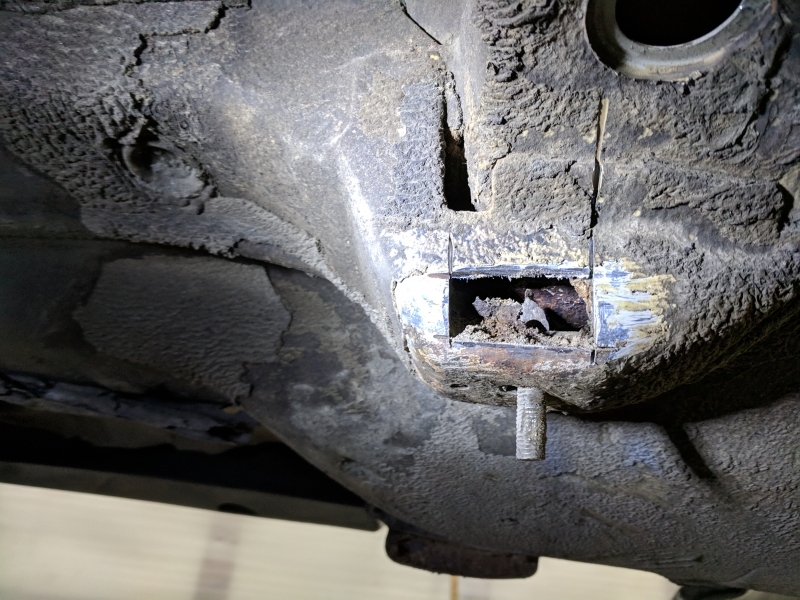 I also had to replace the rear passenger side control arm as it had some damage and was somewhat bent… I also painted the inside of the wheel wells with an anti-rust/corrosion solution and washed all the parts that had to come off. 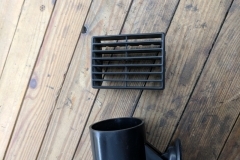 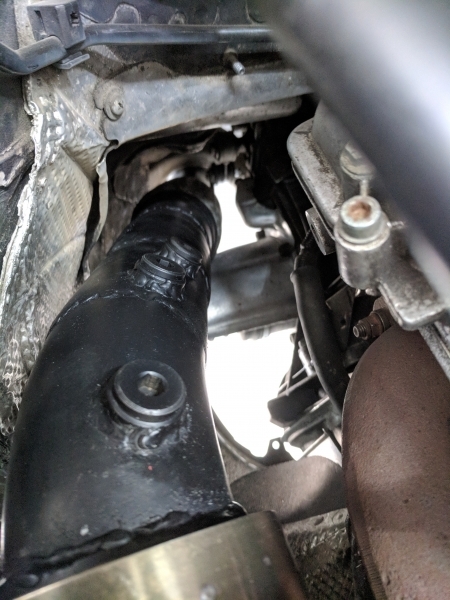 I also upgraded the exhaust downpipe as I only had done the first 30cm or so when upgrading the turbo. 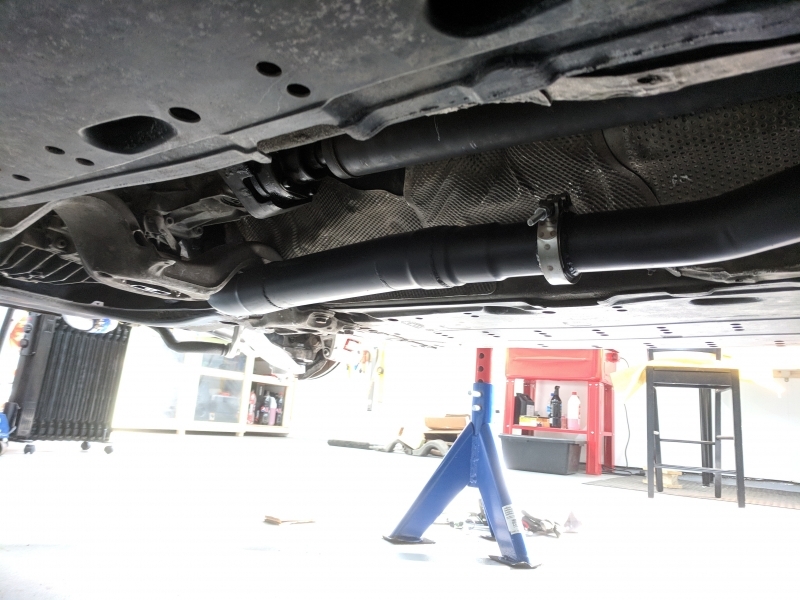 I decided to go for a 3in pipe all the way back to the 2.5in Simens sports exhaust. 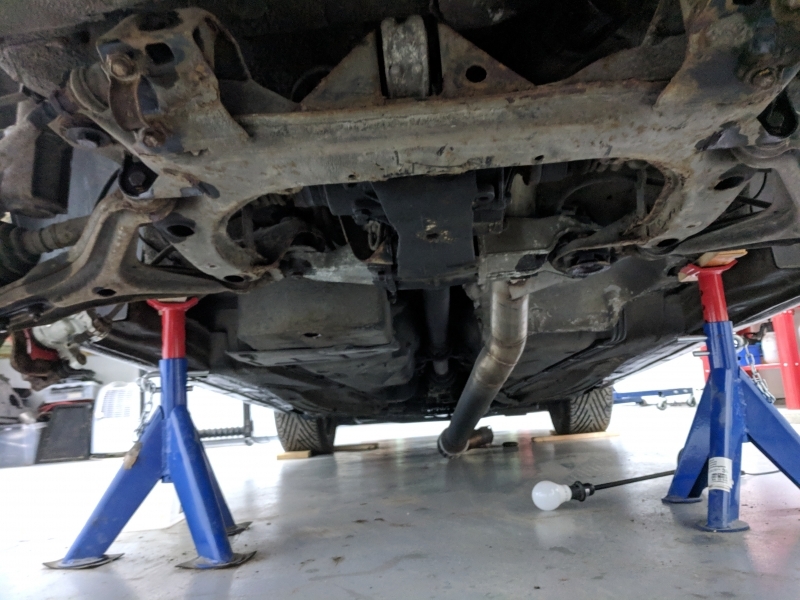 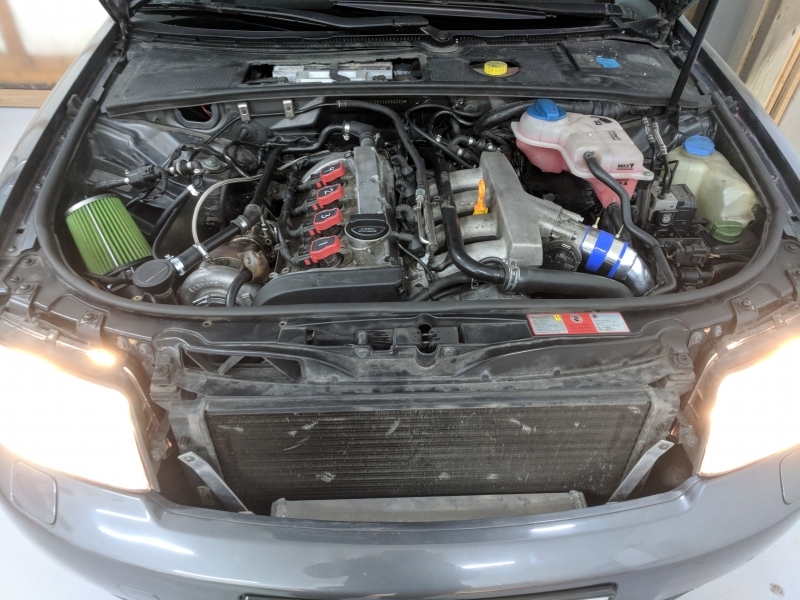 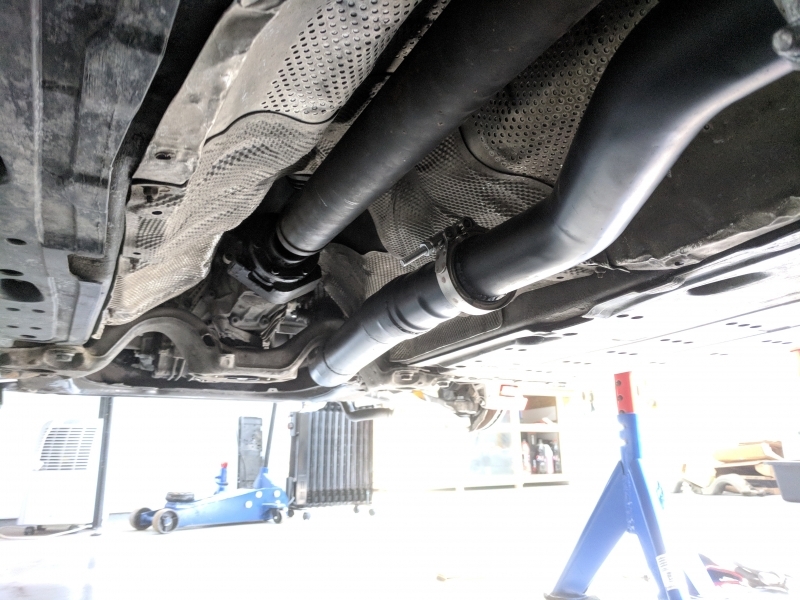 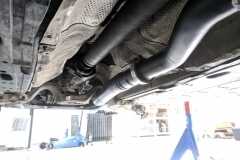 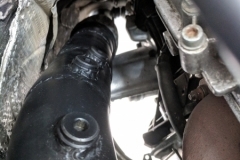 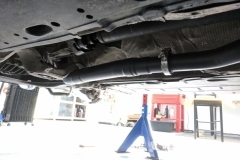 In addition to this, I fitted a flex-joint so the exhaust can move without damaging the turbo as well as a v-band joint for easy removal in the future. 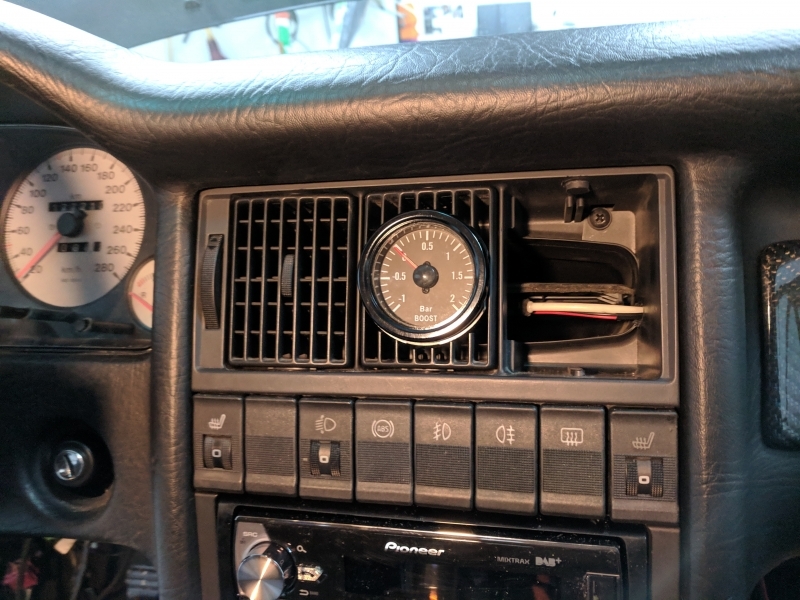 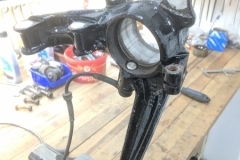 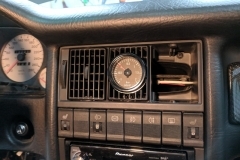 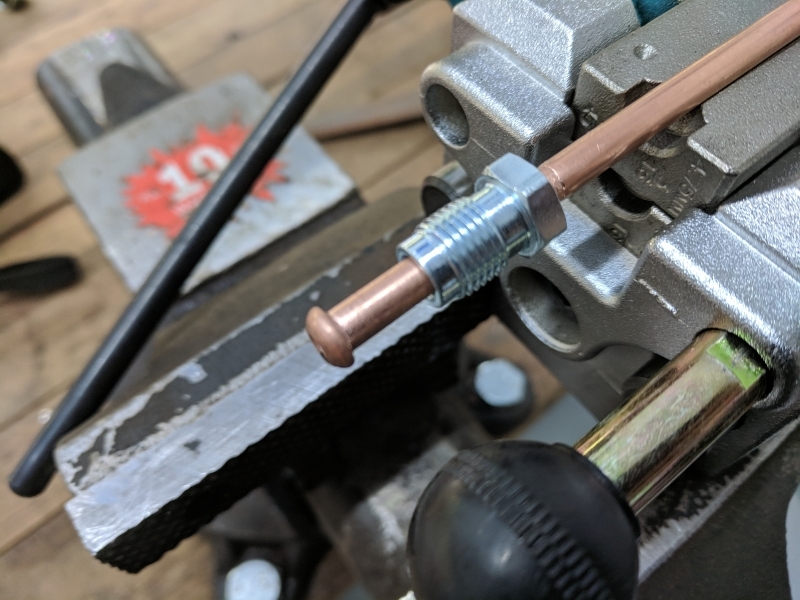 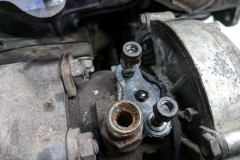 I also fitted a third lambda-connector in case I want to install a wide-band air-fuel gauge in the future. 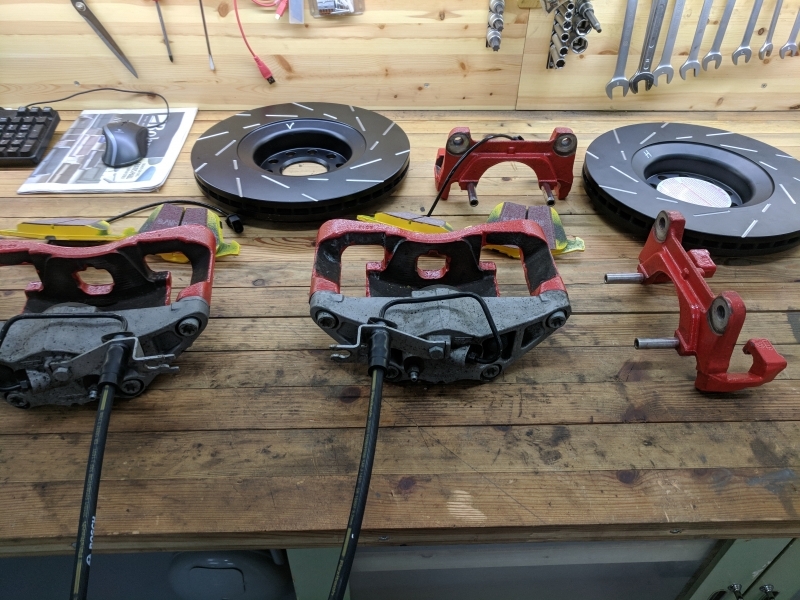 As the Audi A4 B6 standard car is not known for its awesome brakes, I figured it was time for a brake upgrade. 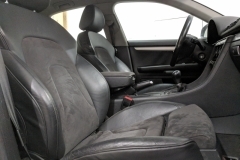 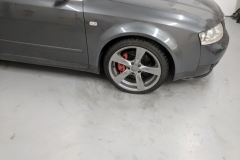 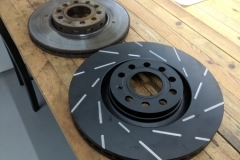 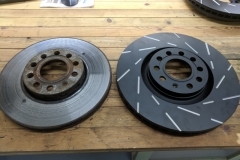 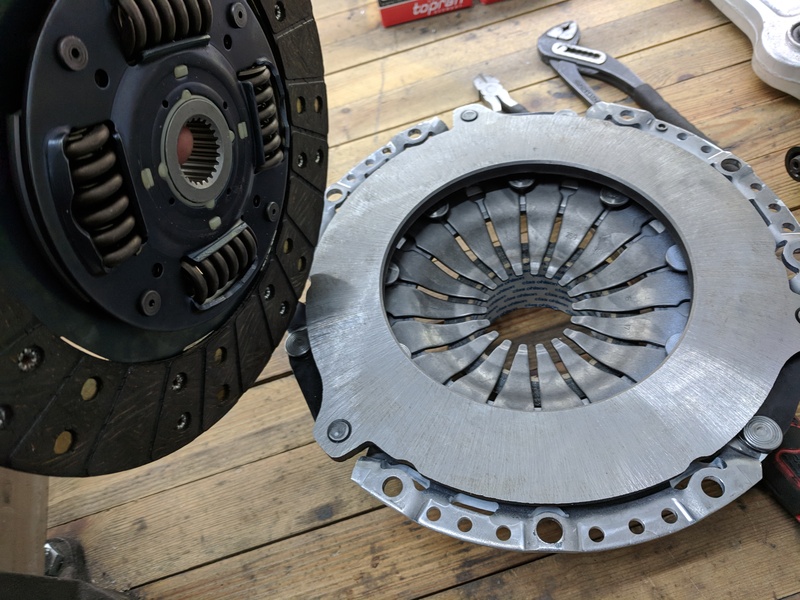 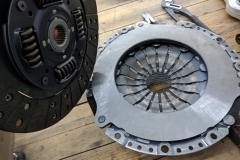 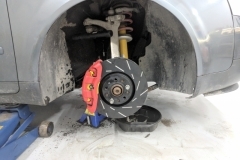 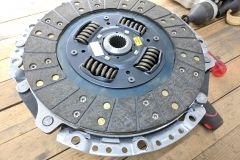 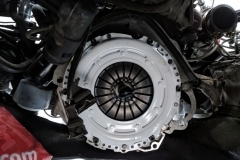 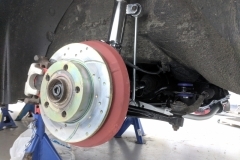 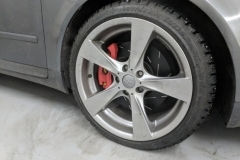 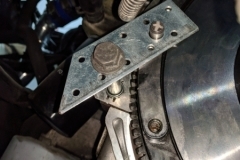 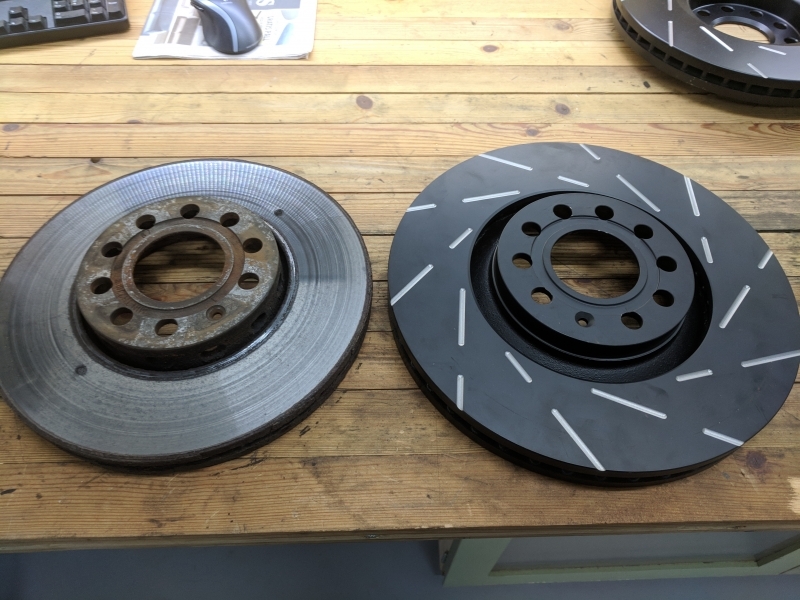 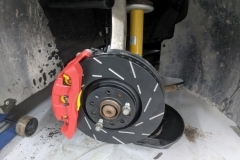 I spent some considerable time researching brake upgrades for the car and after a while landed on a set up that wouldn’t cost a years pay (read big brake upgrade) while still providing a big improvement in braking performance. 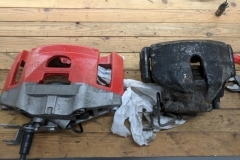 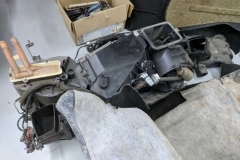 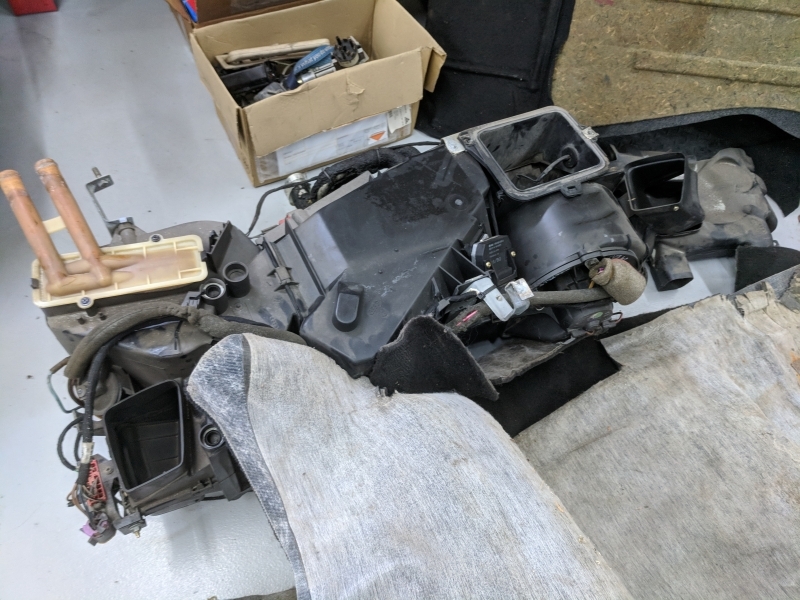 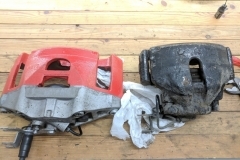 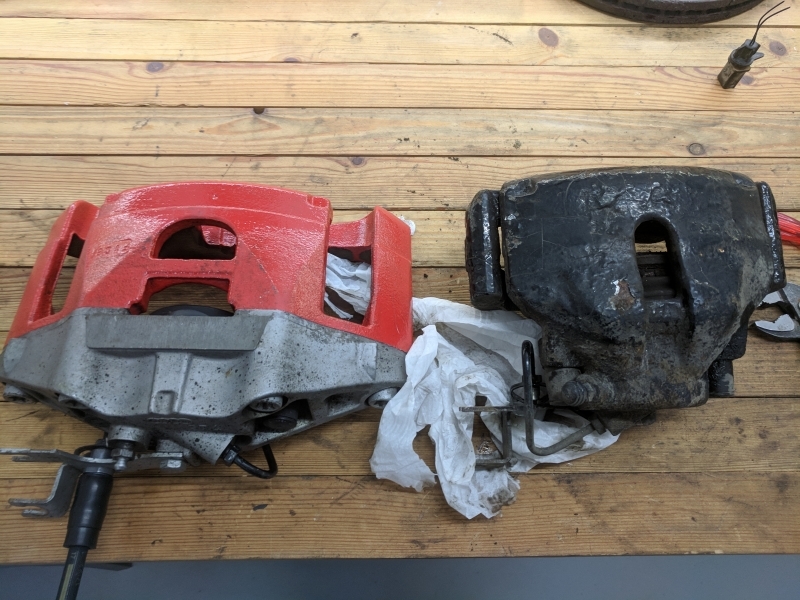 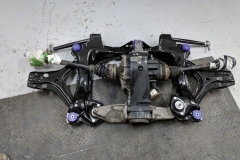 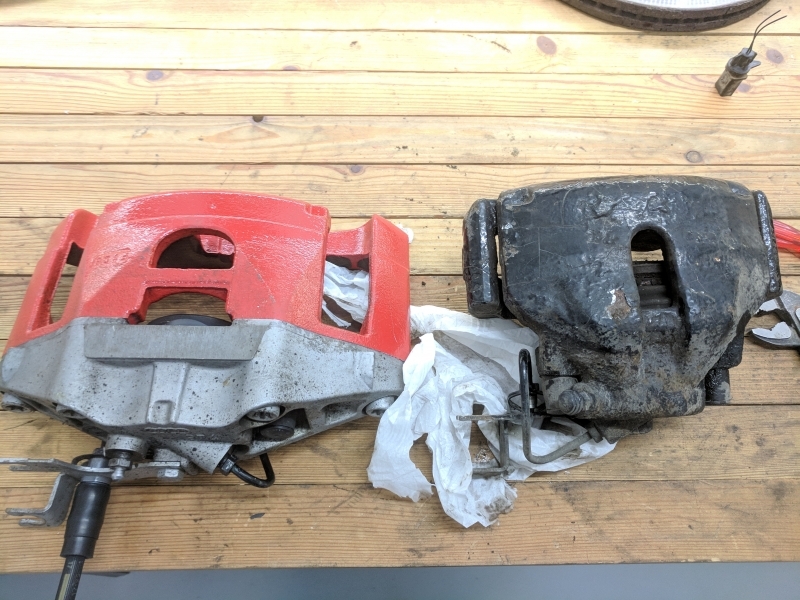 I managed to track down a set of callipers and brackets from an 2006 A4 B7 2.0T avant witch had the 320mm front disks. 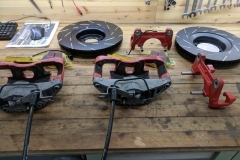 These are bolt on replacement callipers for the A4 B6 which fits the project perfectly. 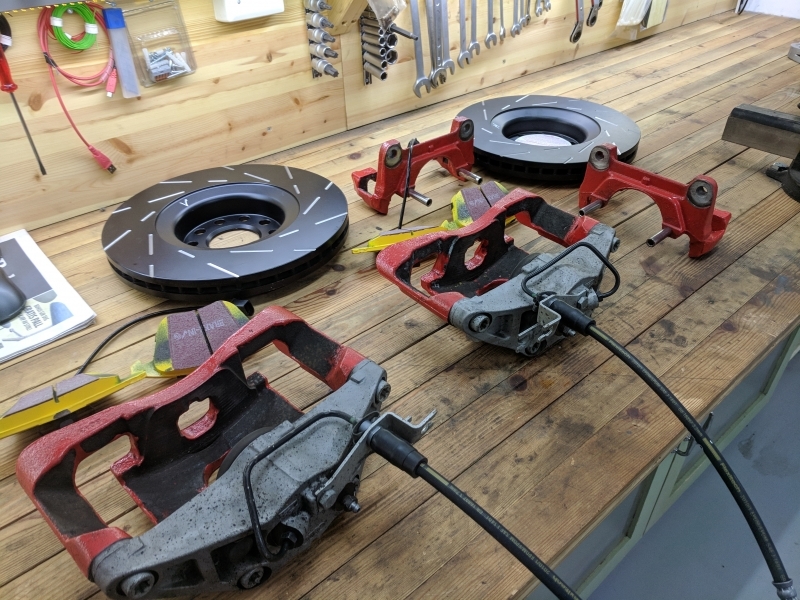 In addition to the callipers, I bought a set of yellow-stuff brake pads and slotted 321mm ventilated disks produced by EBC. 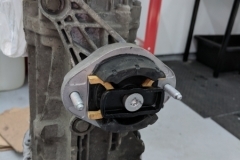 Since then, I’ve heard that people have had bad experiences with the yellow-stuff brake pads but I decided to give them a try and see how they behave. 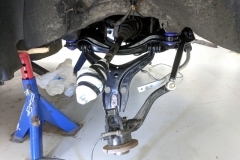 I also bought a new set of Bosch rubber brake lines to compliment the new callipers. 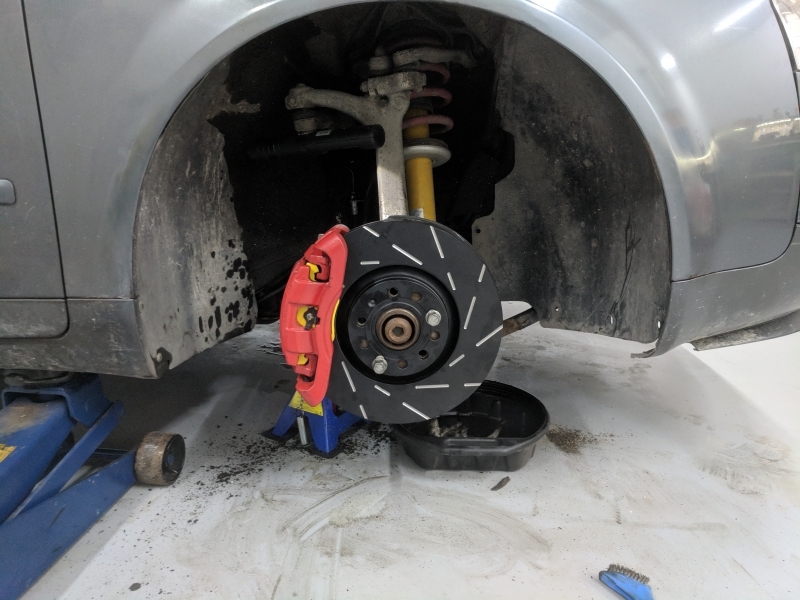 As of tonight, I replaced the right side brakes before i got hungry and decided to get some food. 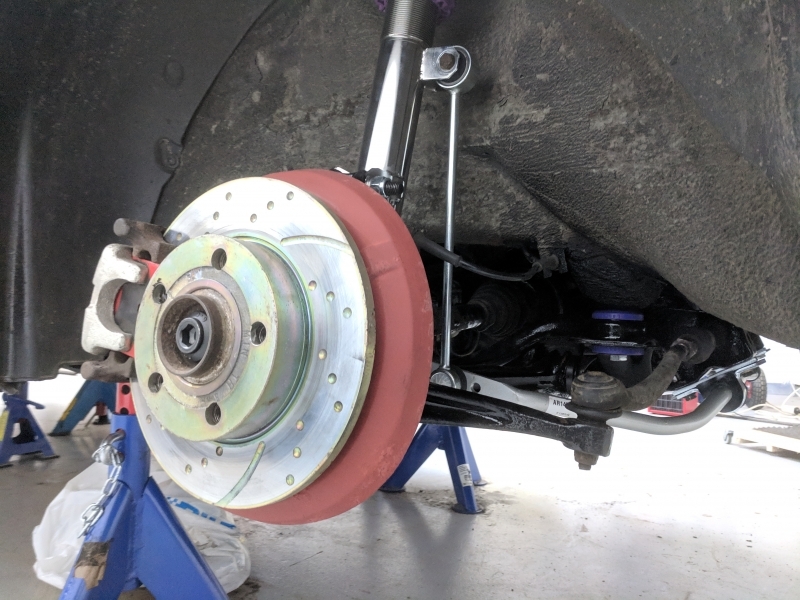 The brakes fitted perfectly and bolted on without issues. 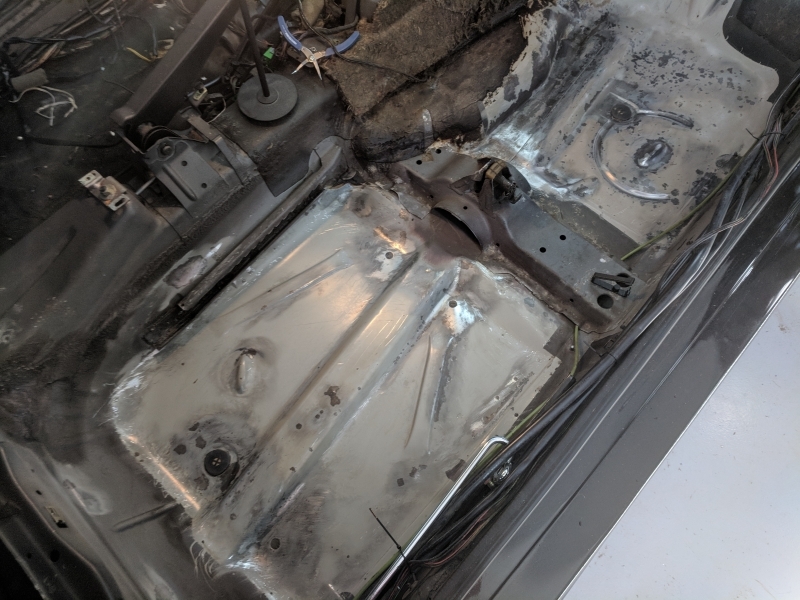 I’ll update after I’ve done a test-run with both sided replaced. 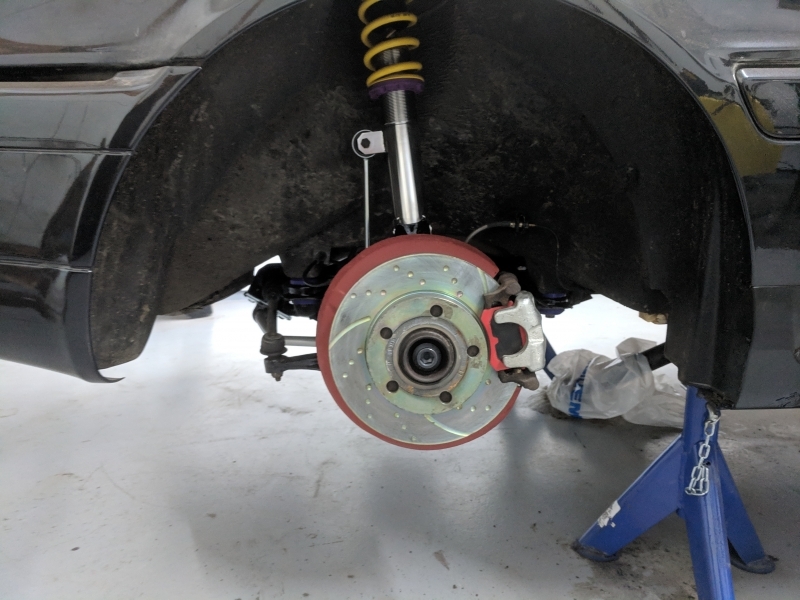 Update: Finished replacing and bleeding the front brakes and took it for a test run. 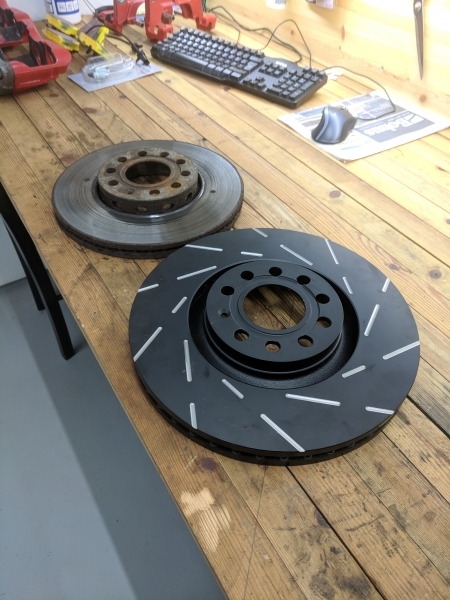 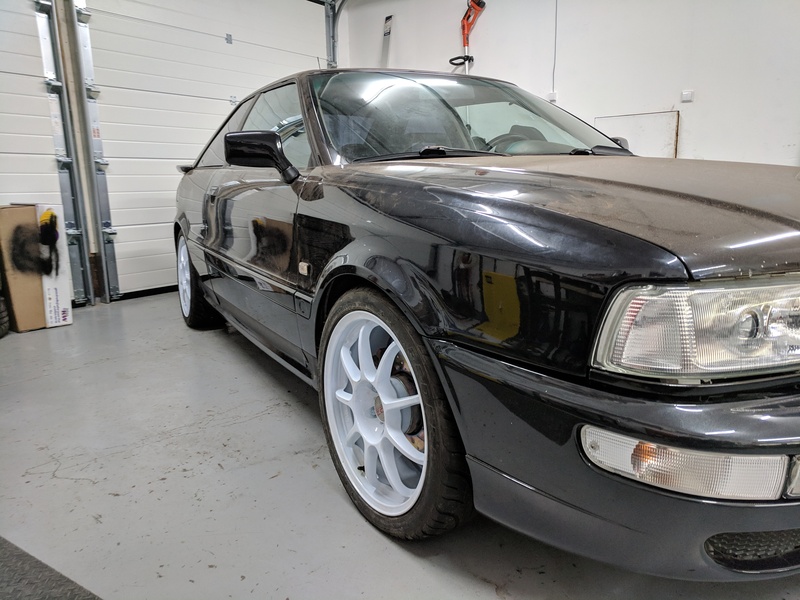 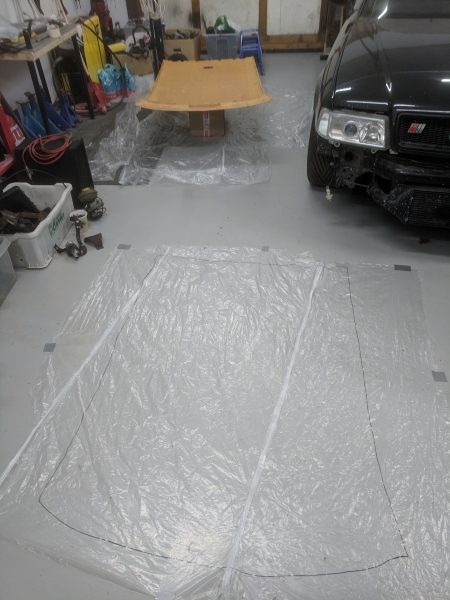 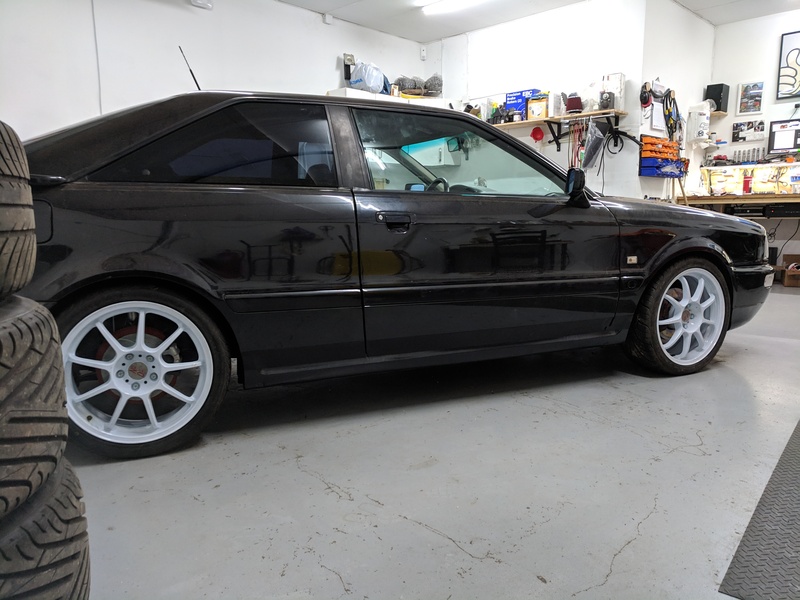 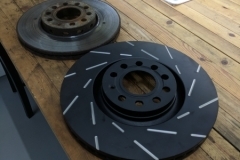 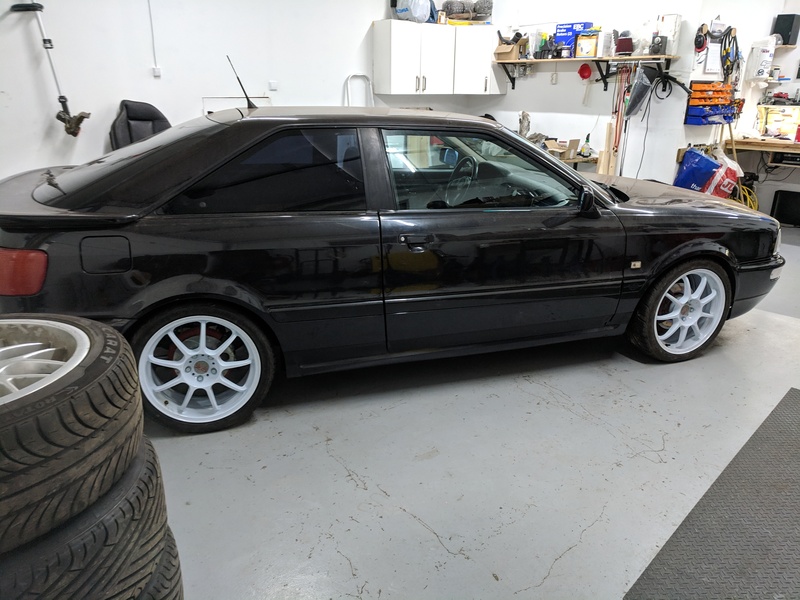 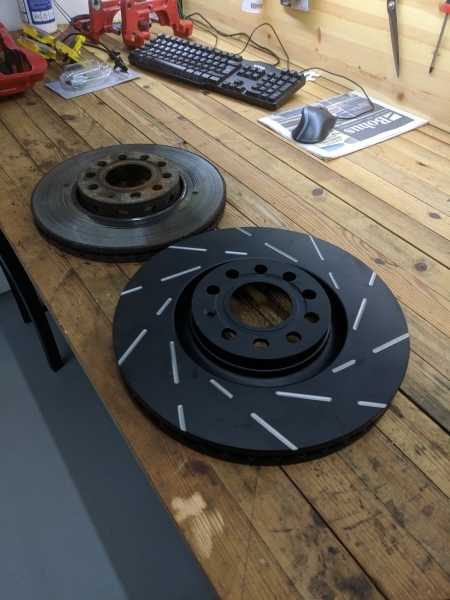 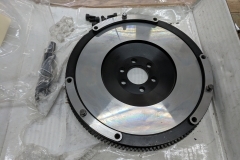 Unfortunately, it was snowing, so I couldn’t do any hard brake tests, but I drove it for a good half an hour to get the protective film off the disks and pads. 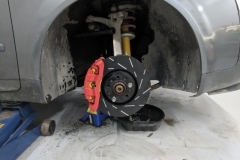 It seems to work pretty well and I defiantly noticed an improvement over the standard disks and pads. 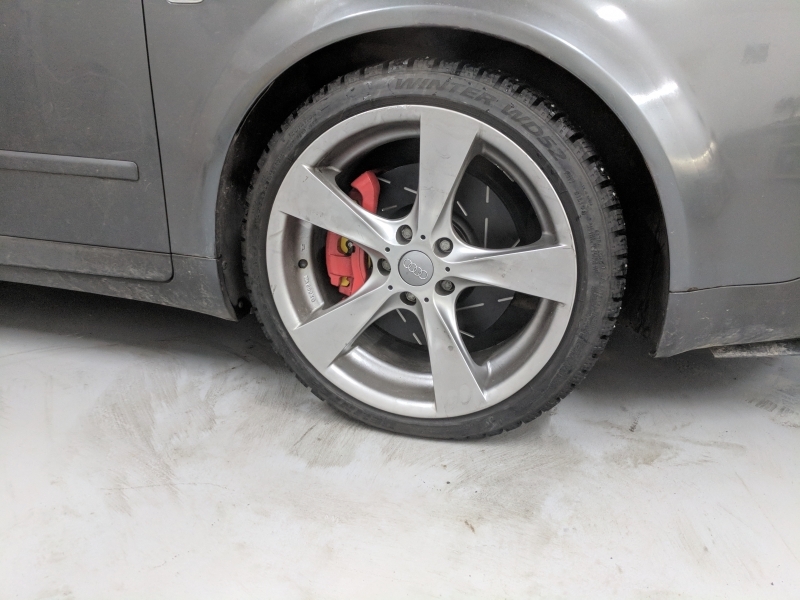 I took it out for a ride a few days later and noticed that the brakes has reduced performance when cold – this was expected though, and shouldn’t be a problem. 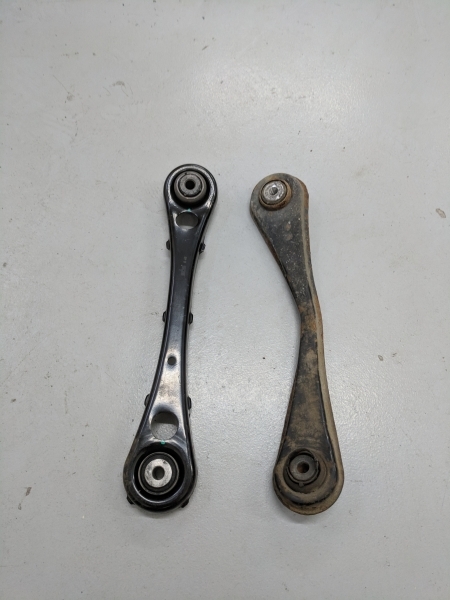 All in all, very happy with the upgrade. 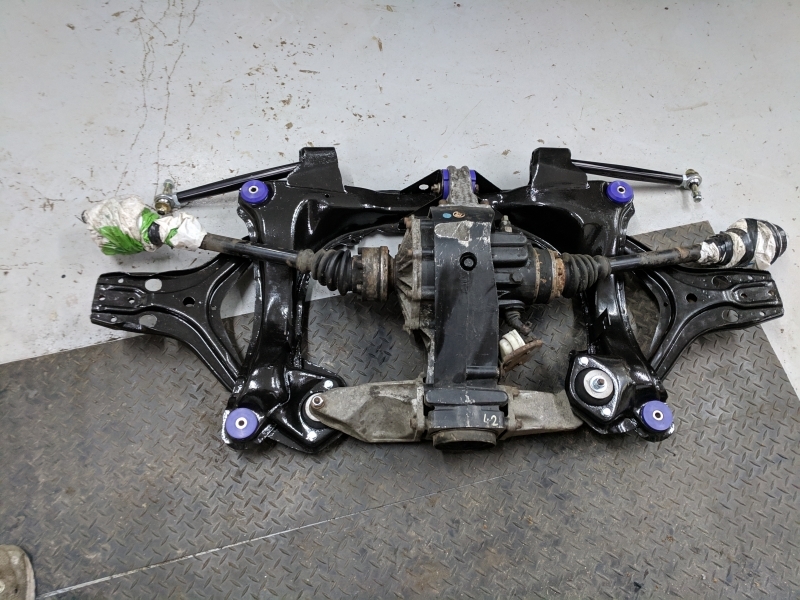 Time to make a plan for replacing the rear as well. 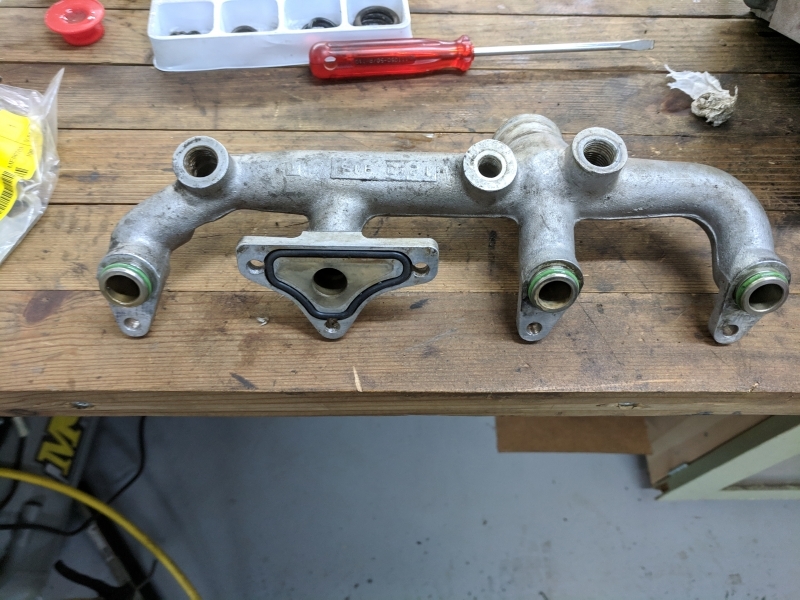 I’ll write down the part numbers in case someone would like to do the same upgrade. 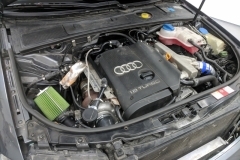 The author is a network technician by trade and a car enthusiast by heart. 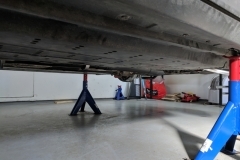 Having grown up at a small farm he spent most of his time in the garage repairing and tuning all sorts of vehicles together with his friends.